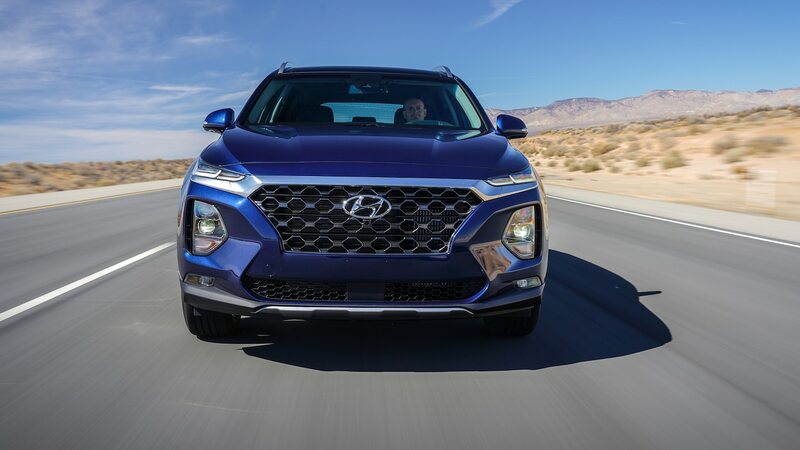 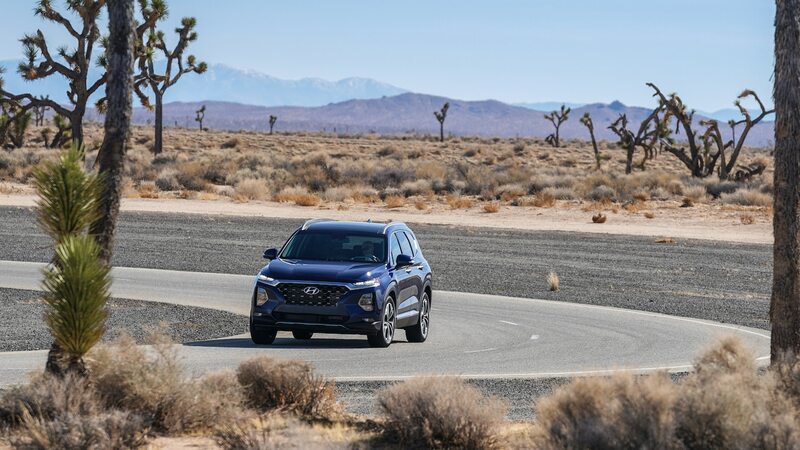 This “First Test” actually marks the second time we’ve tested these two 2019 Hyundai Santa Fe variants, but the first time out—at our 2019 SUV of the Year festivities—conditions were so beastly hot in our high desert test location that we didn’t fully trust our results. 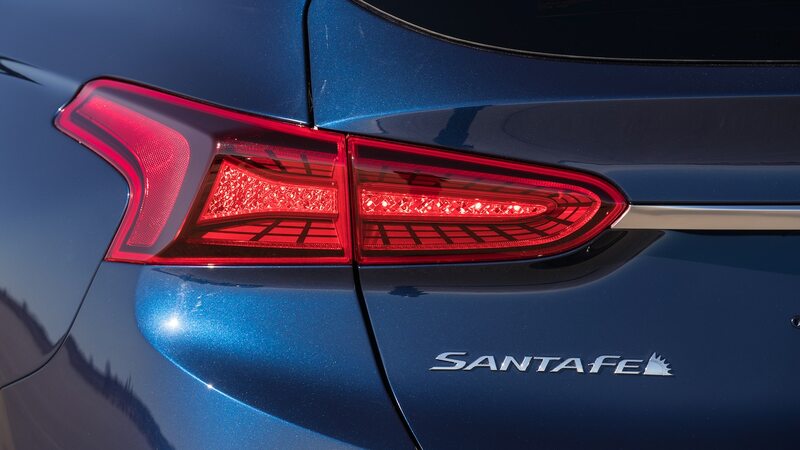 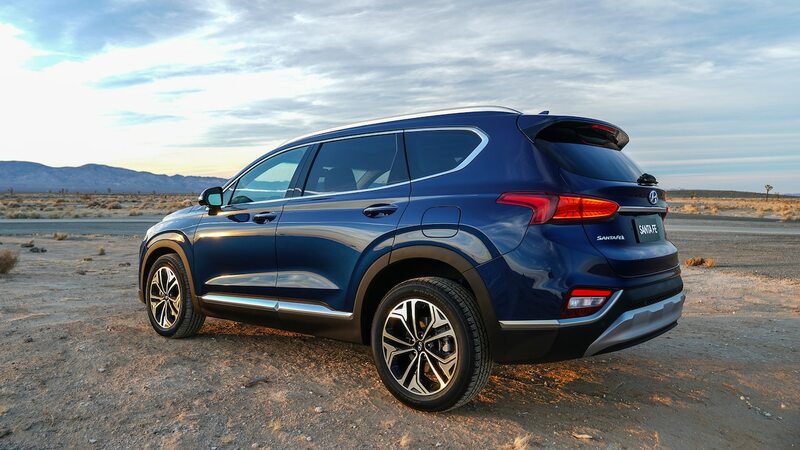 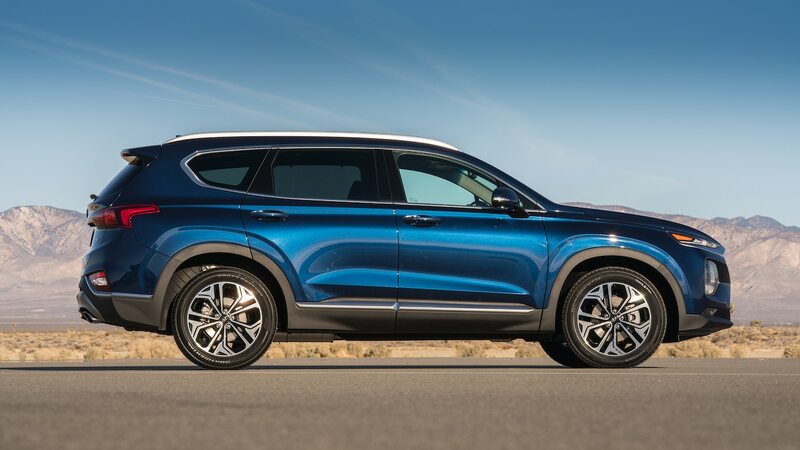 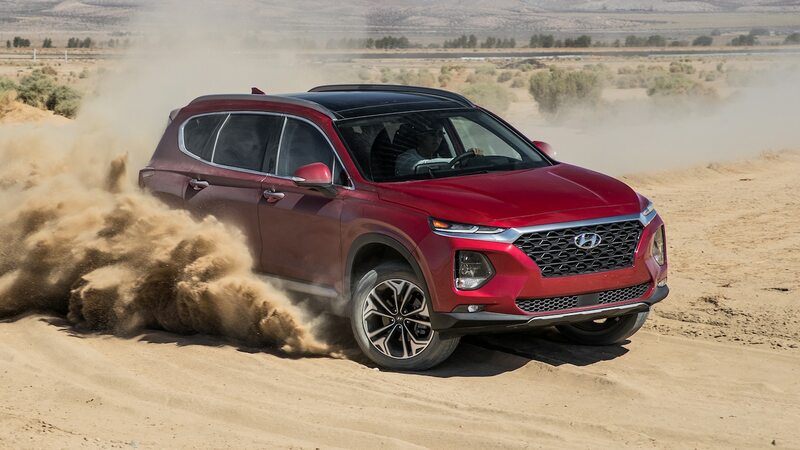 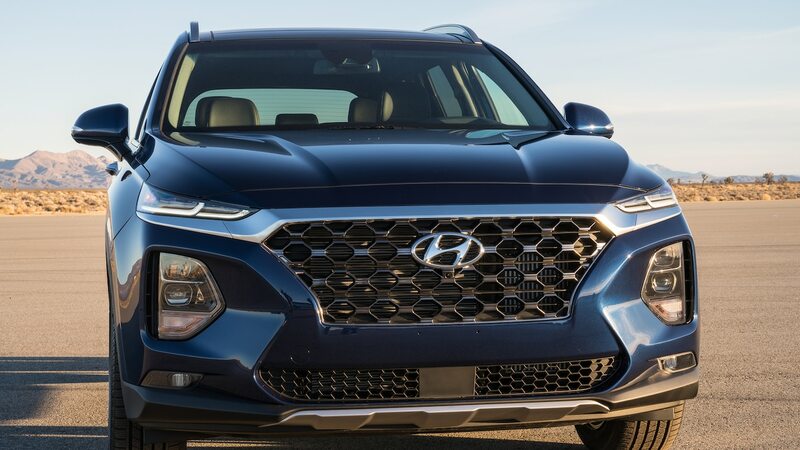 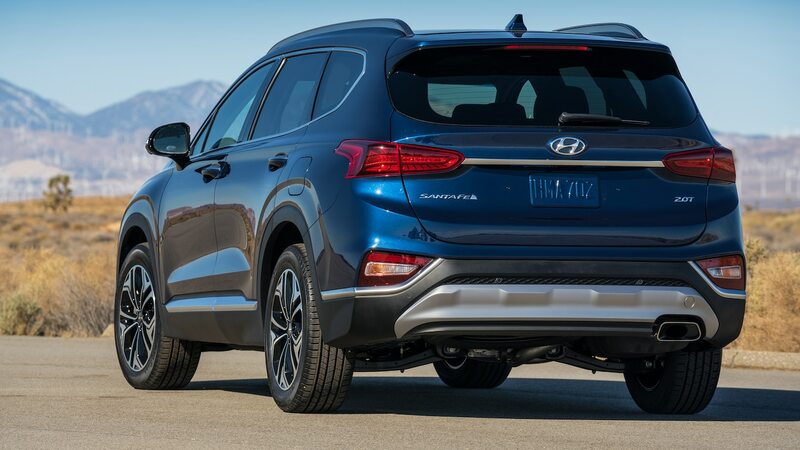 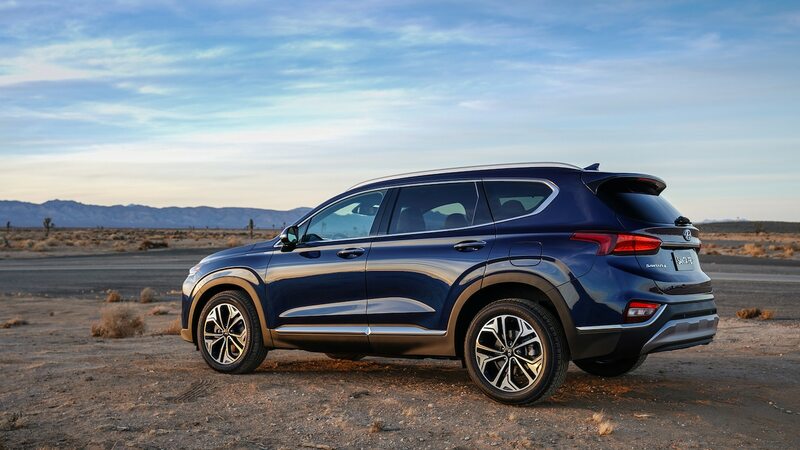 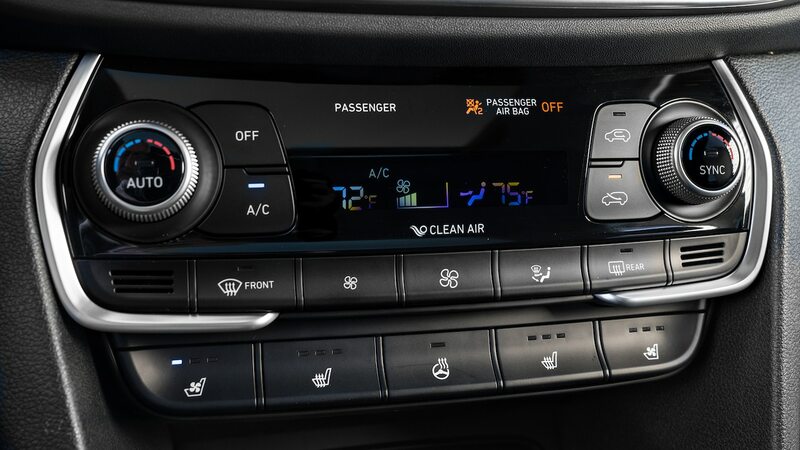 Sure enough, the evidence suggests our 2.0-liter turbo Santa Fe was suffering a major case of heat stroke in the 98-degree swelter and thin high desert air. 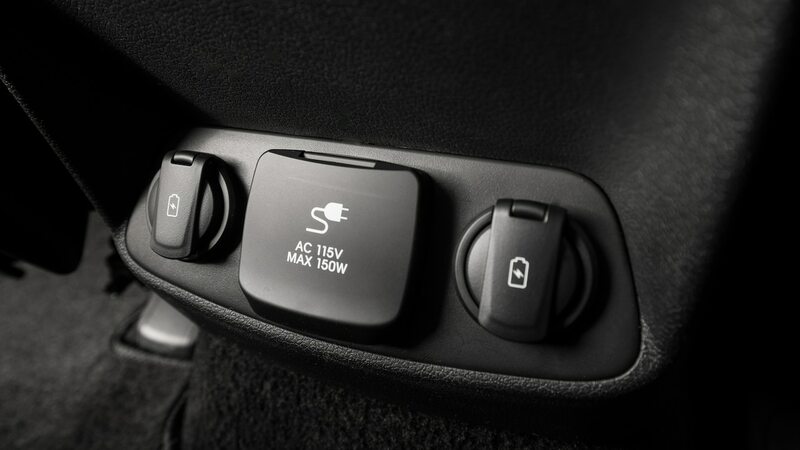 The SAE J1349 weather correction formula we use to normalize all test results to room temperature dry air at sea level conditions has proven to be impressively accurate at correcting for widely variable conditions on naturally aspirated cars. 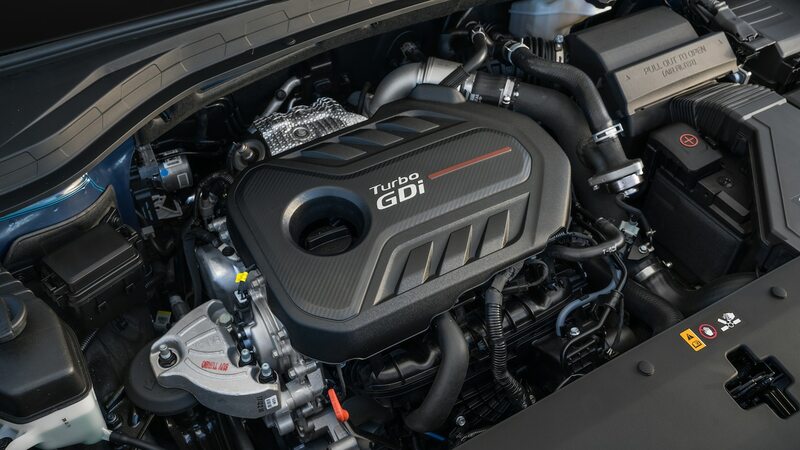 It’s also proven competent at correcting for reasonable temperature and pressure deviations on turbo- and supercharged vehicles and hybrids. 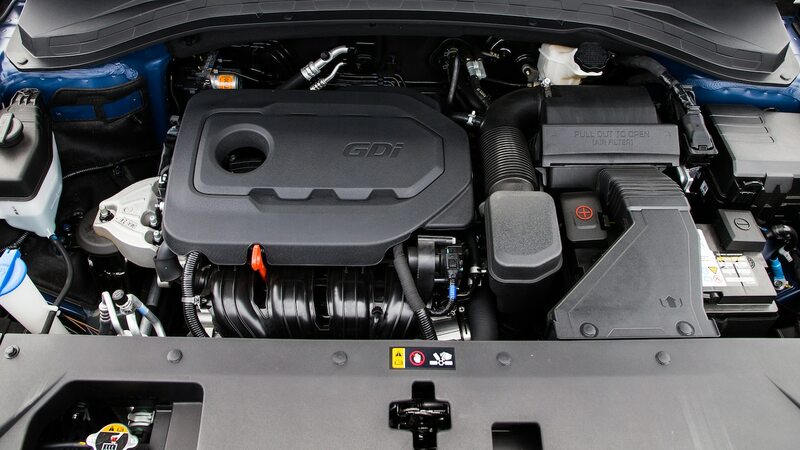 But when an engine and turbo intercooler circuit get too badly heat-soaked, the engine controller starts pulling spark advance to prevent knock, which is hard to compensate for with math. 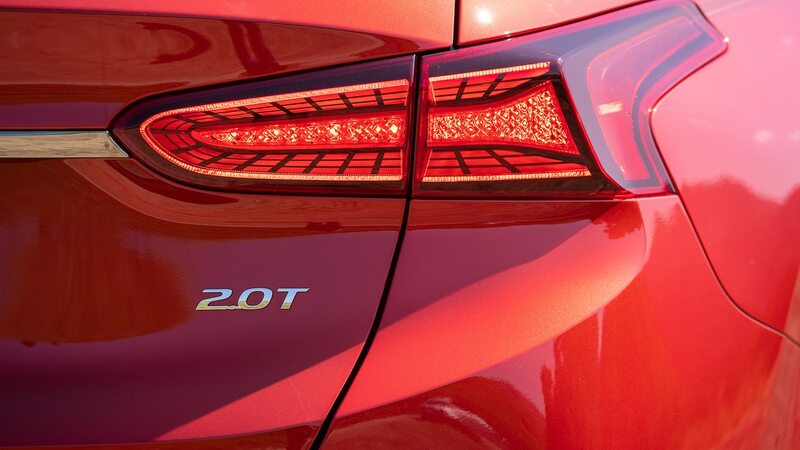 That’s when you end up with a 235-hp, 260-lb-ft turbocharged engine that can’t keep up with its 185-hp, 178-lb-ft naturally aspirated sibling. 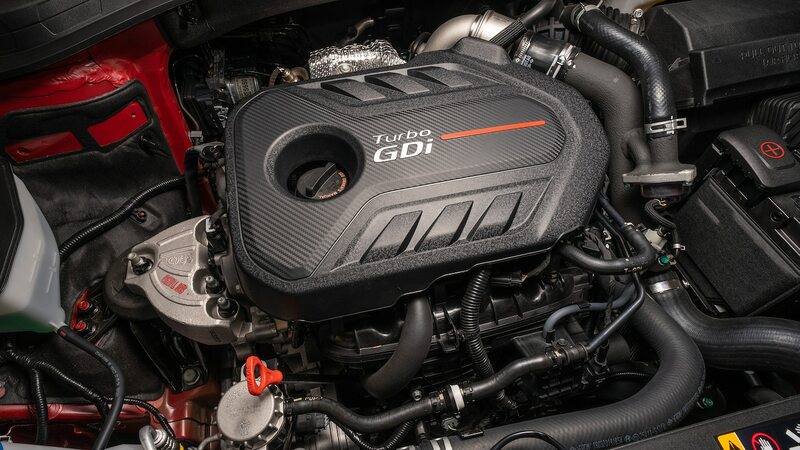 All vehicles tested were loaded to Ultimate trim spec, and both the hot and cool 2.0-liter turbos feature HTRAC all-wheel drive while the 2.4-liter naturally aspirated cars are both front-driven. 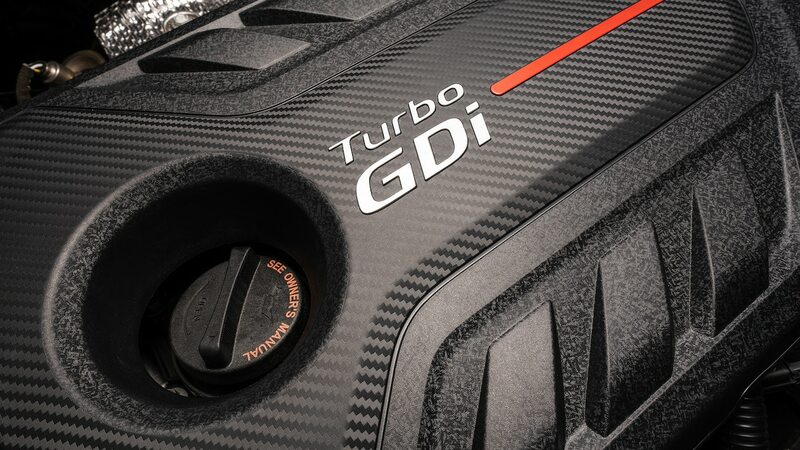 Despite still enjoying a 3.5-pounds-per-horsepower advantage on paper, in the desert the turbo trailed the 2.4-liter by 0.7 second to 60 mph (9.6 versus 8.9 seconds) and by 0.4 second and 1.5 mph (2.4 km/h) through the quarter mile (17.1 seconds at 82.8 mph (133.2 km/h) versus 16.7 at 84.3 (135.7 km/h)). 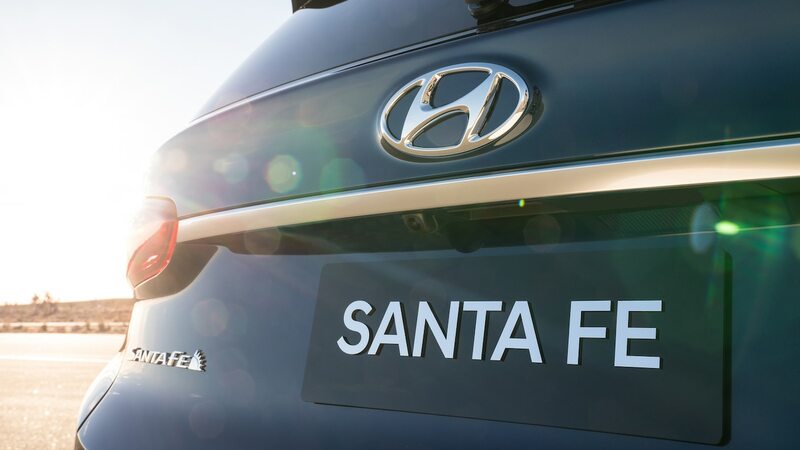 The results of our winter test session at California Speedway reverse that outcome, with the turbo beating its down-market sibling to 60 mph by 0.8 second (7.8 versus 8.6 seconds) and by 0.5 second and 4.4 mph (7 km/h) in the quarter (16.0 seconds at 88.9 mph (143 km/h) versus 16.5 at 84.5 (136 km/h)). 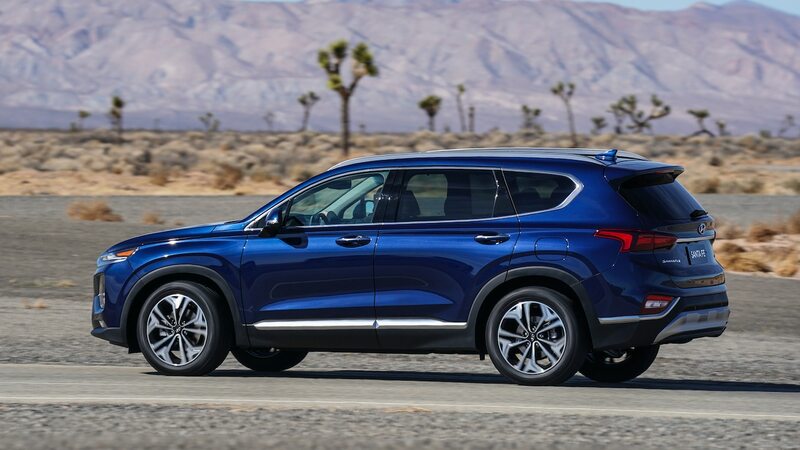 Was the desert turbo’s poor performance entirely attributable to inadequate weather correction, or were other electronic or mechanical gremlins to blame? 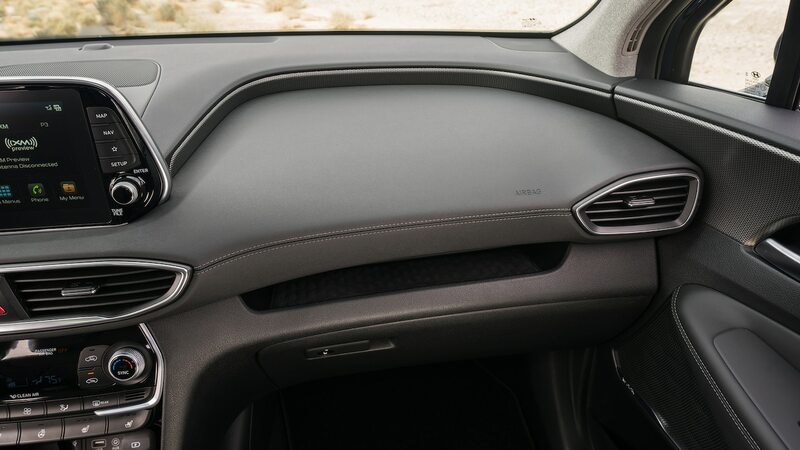 We may never know. 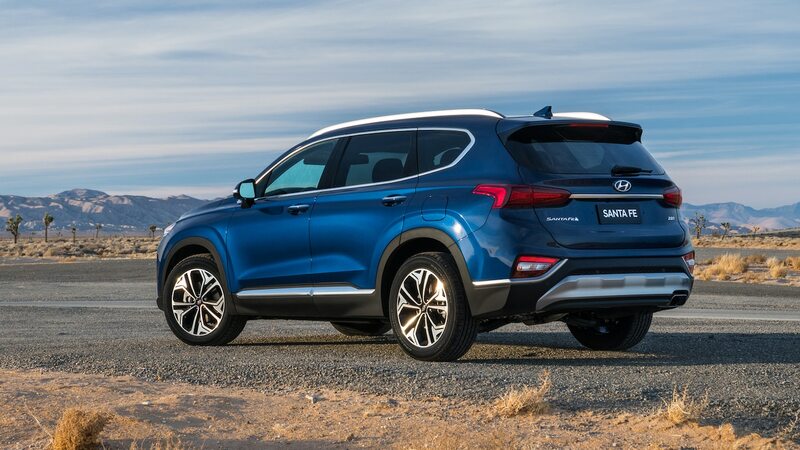 What we can say with greater certainty now is that the Santa Fe probably won’t win many drag races against its competitors in this burgeoning class of crossovers that are slightly larger and more substantial than the Tucson/RAV4/CR-V compacts without featuring third-row seating. 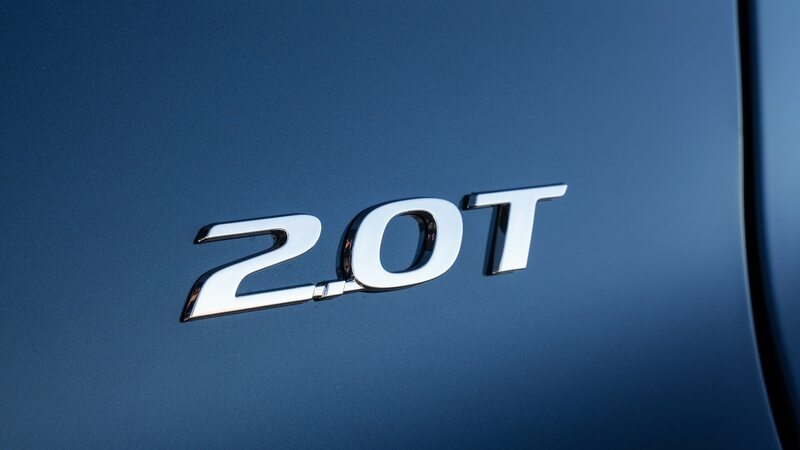 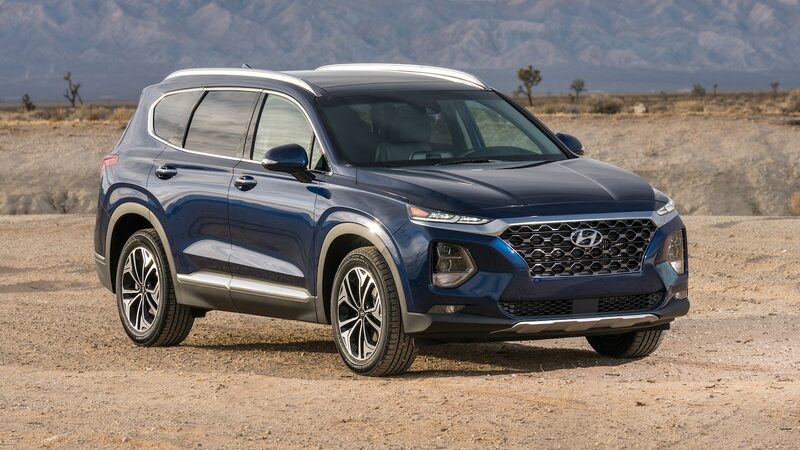 (Hyundai had planned to sell a Santa Fe diesel with a tiny third row, but that idea has been shelved.) 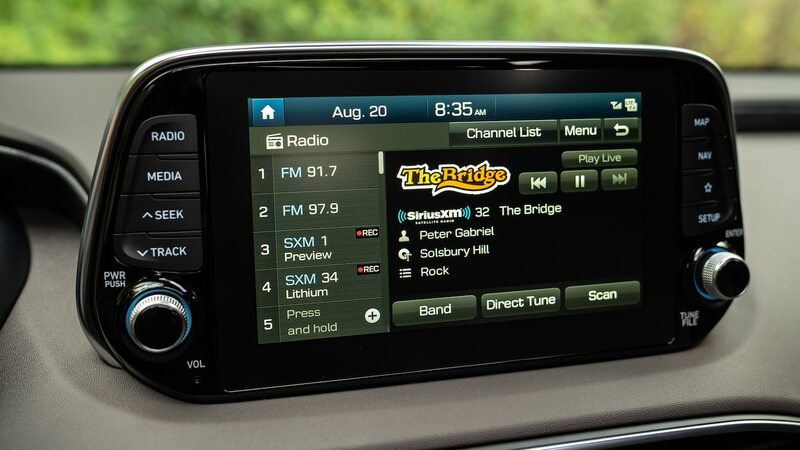 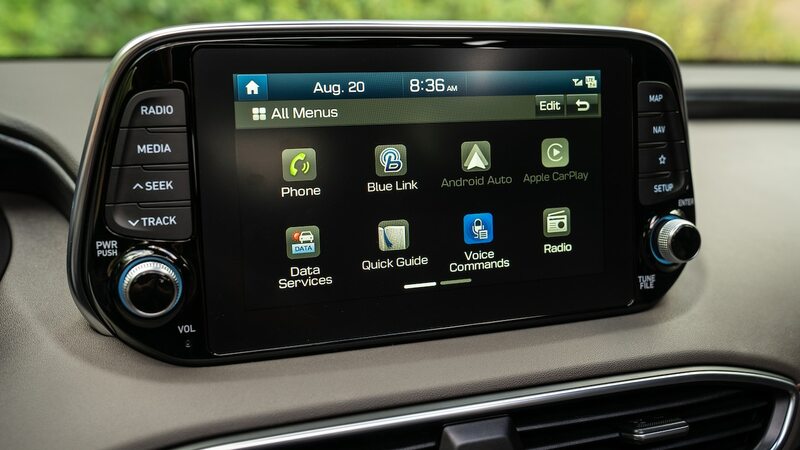 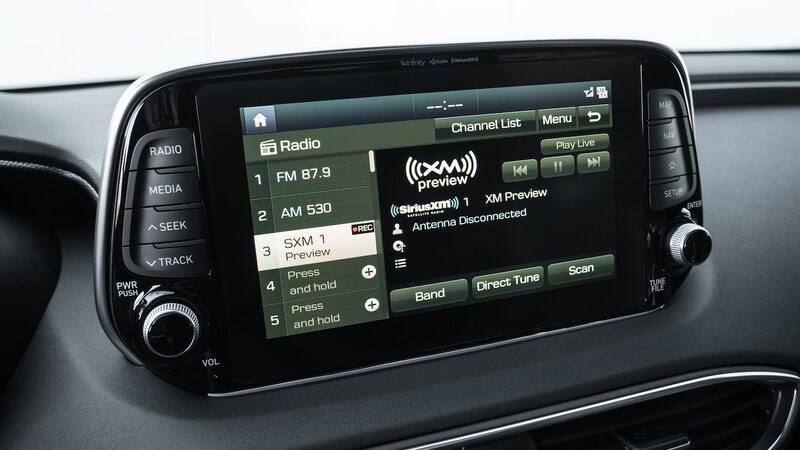 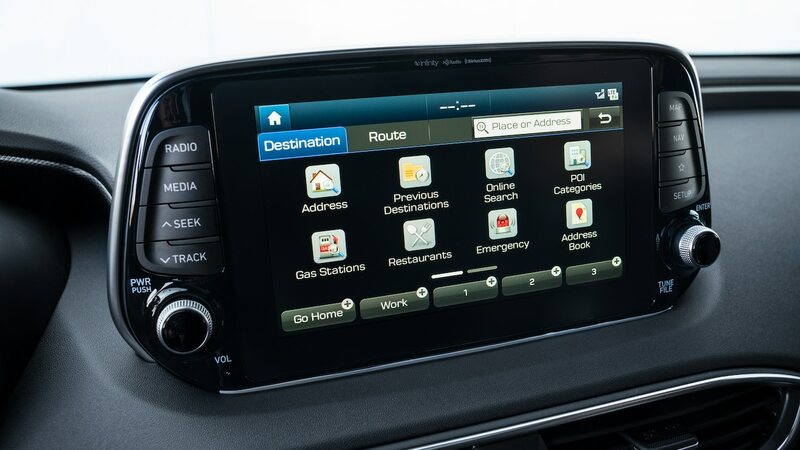 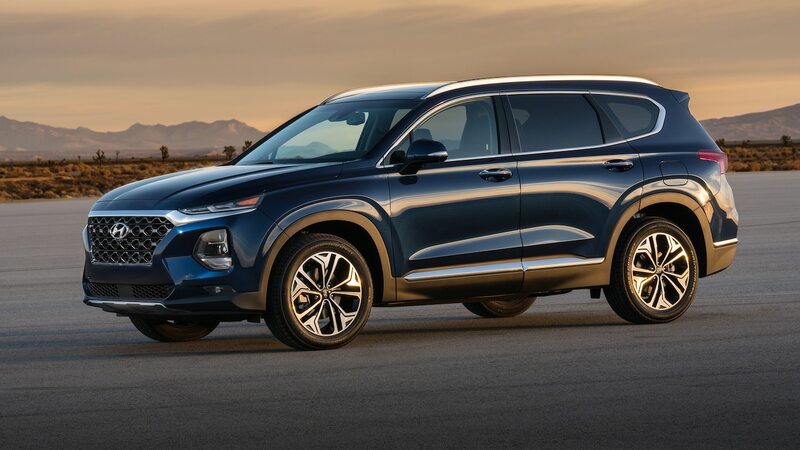 Prime competitors now include the Ford Edge and Nissan Murano, with the Chevy Blazer and Honda Passport arriving soon. 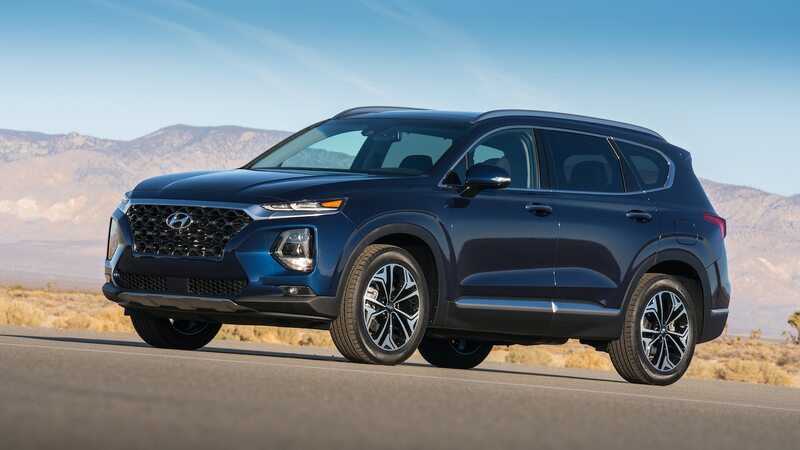 Size- and/or price-wise the Kia Sorento and Dodge Journey could also be considered, though each offers a vestigial third row. 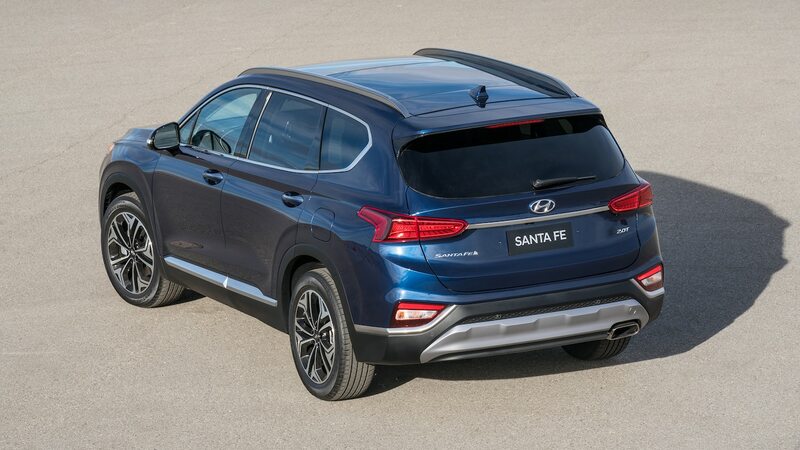 On the handling front, the Santa Fe turbo’s lighter weight stands it in pretty good stead. 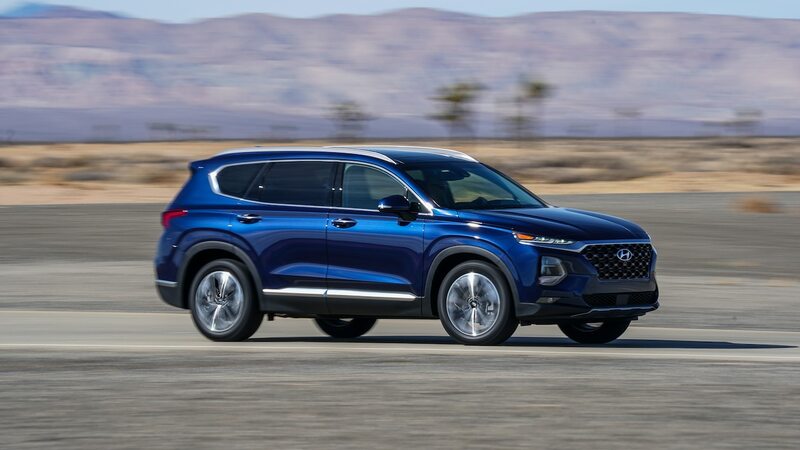 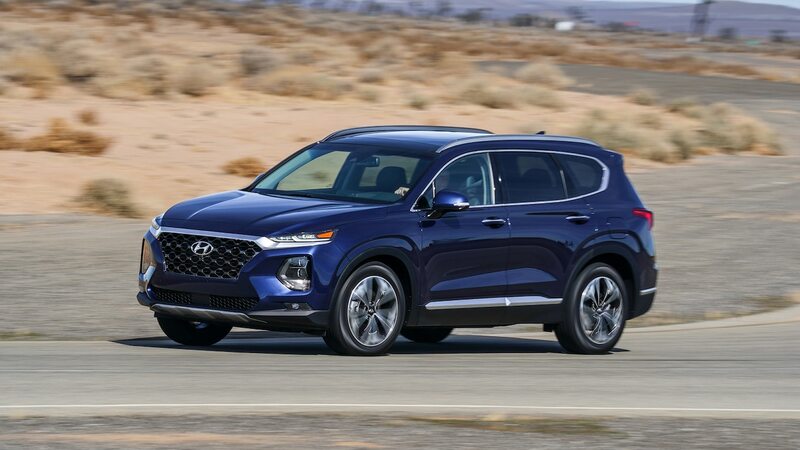 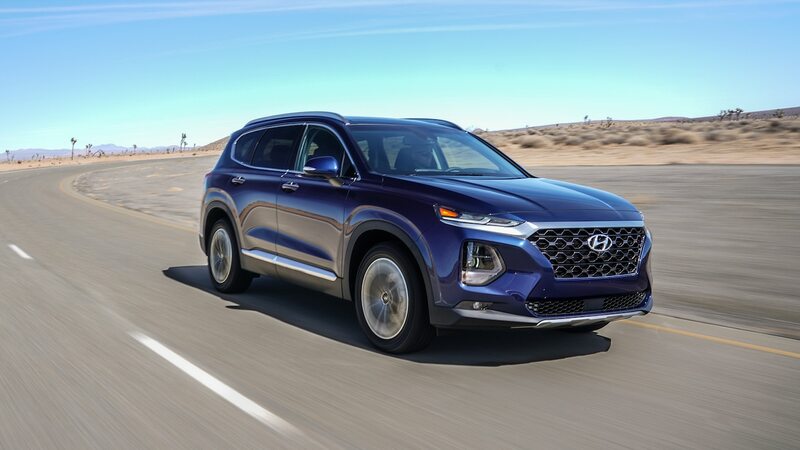 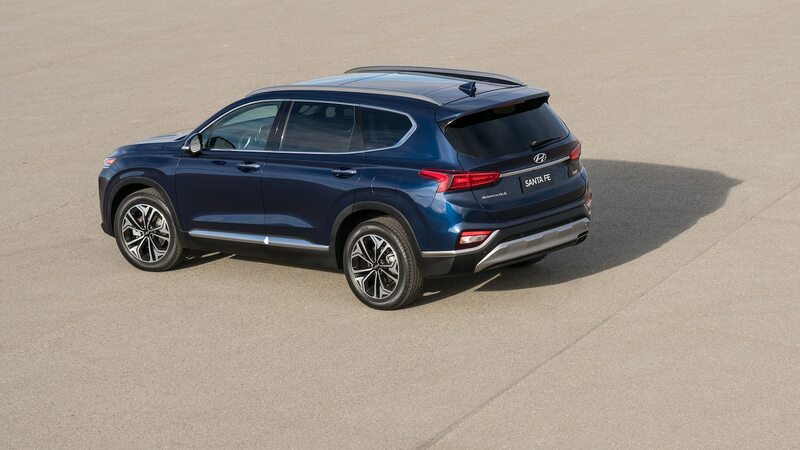 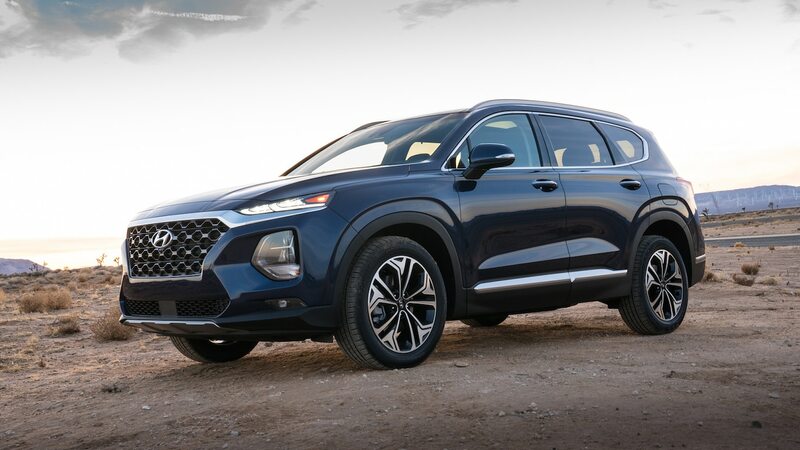 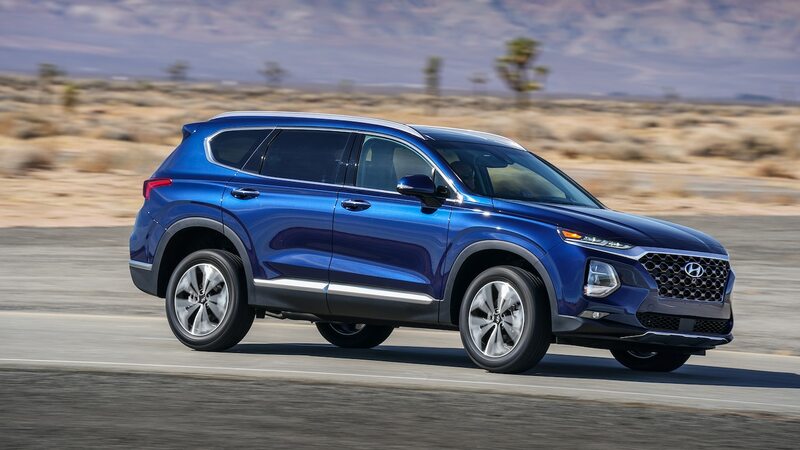 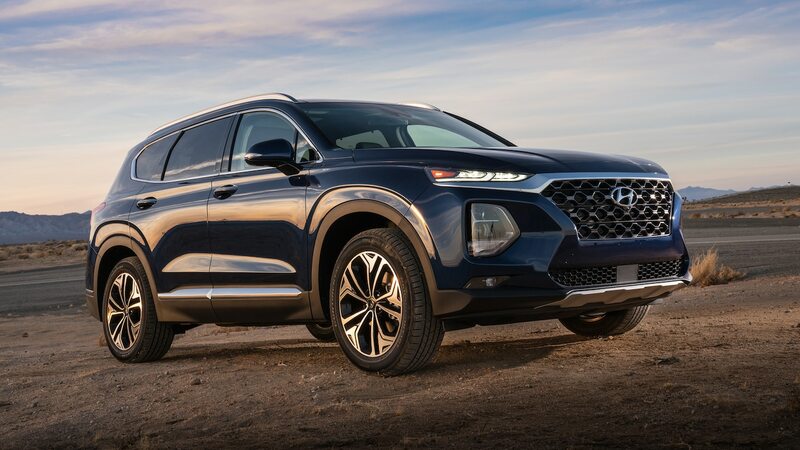 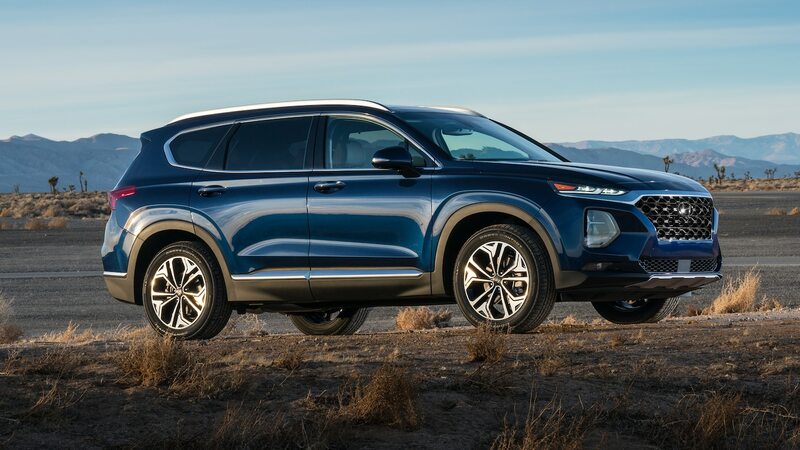 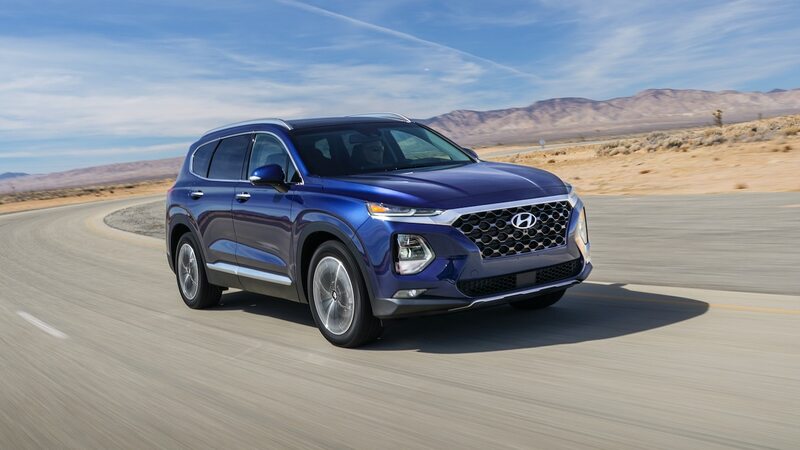 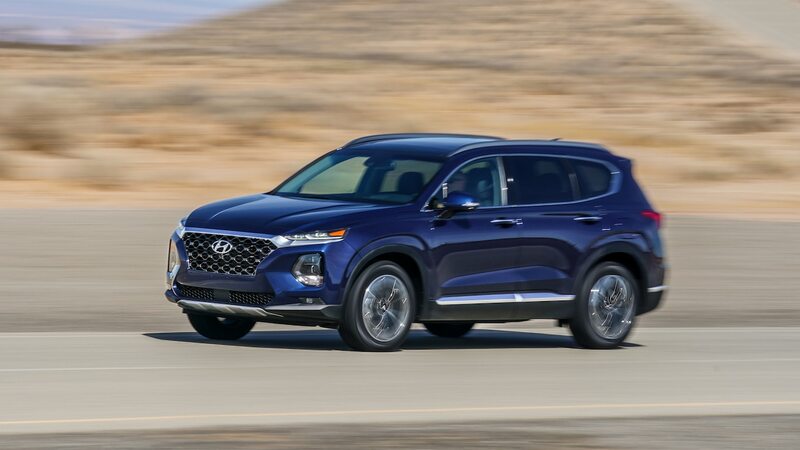 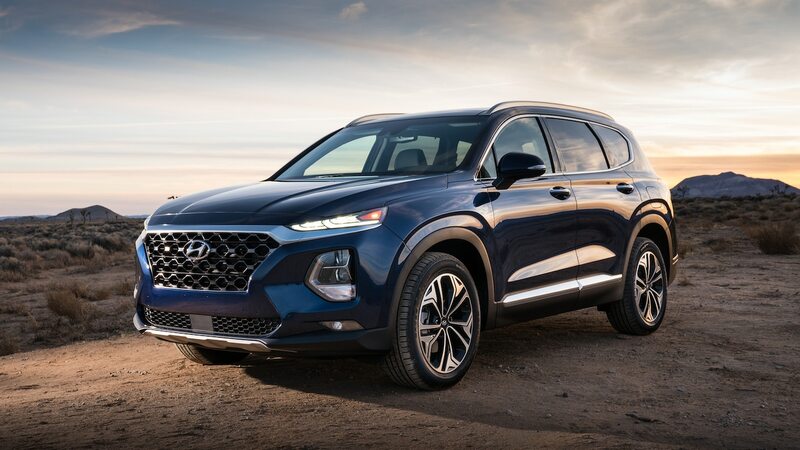 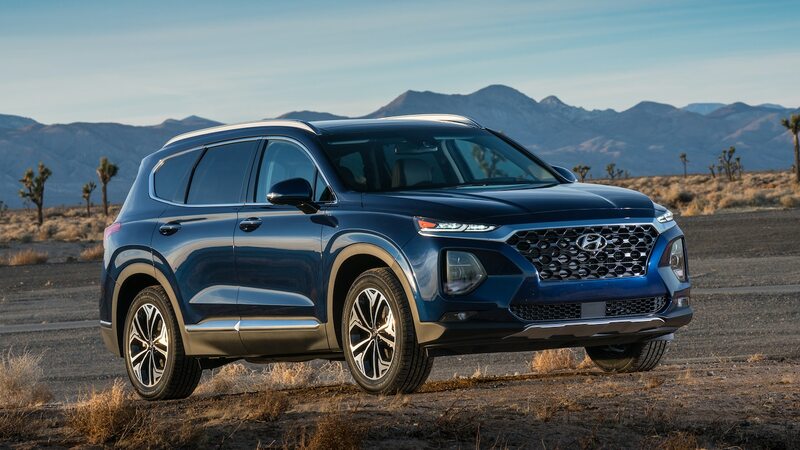 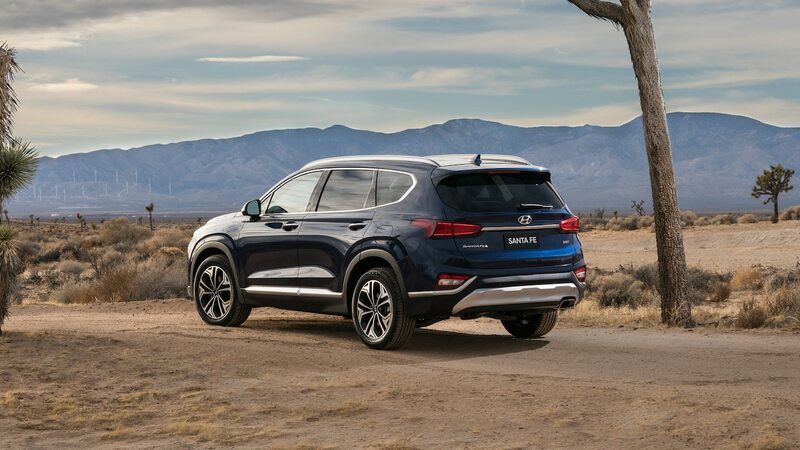 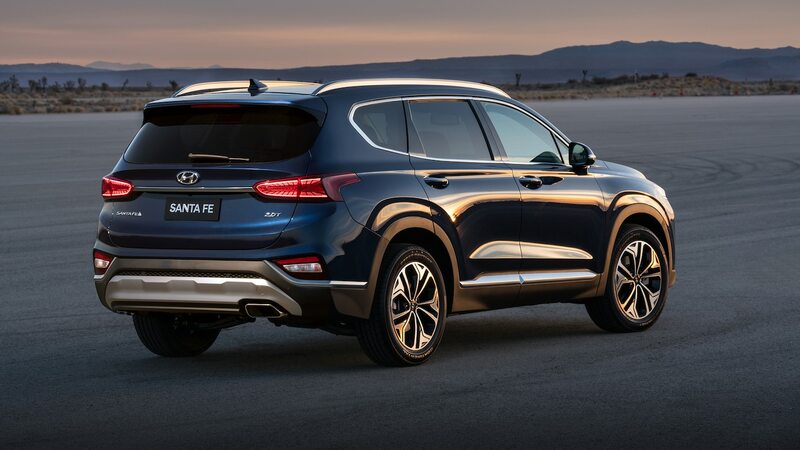 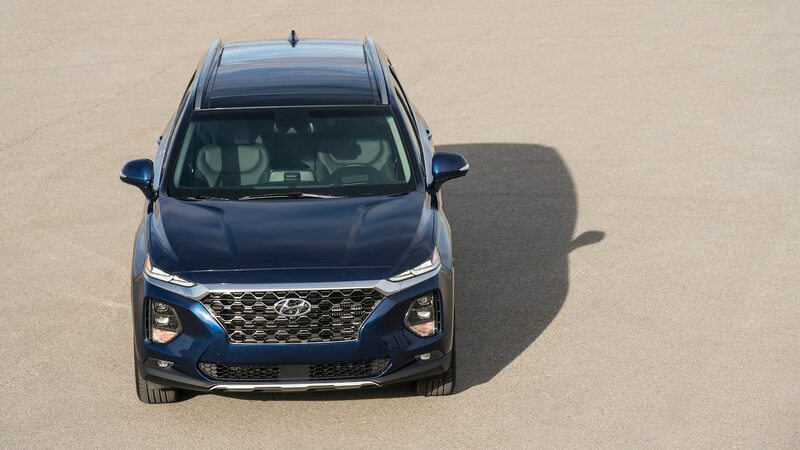 The Santa Fe 2.0 outruns the mainstream Muranos and Edges around our figure-eight course with a 27.2-second elapsed time at an average g-vector of 0.63. 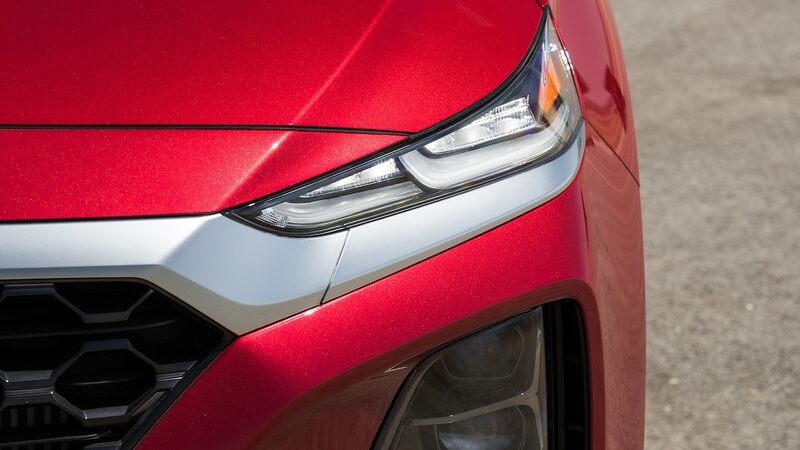 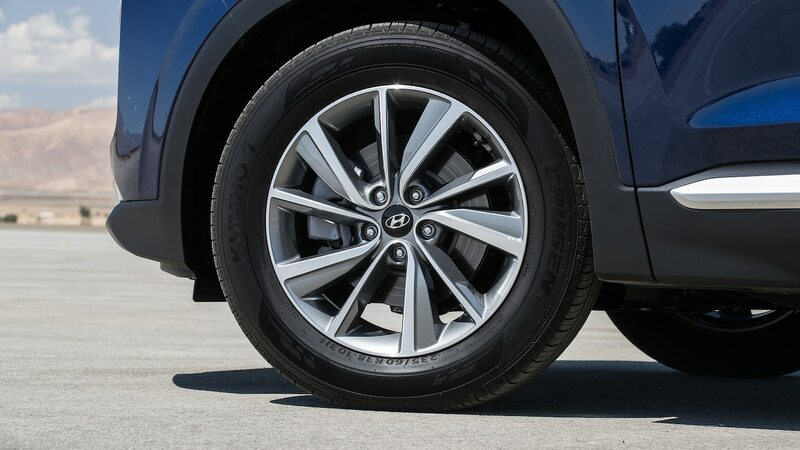 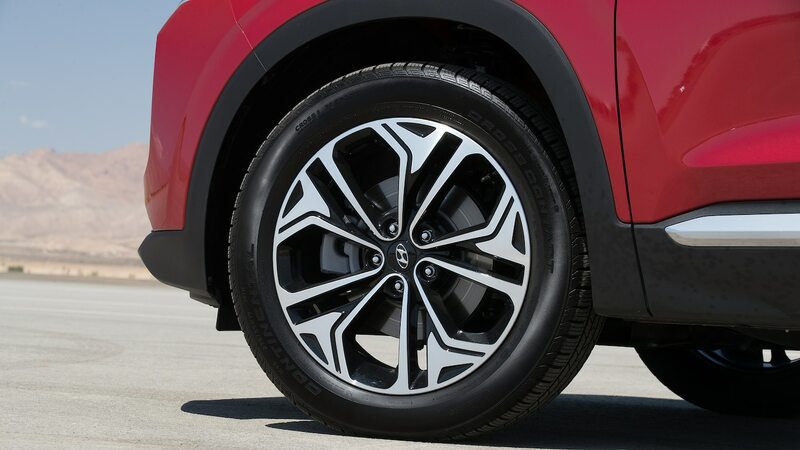 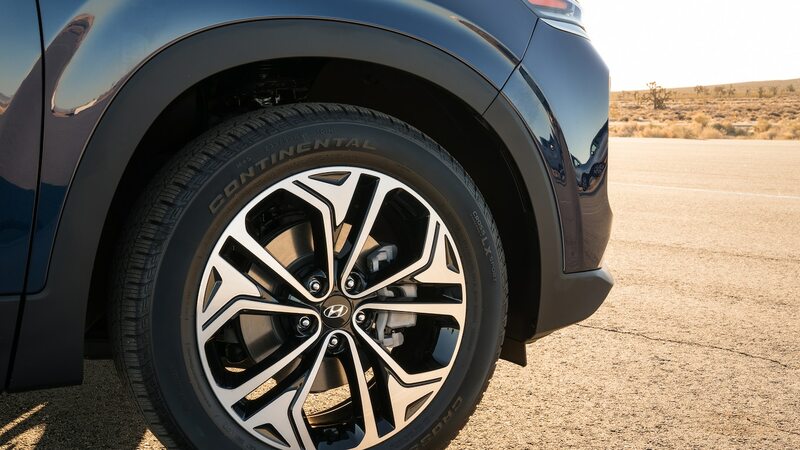 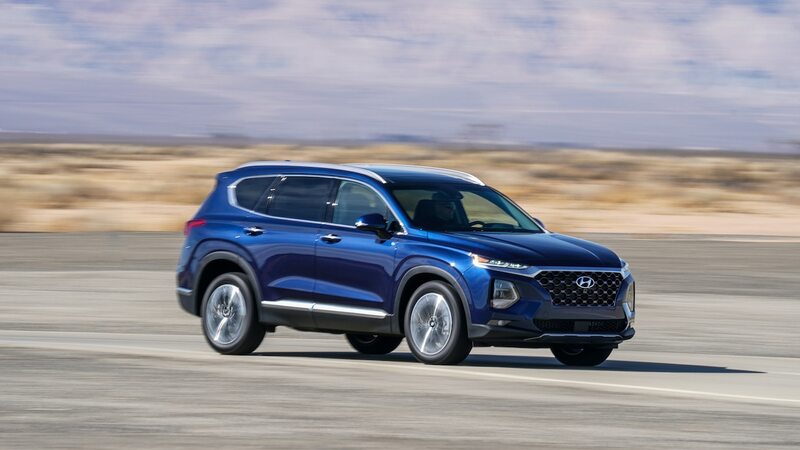 (The Edge ST does the circuit in 26 flat at 0.70 g.) The pokier front-drive Santa Fe 2.4 on taller sidewalls (60-series 18s versus the 2.0T’s 55-series 19s) registered a back-of-the-pack 28.9-second, 0.58g lap time. 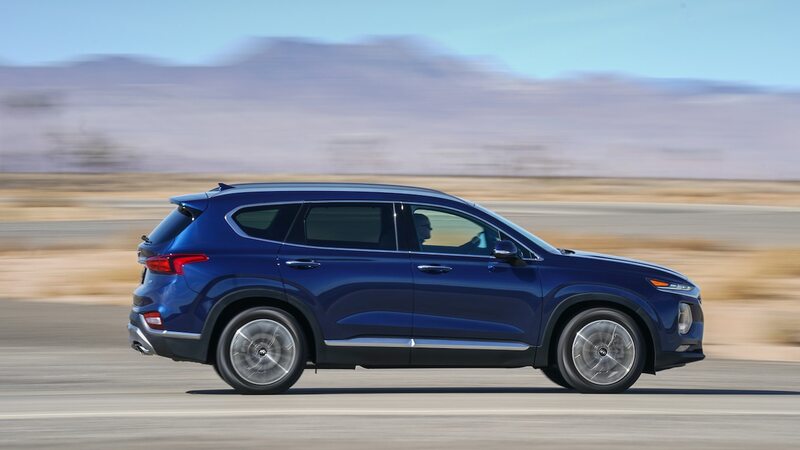 Again, subjectively several editors found fault with the slow response and “fake torque” feel in both variants’ steering during lane-change maneuvers, and our figure-eight driver Walton reported copious body roll in both variants. 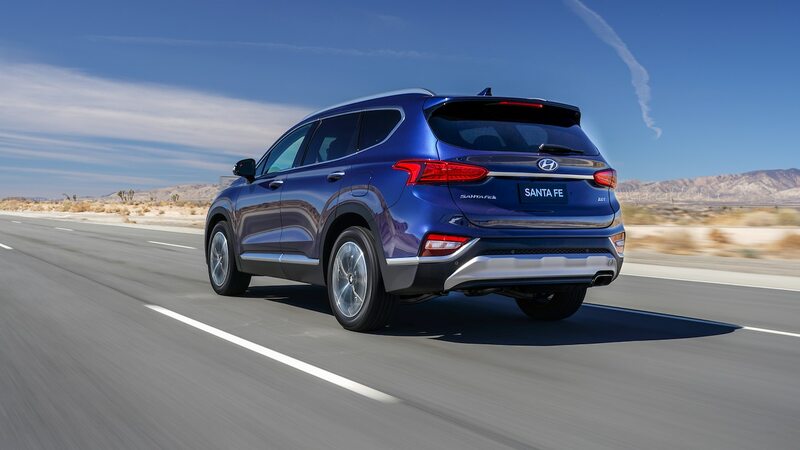 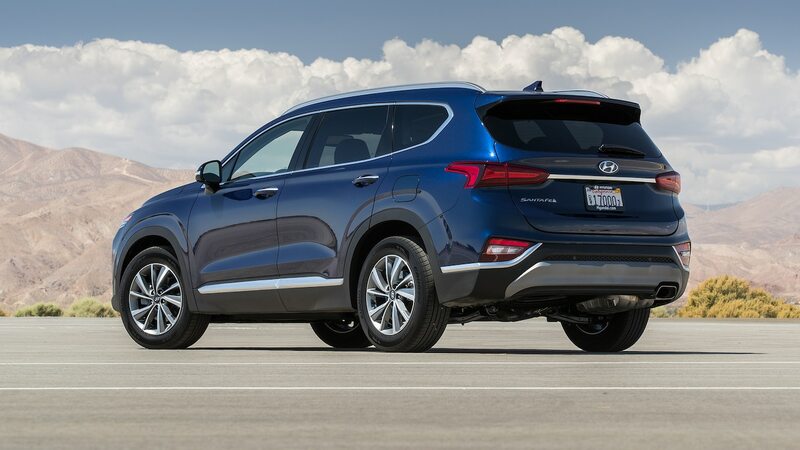 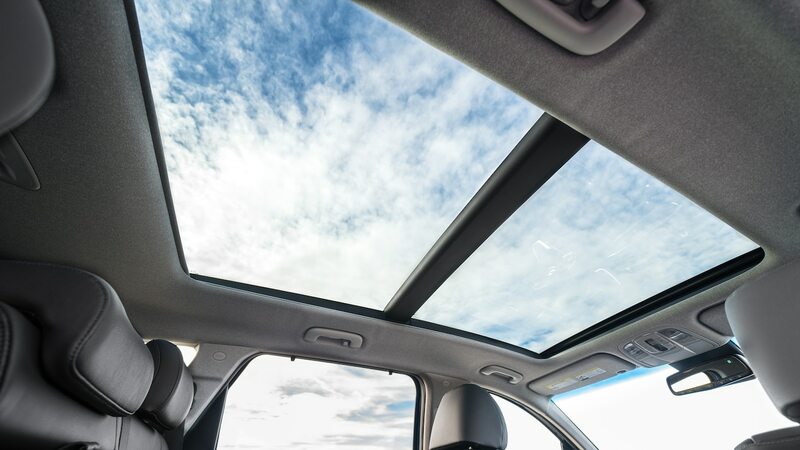 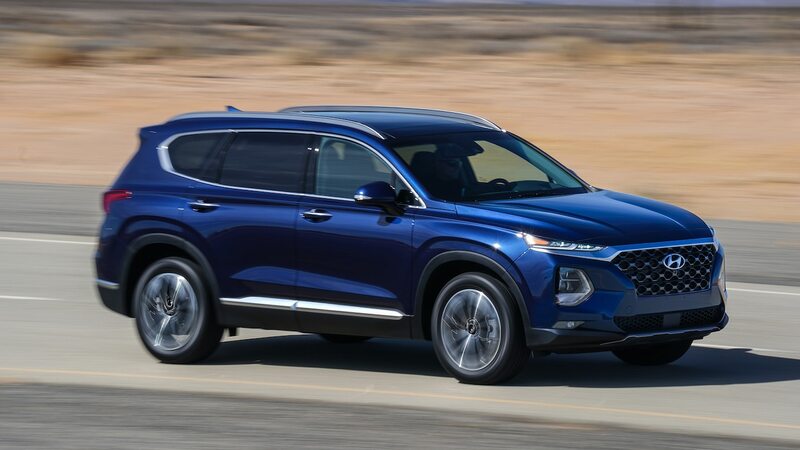 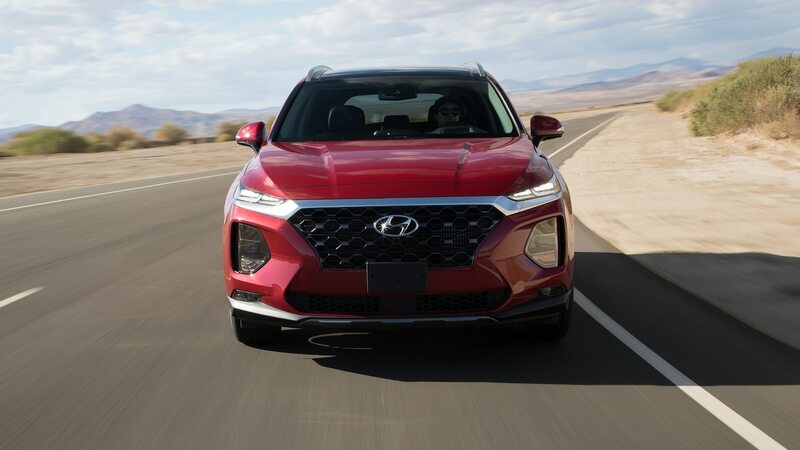 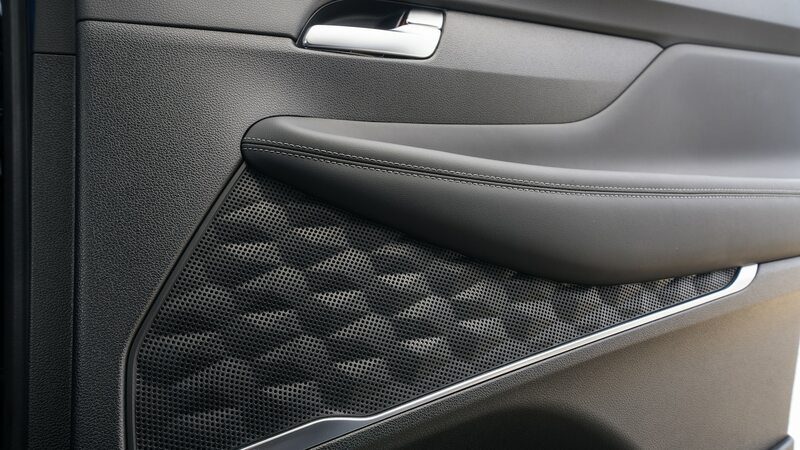 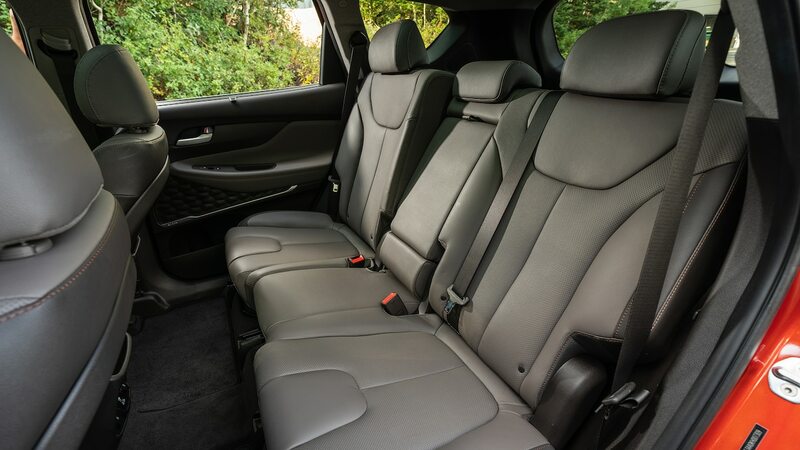 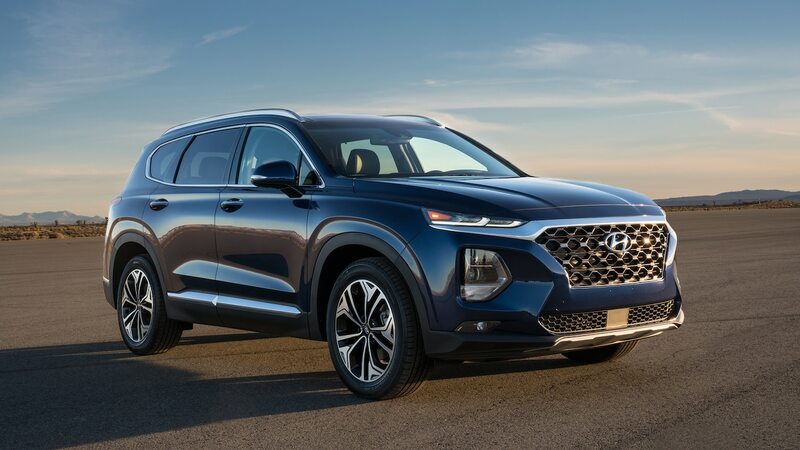 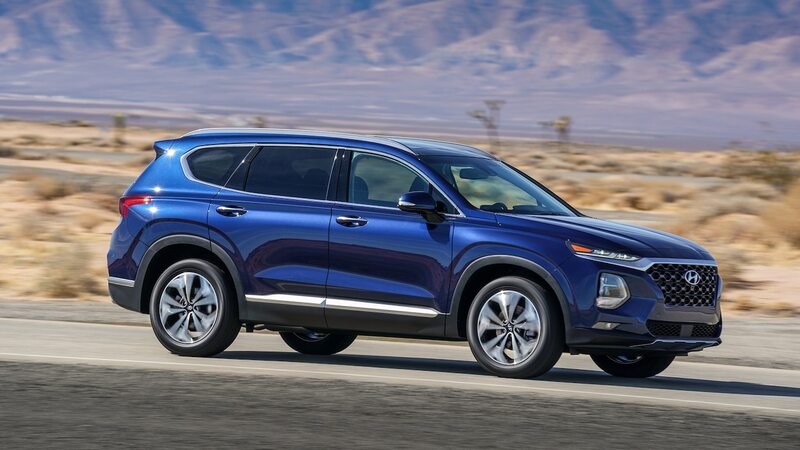 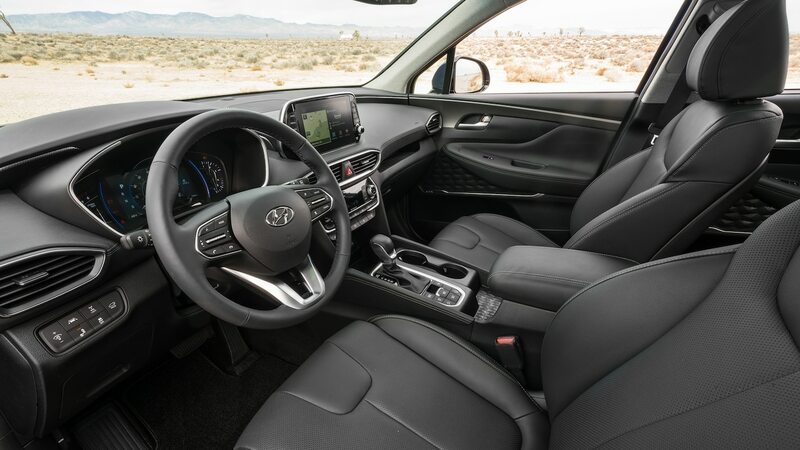 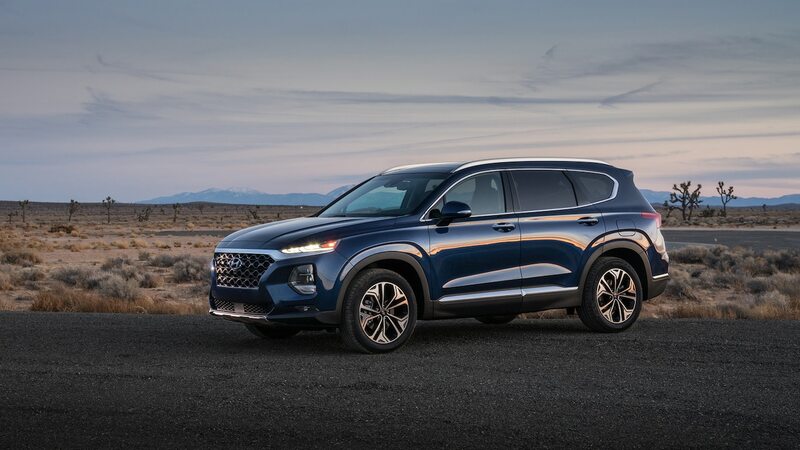 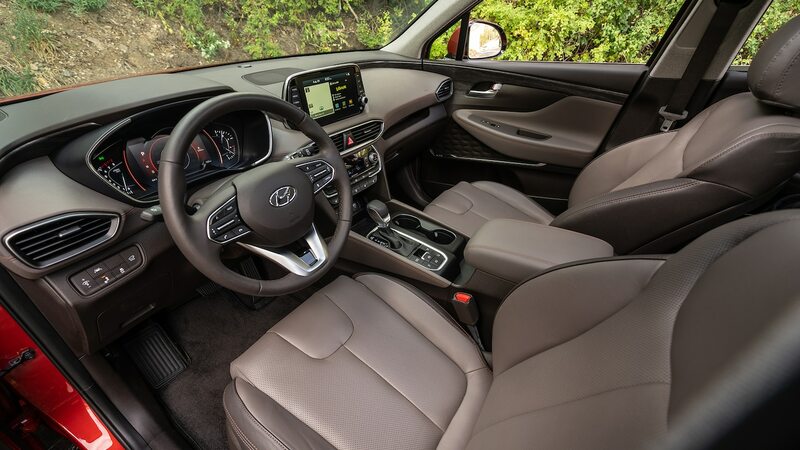 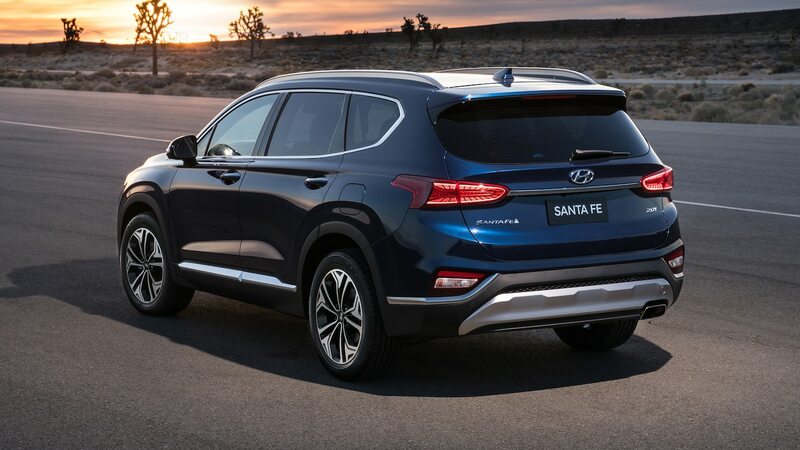 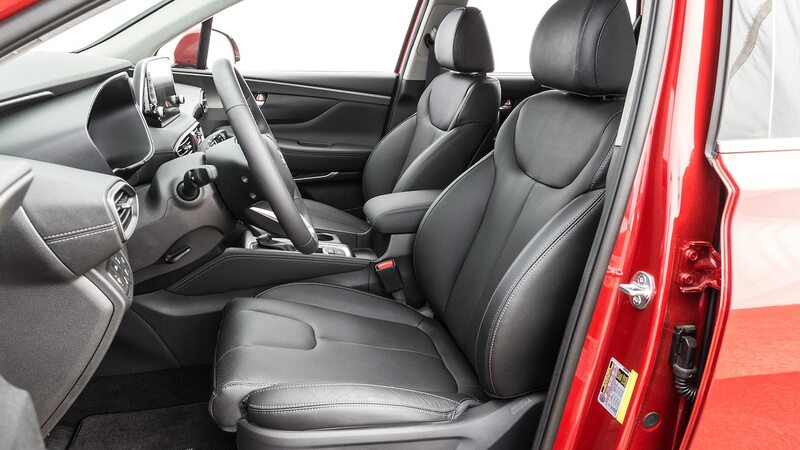 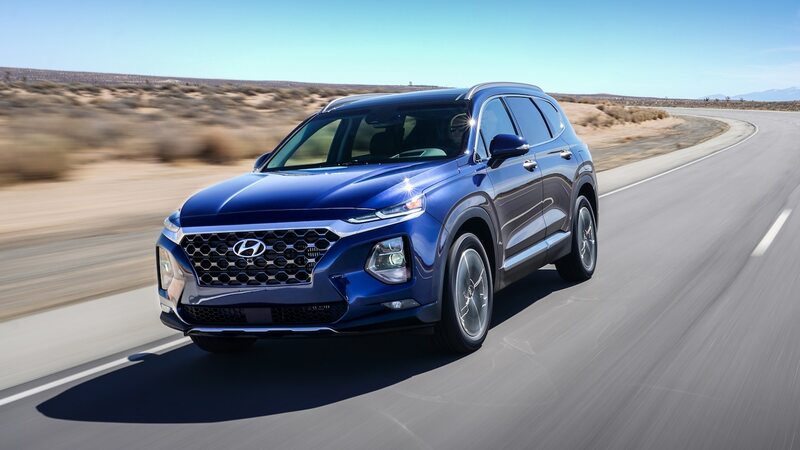 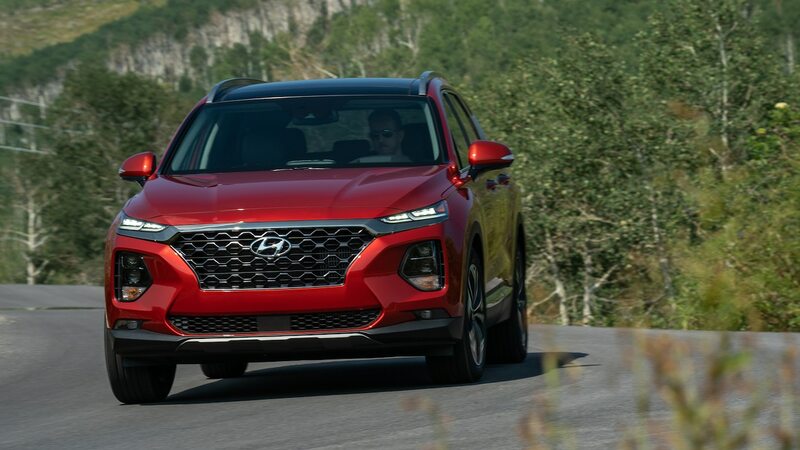 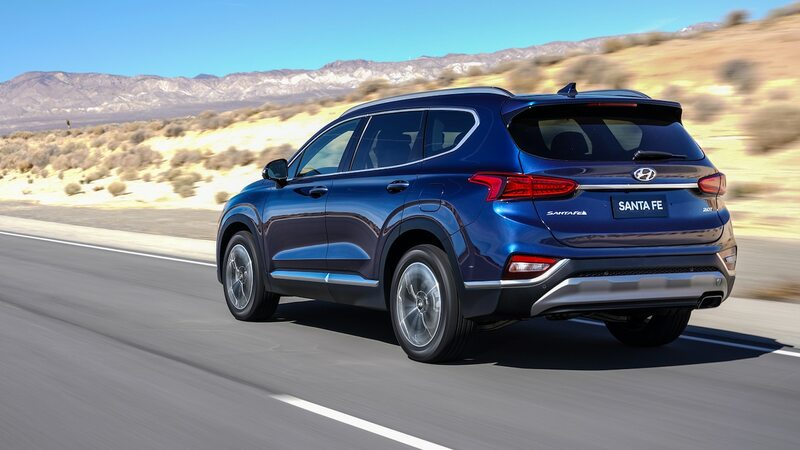 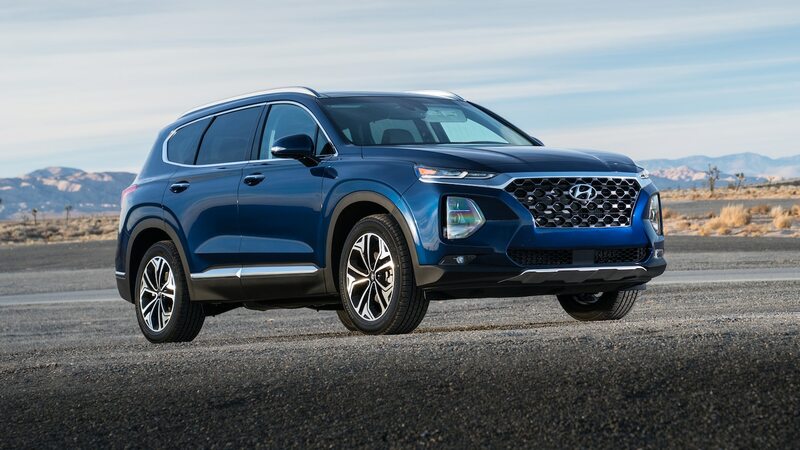 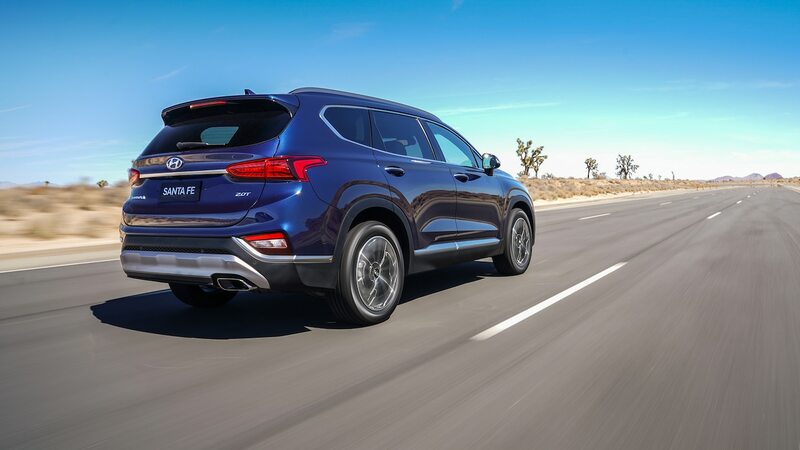 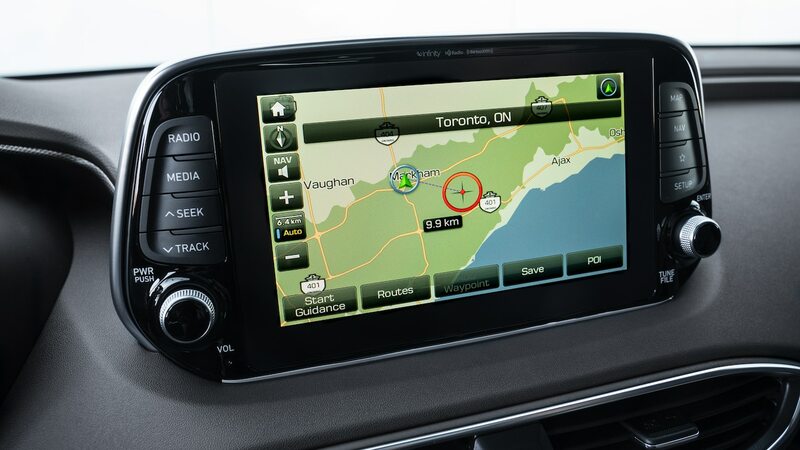 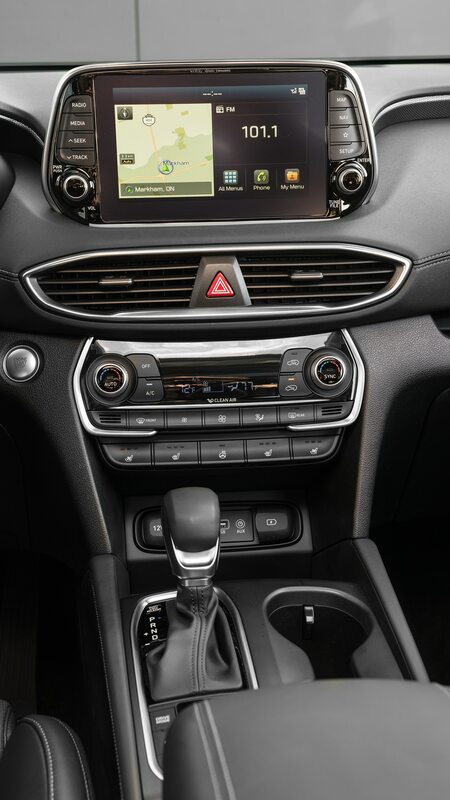 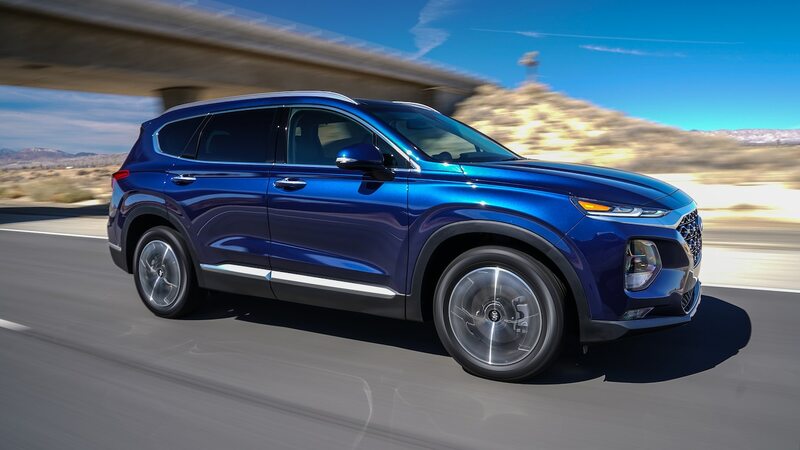 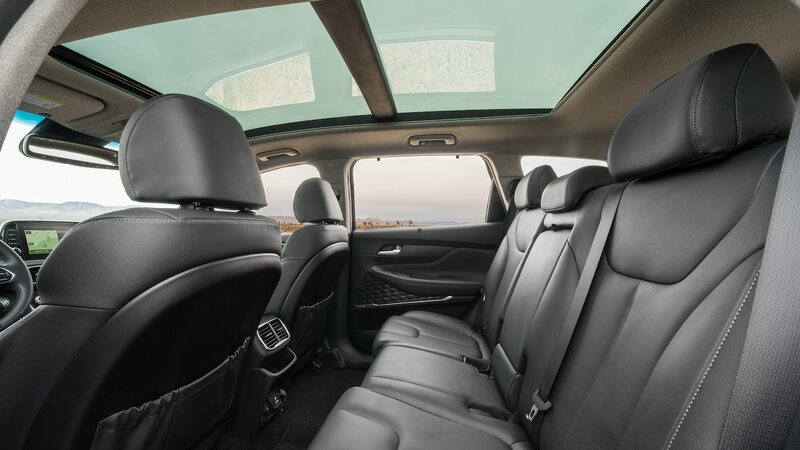 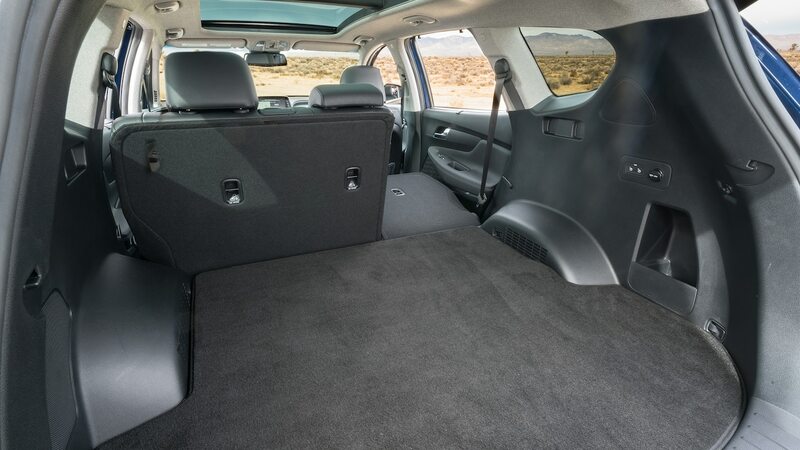 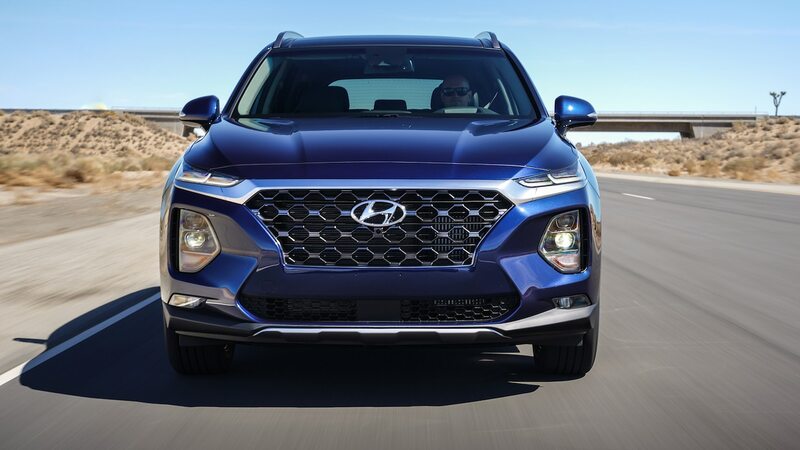 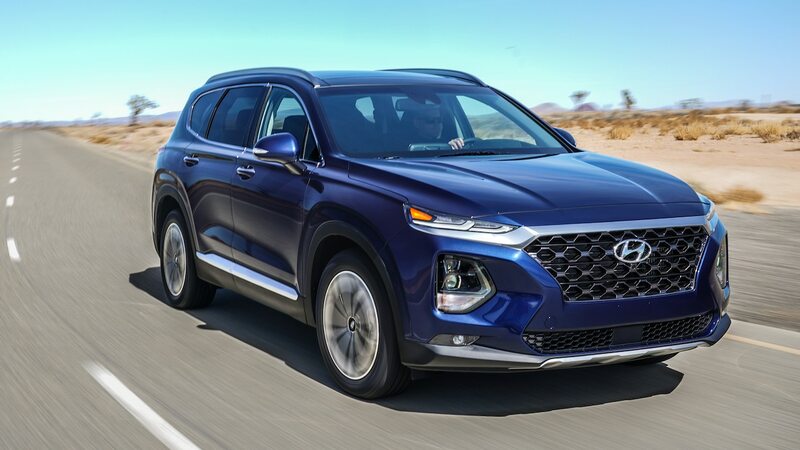 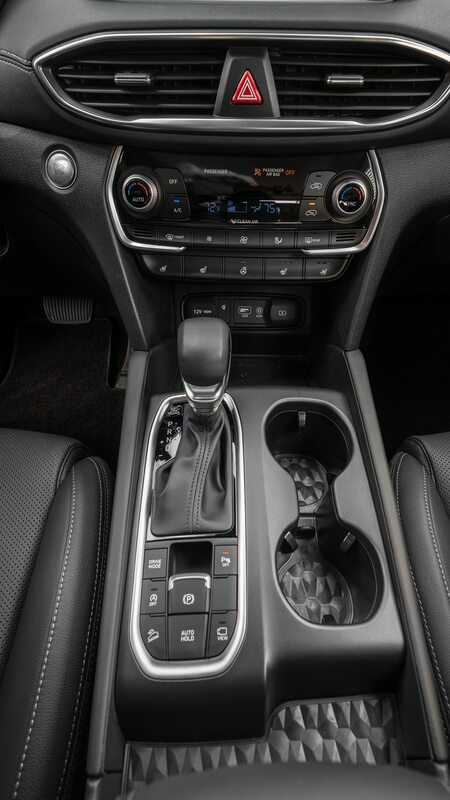 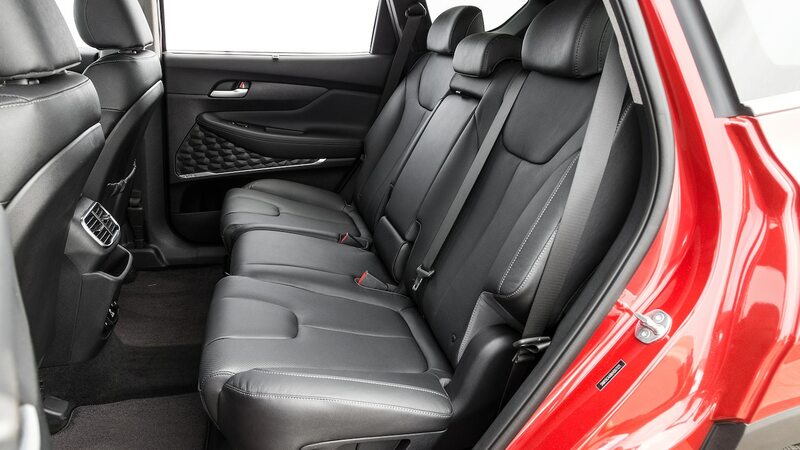 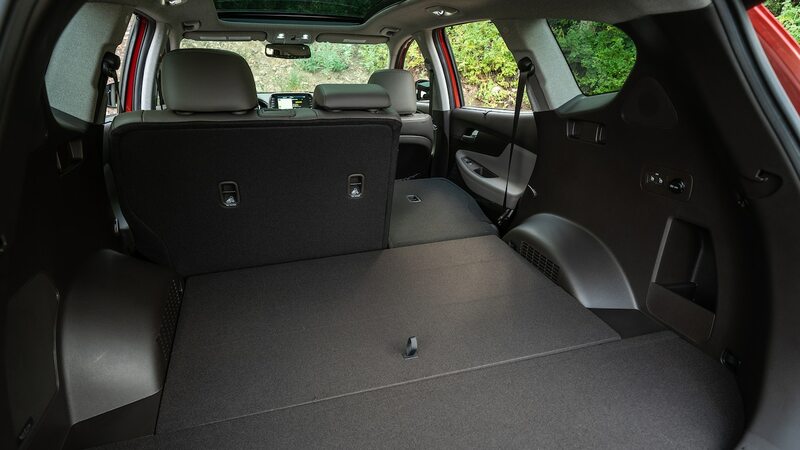 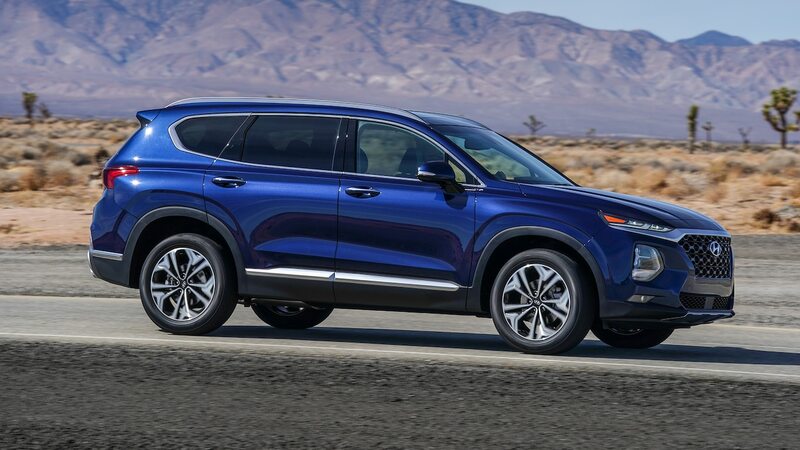 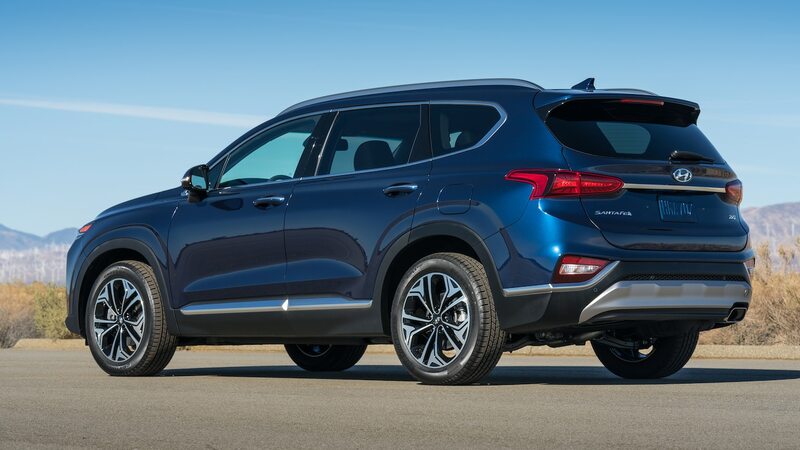 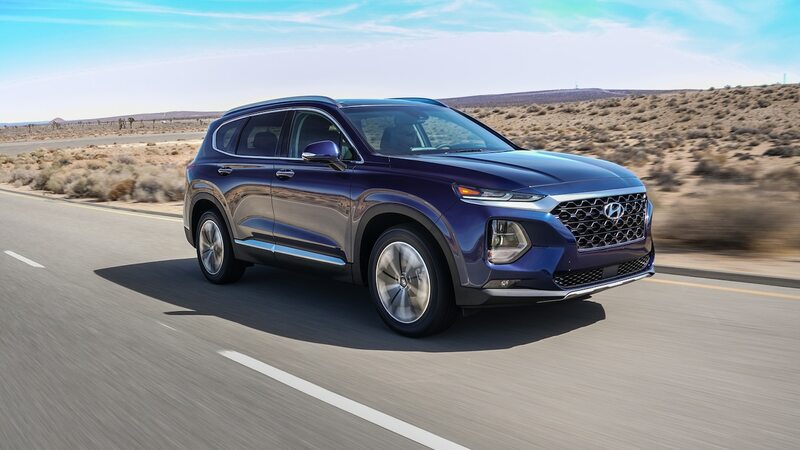 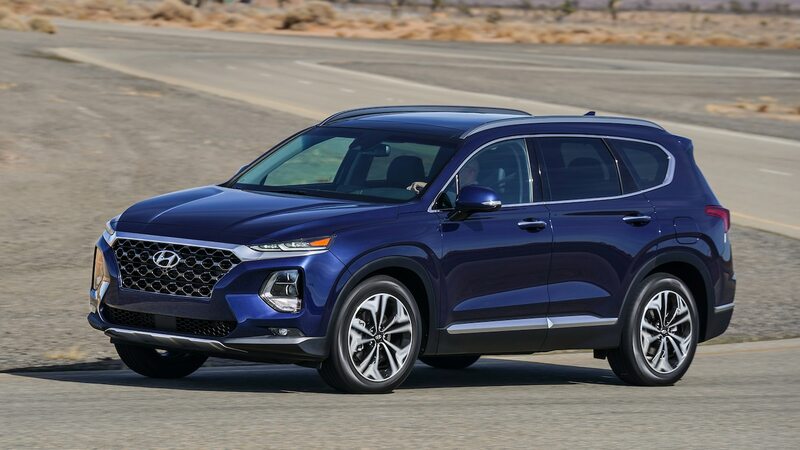 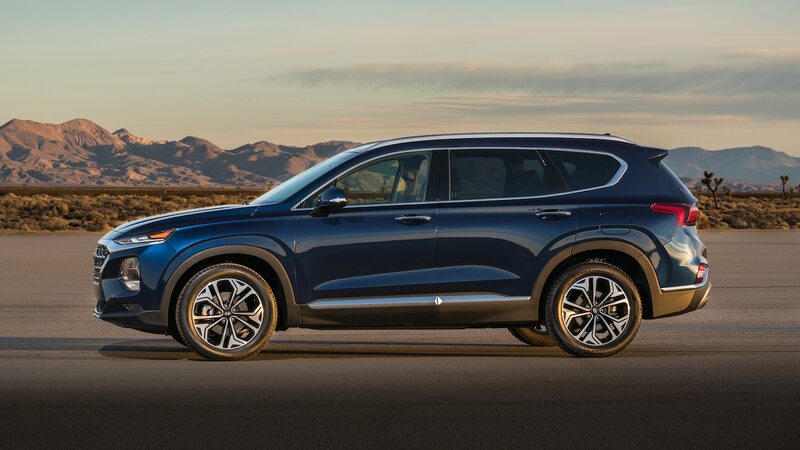 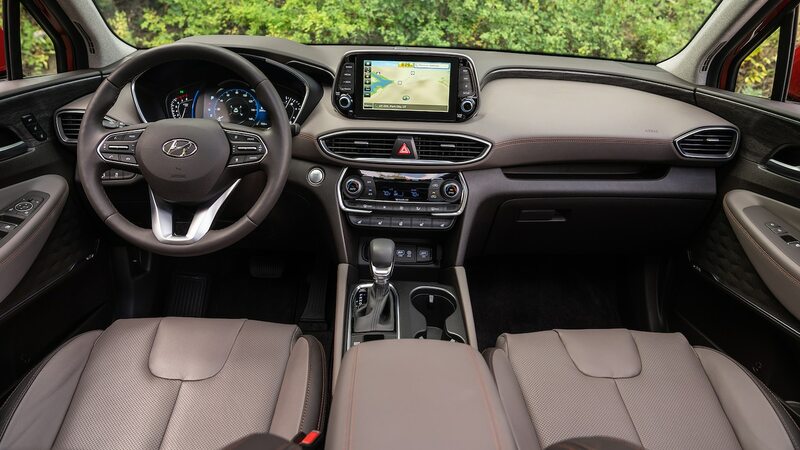 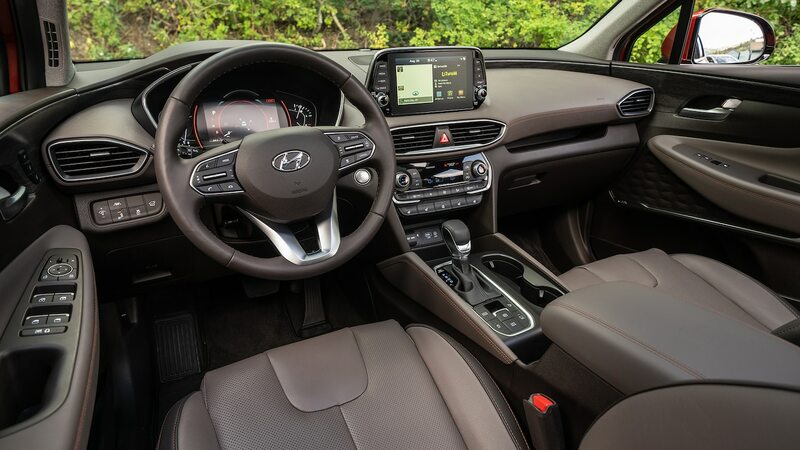 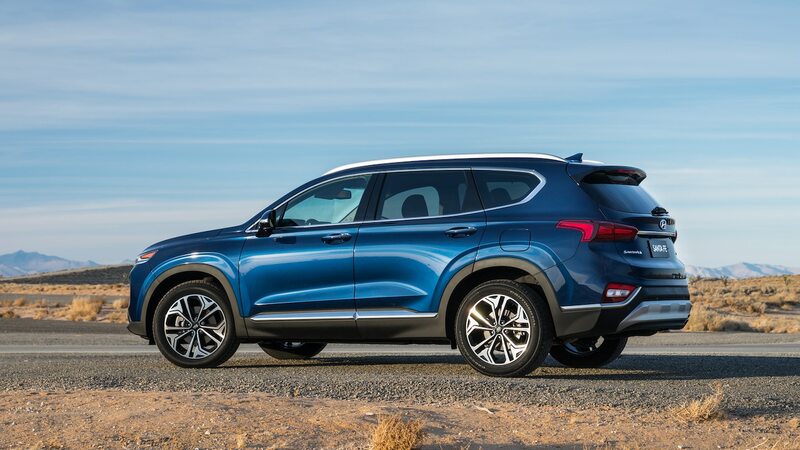 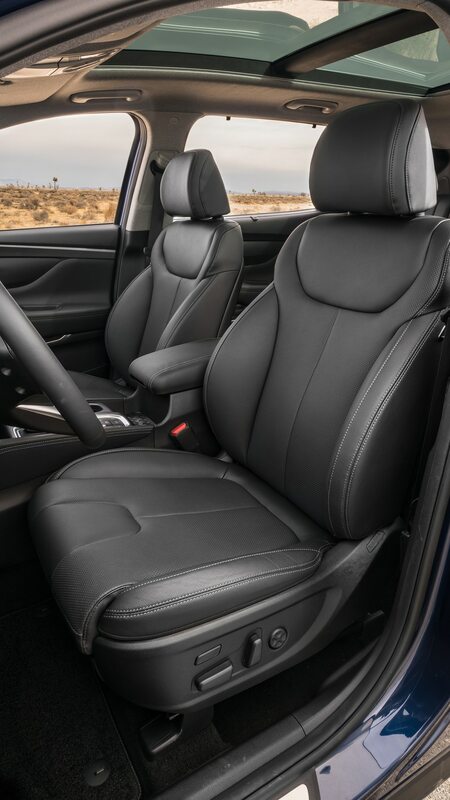 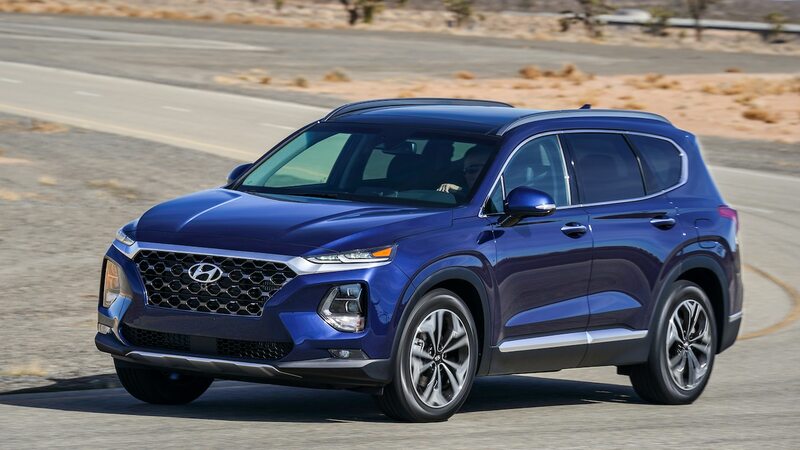 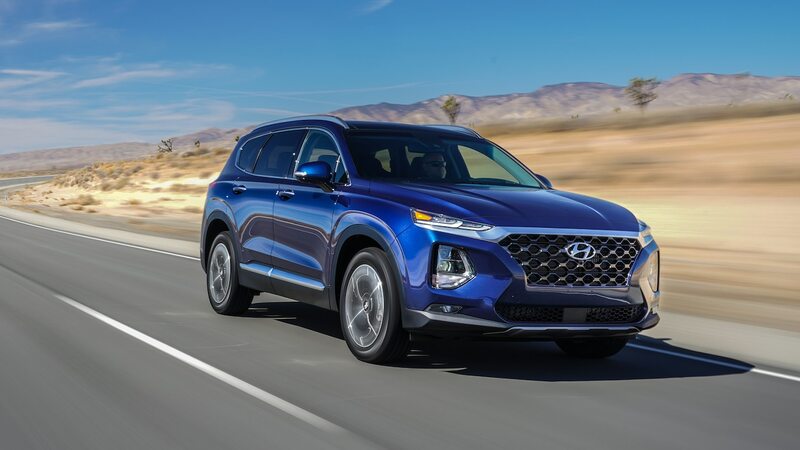 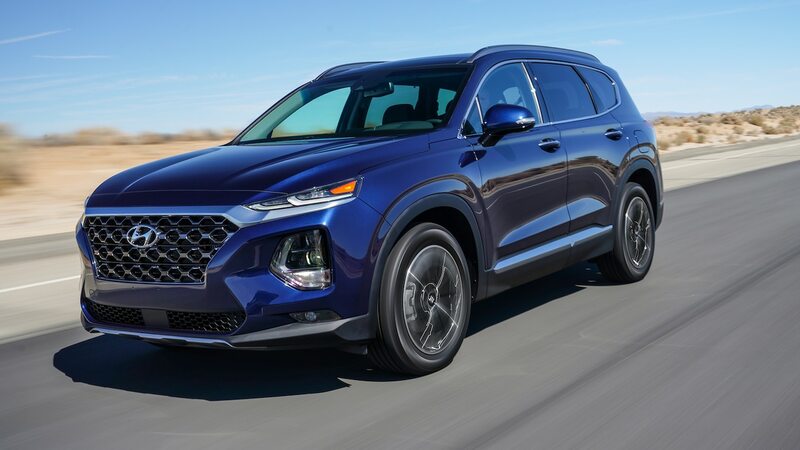 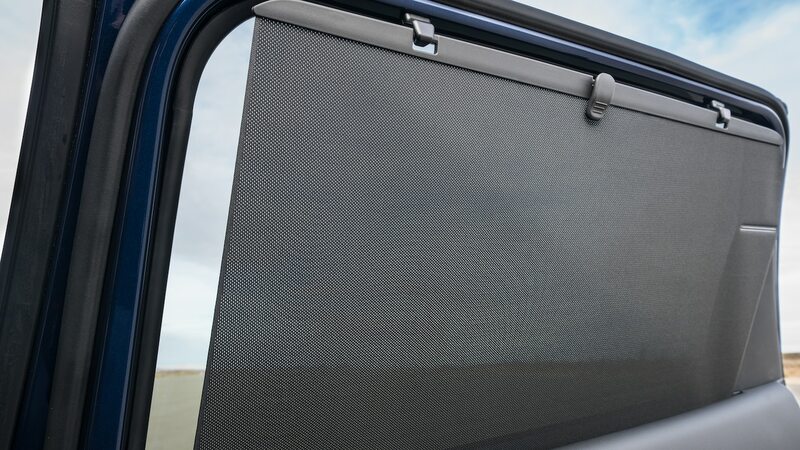 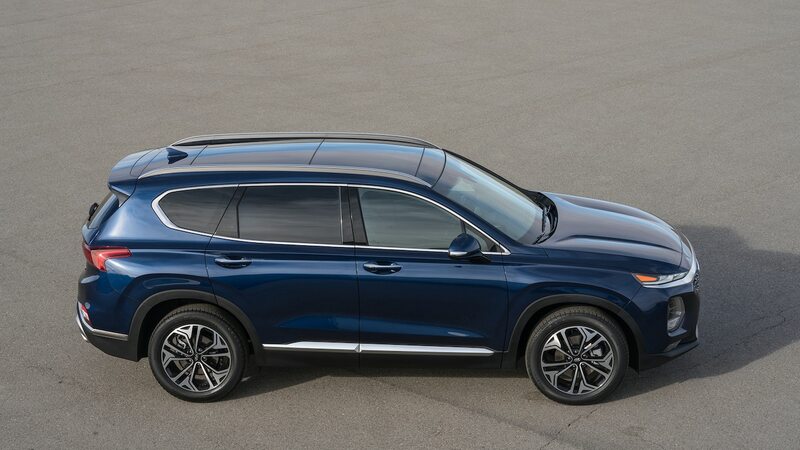 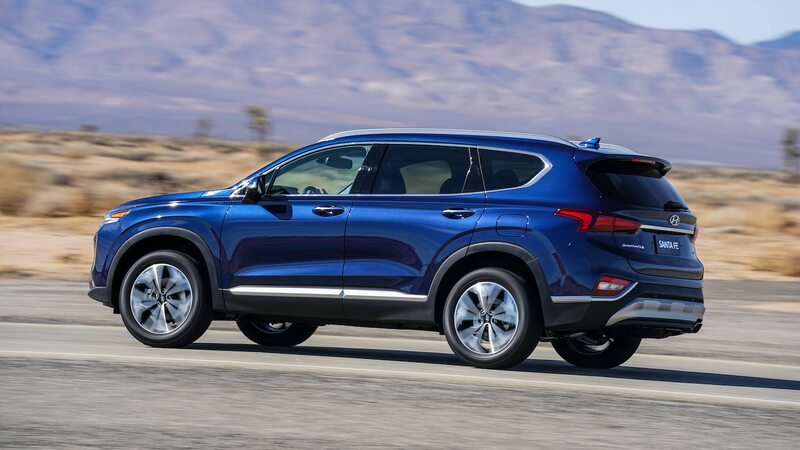 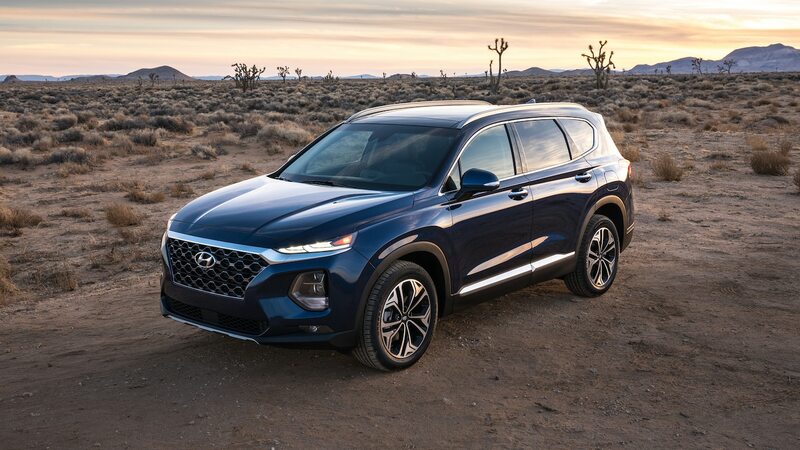 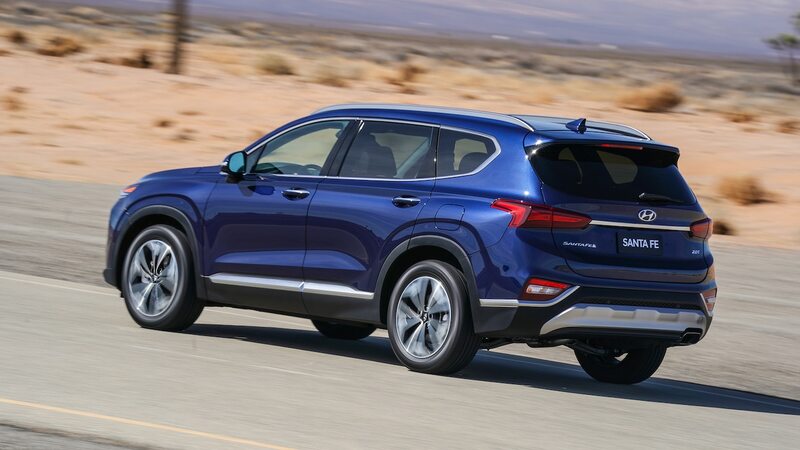 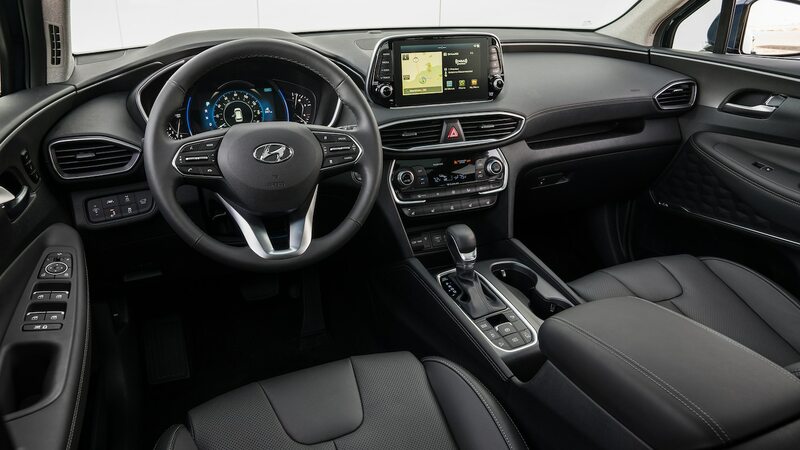 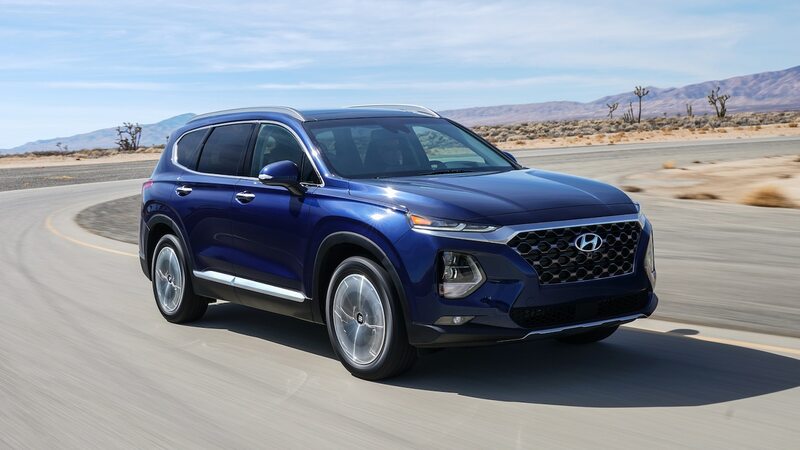 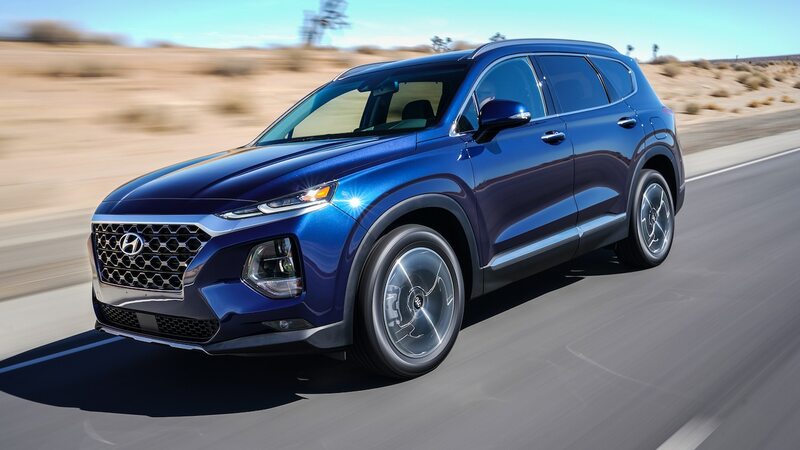 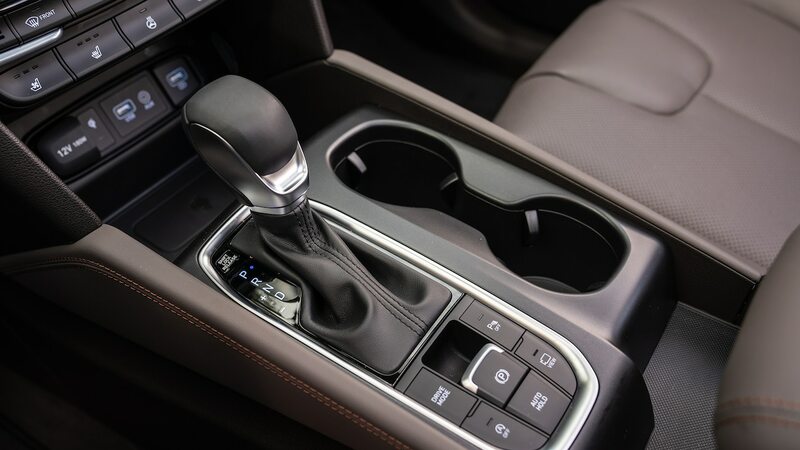 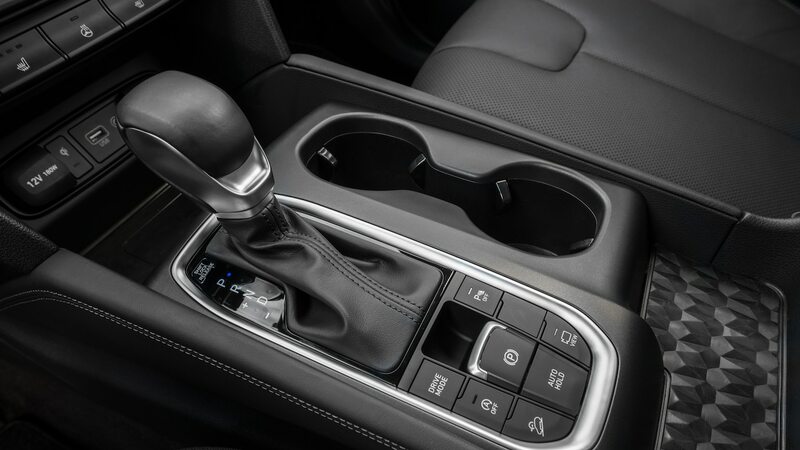 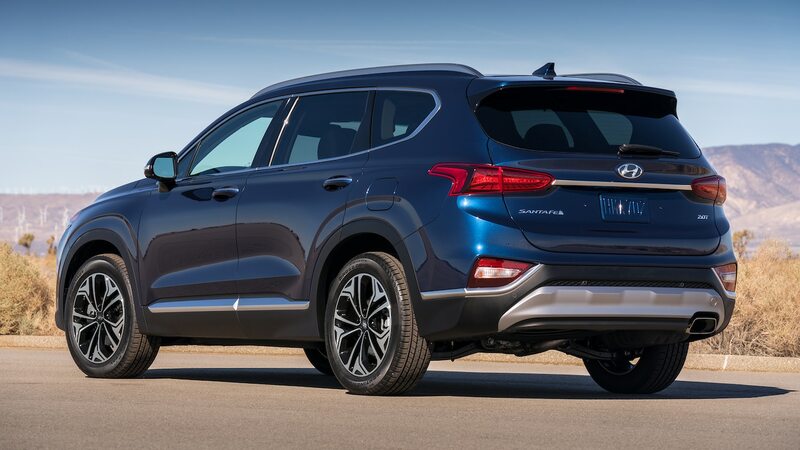 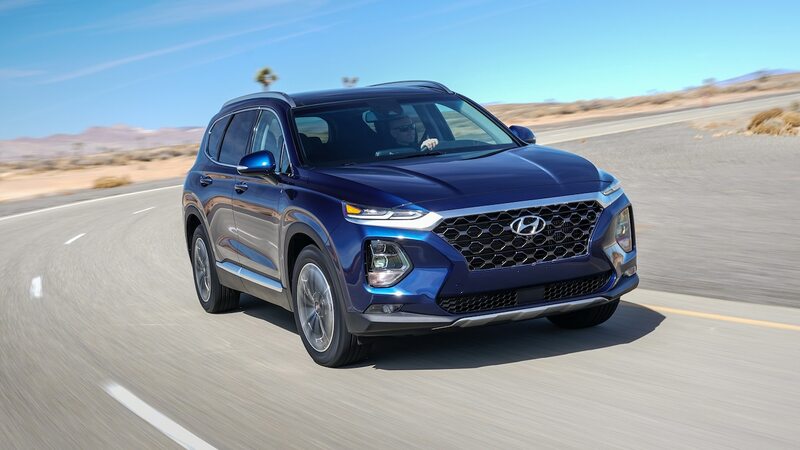 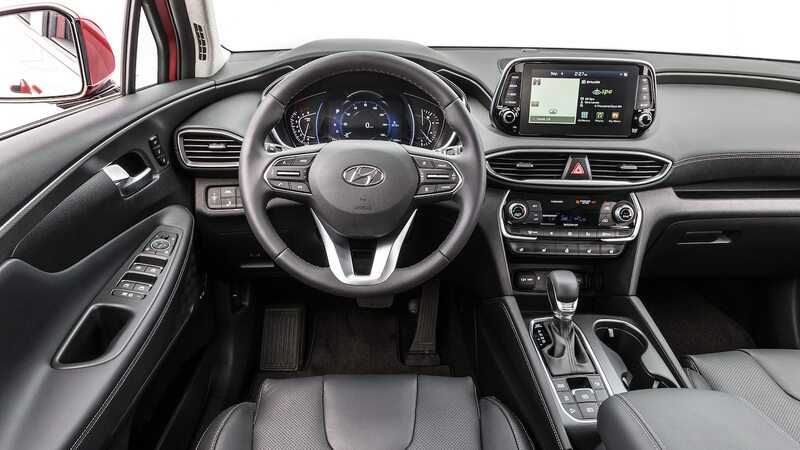 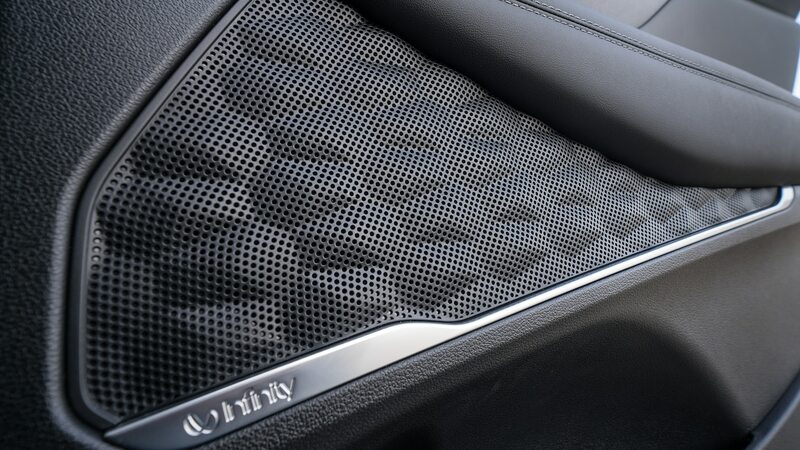 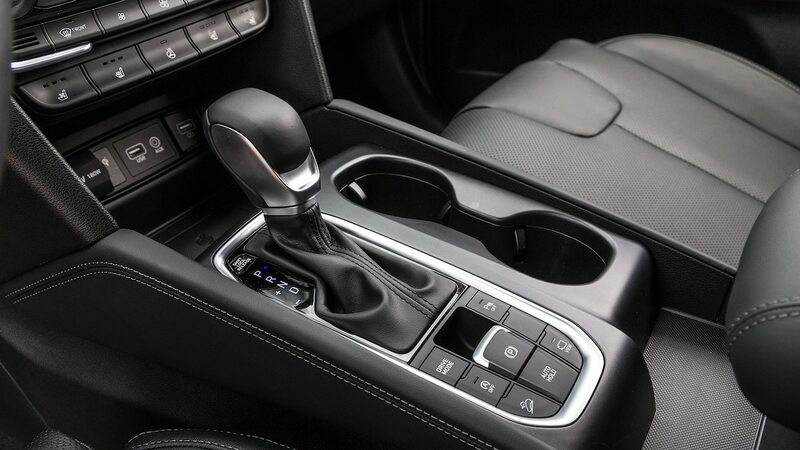 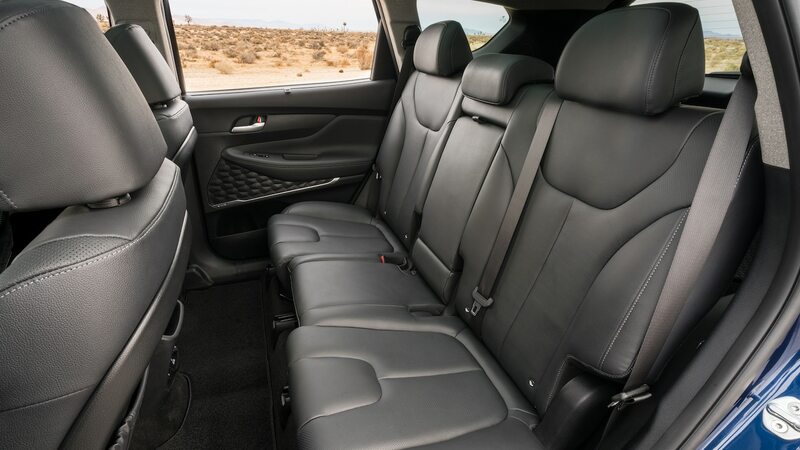 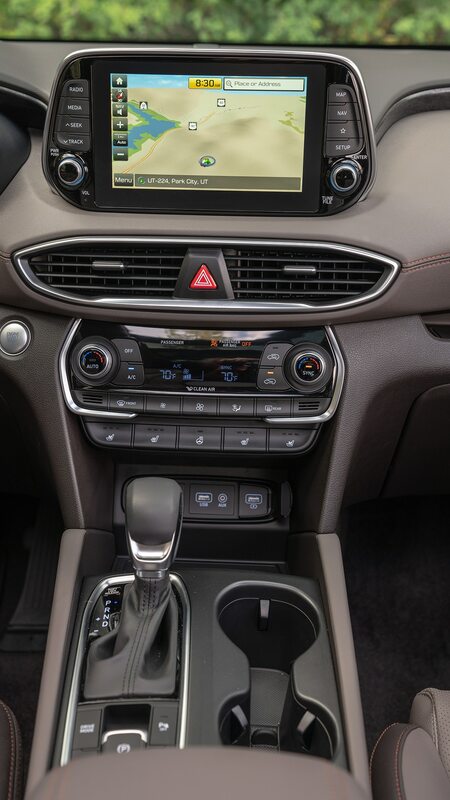 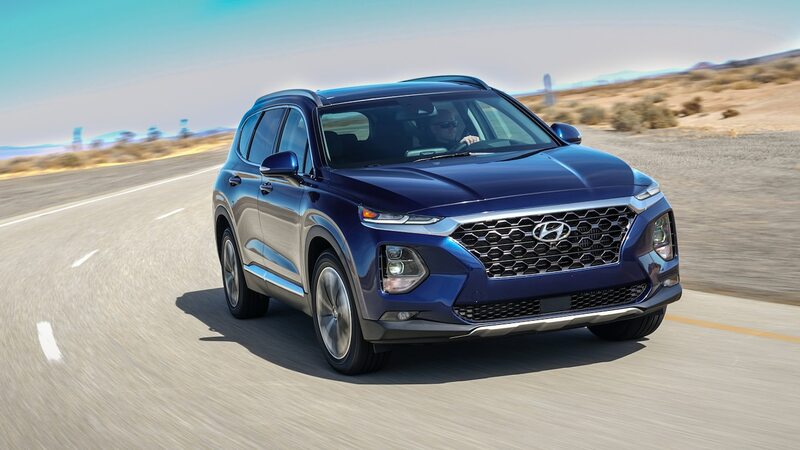 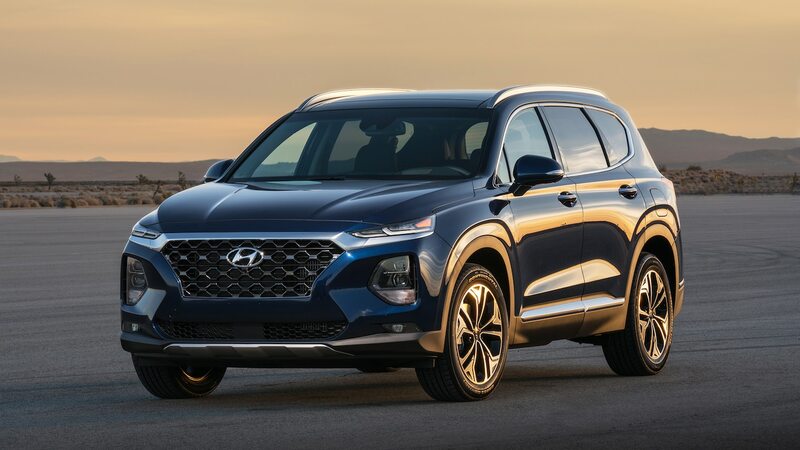 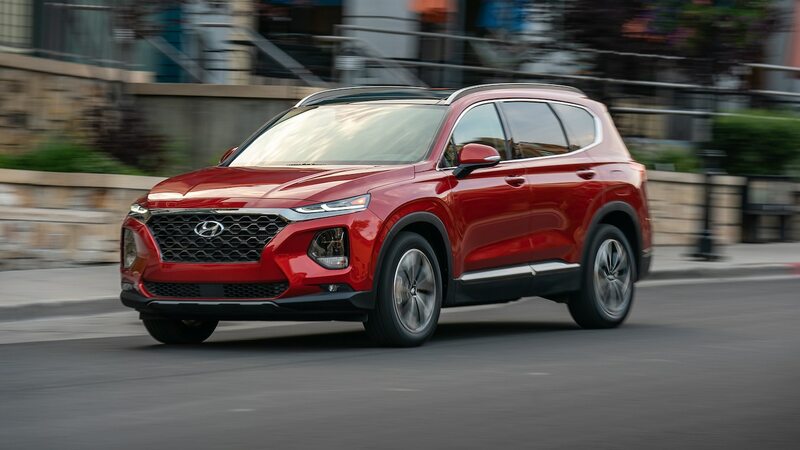 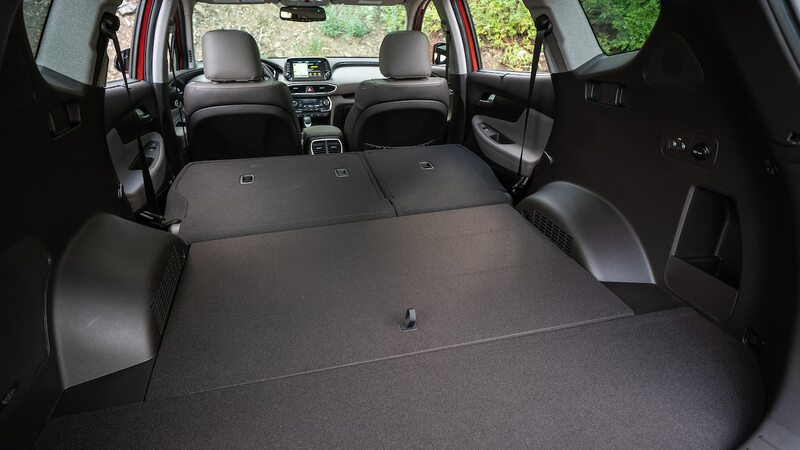 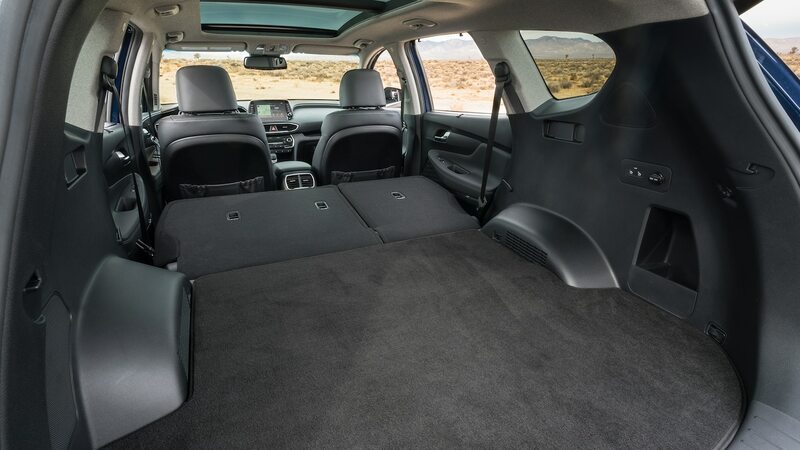 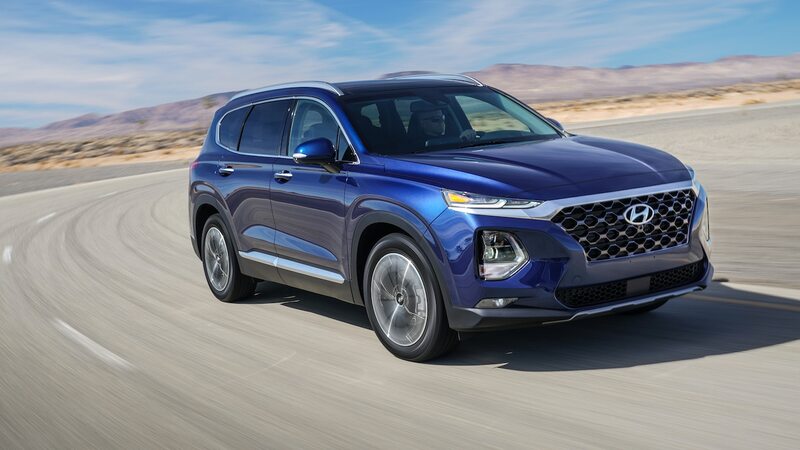 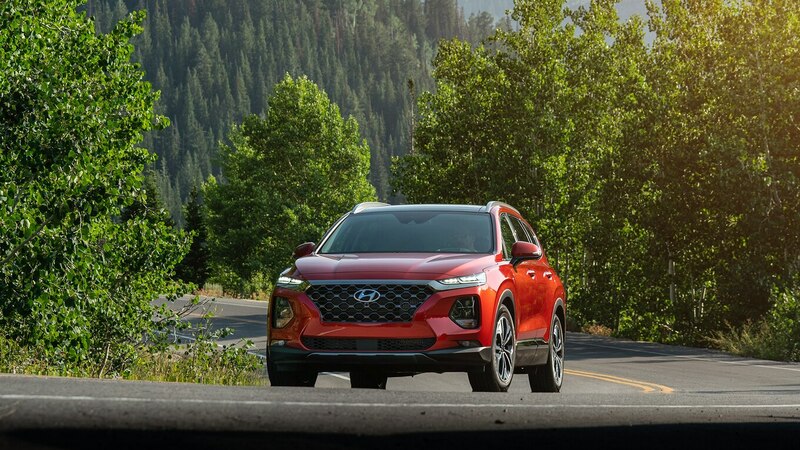 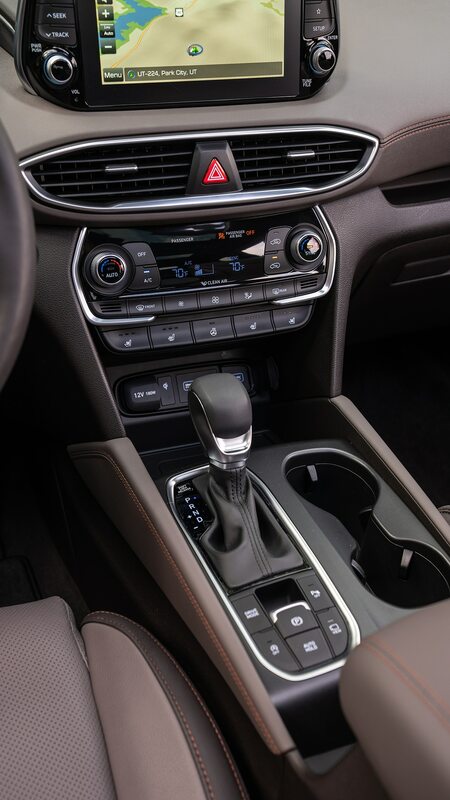 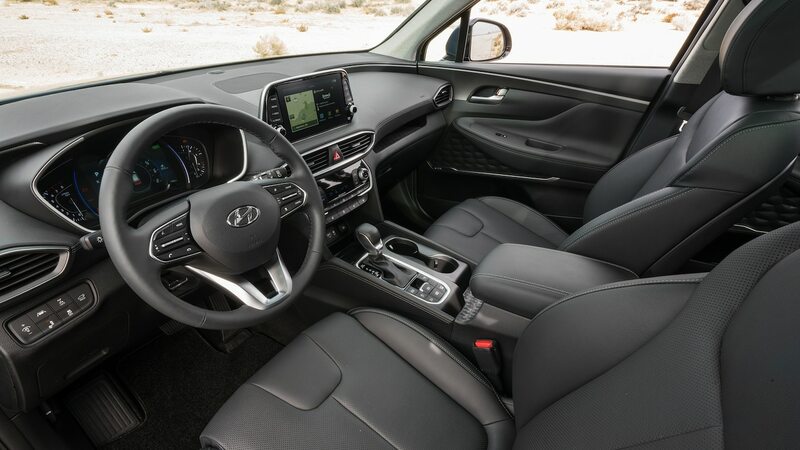 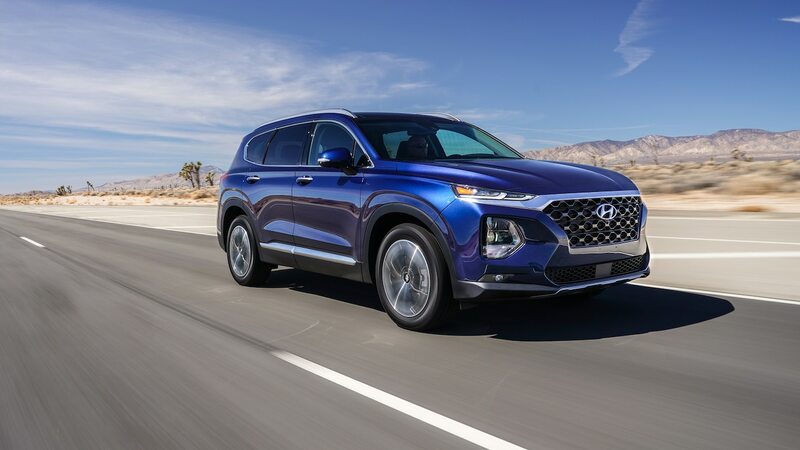 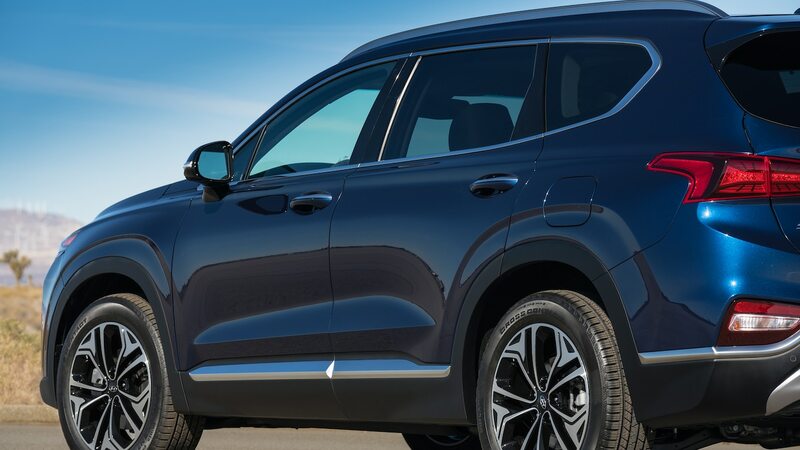 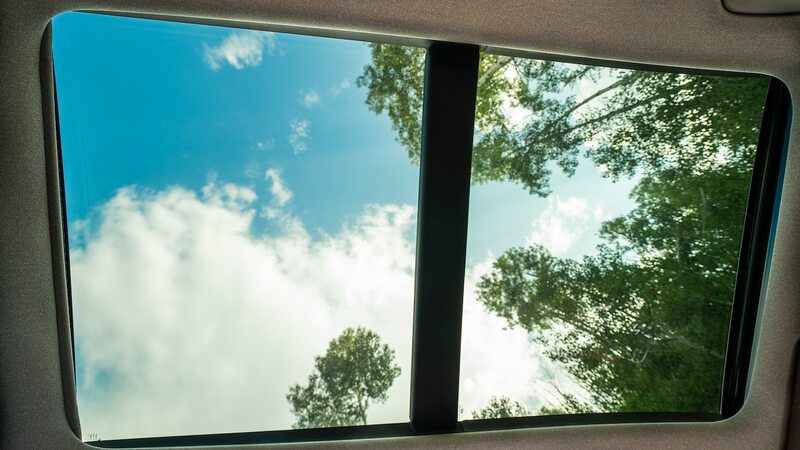 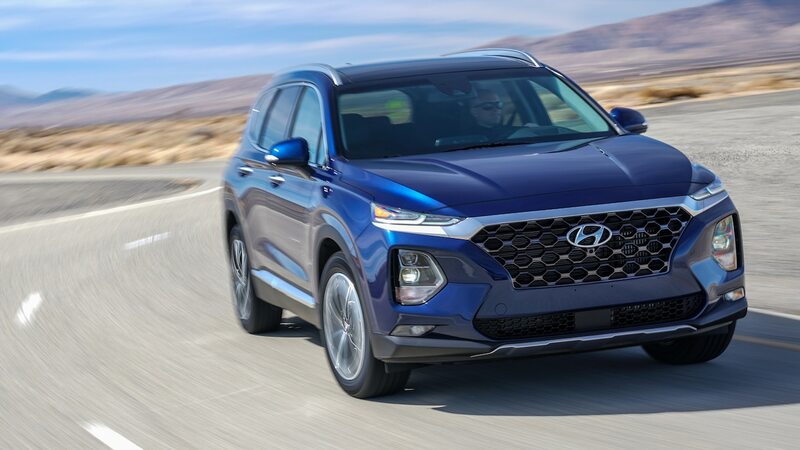 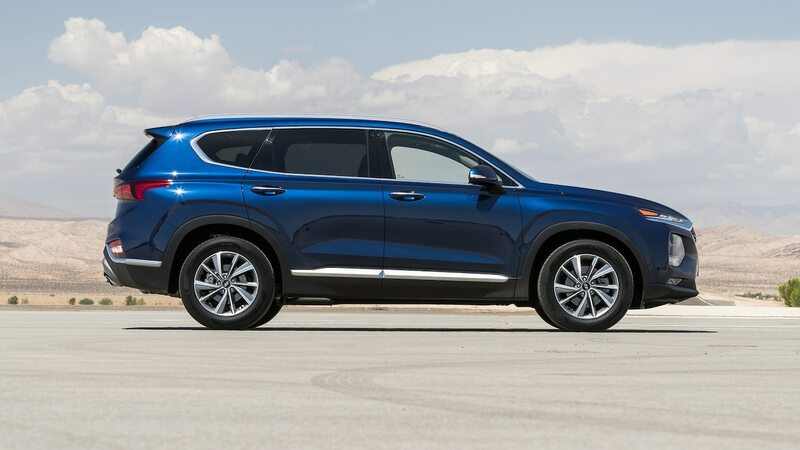 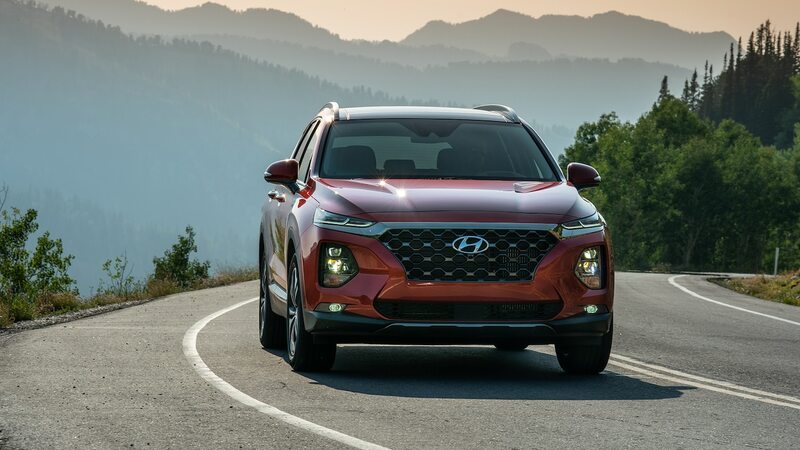 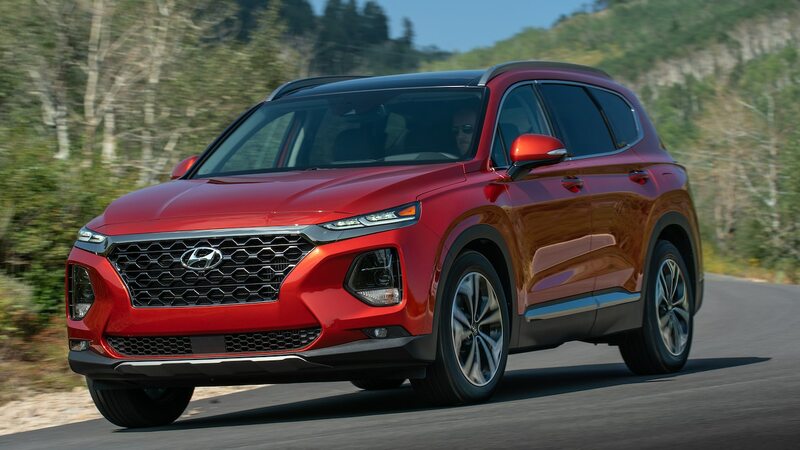 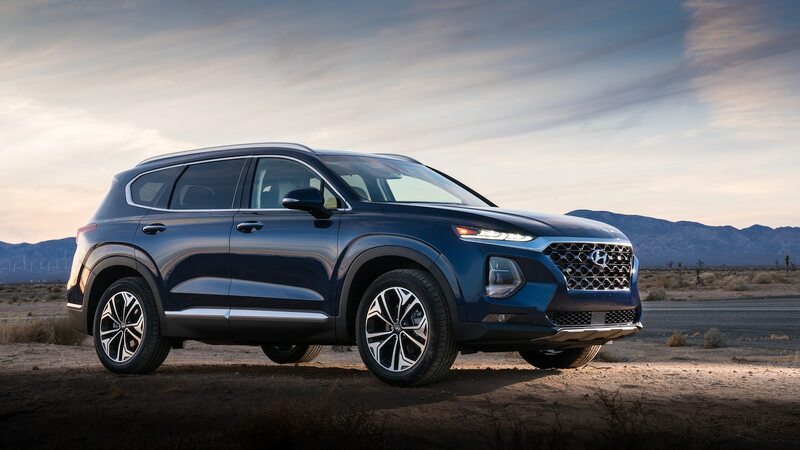 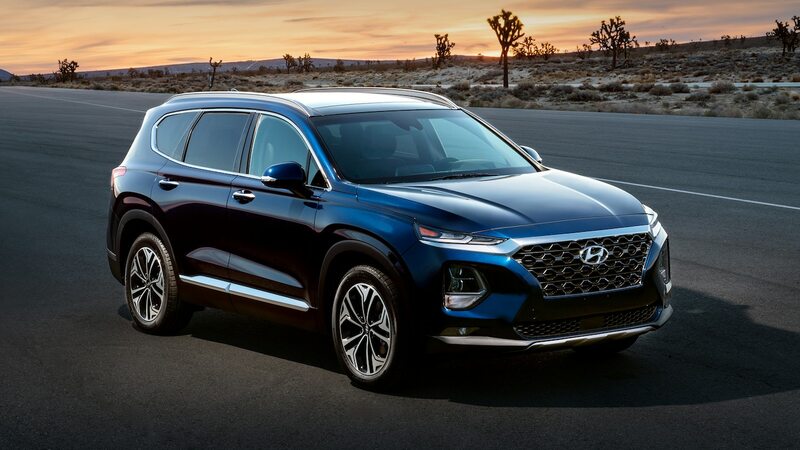 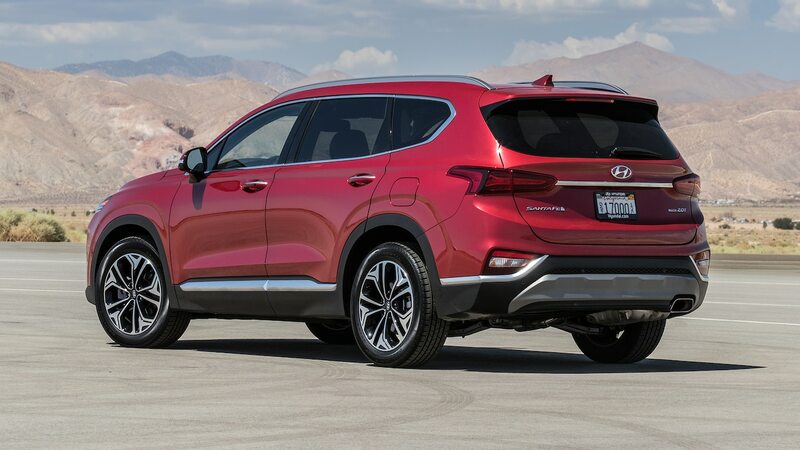 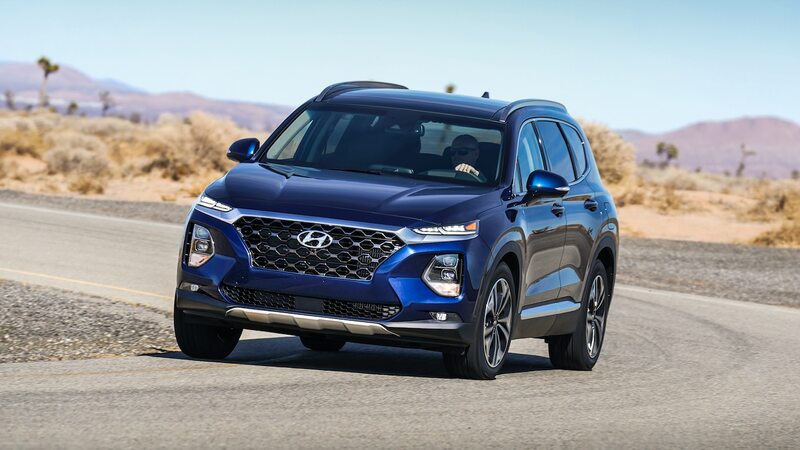 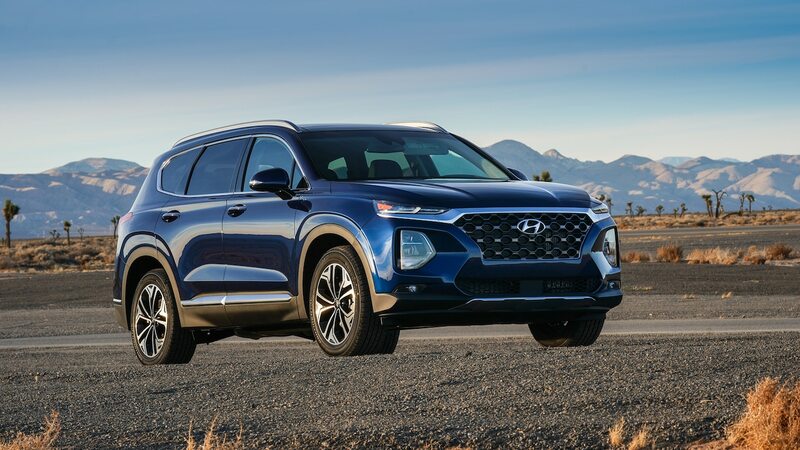 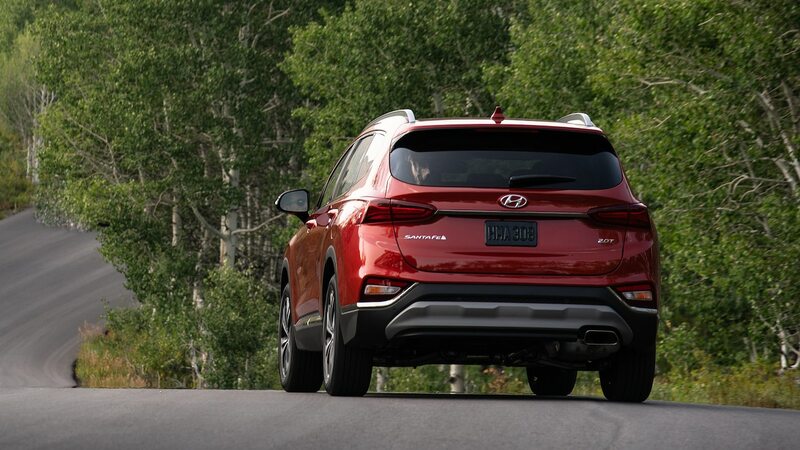 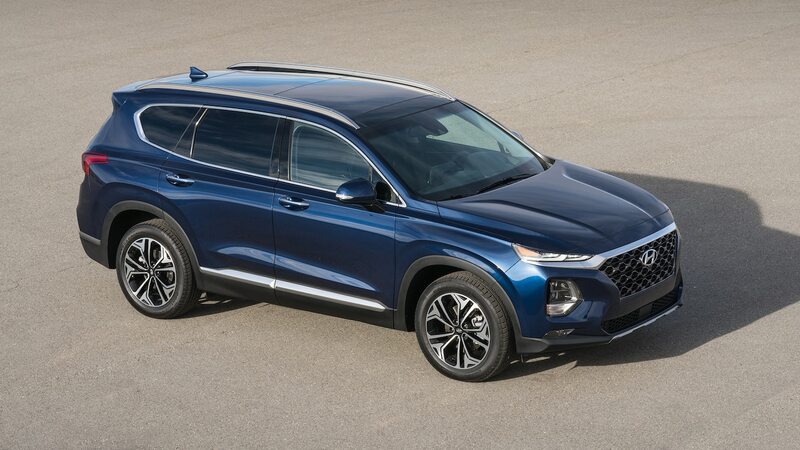 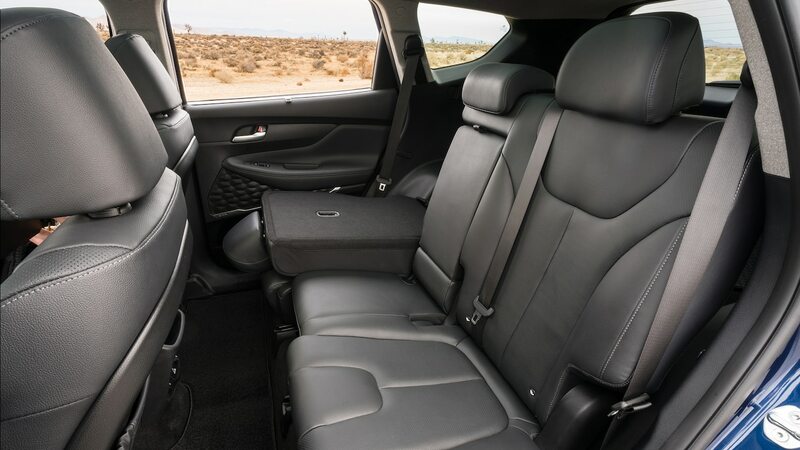 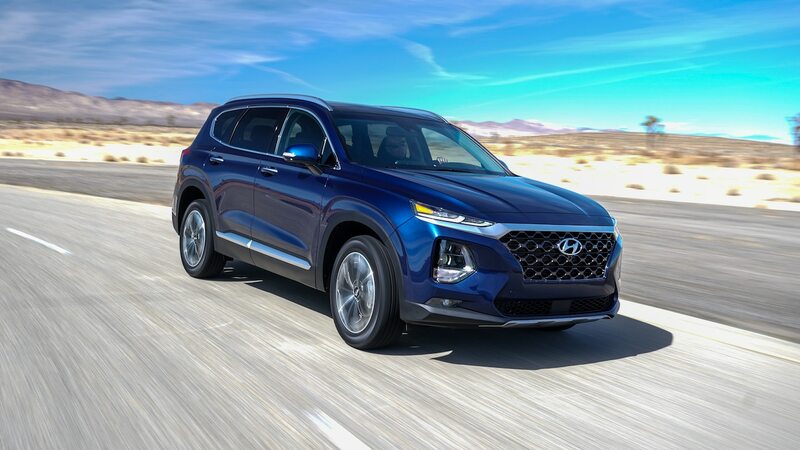 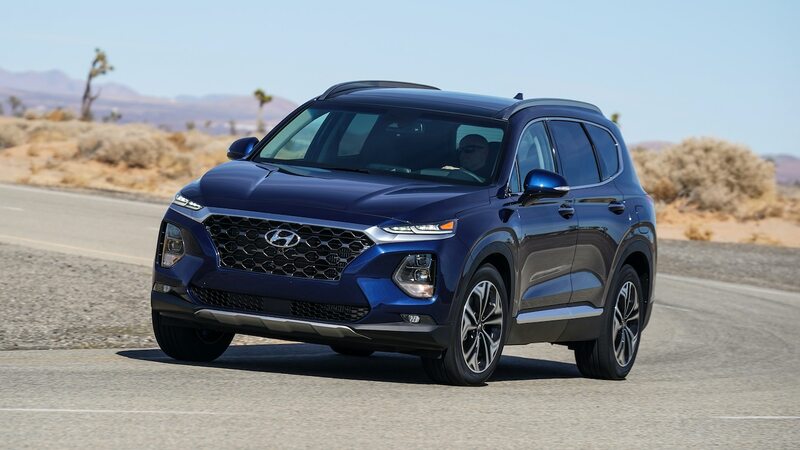 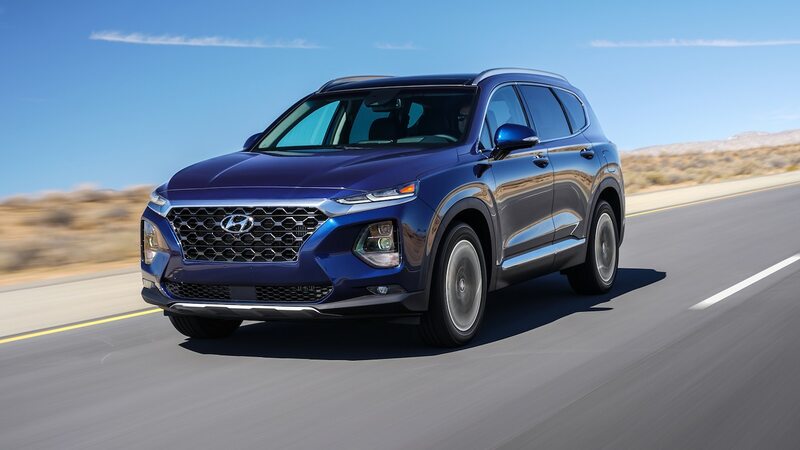 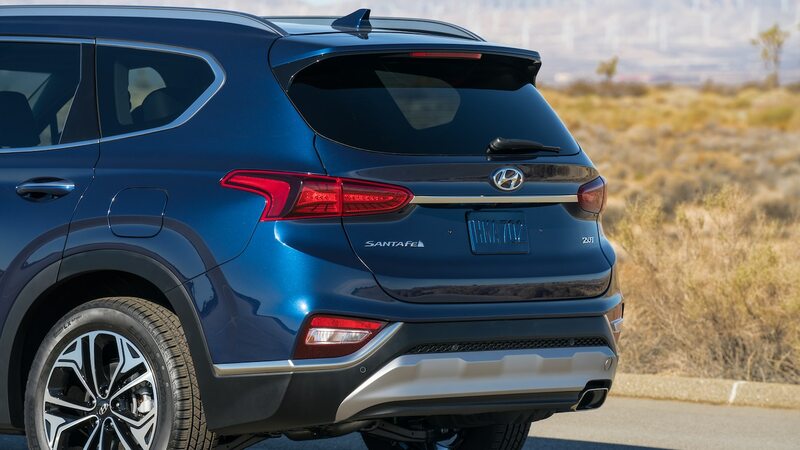 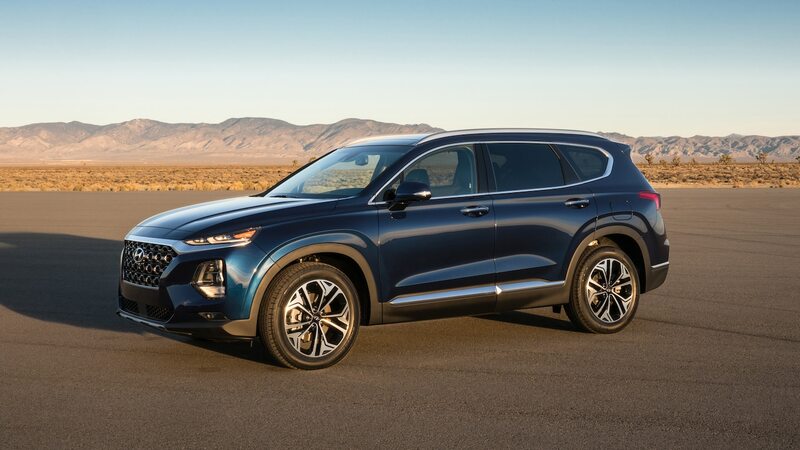 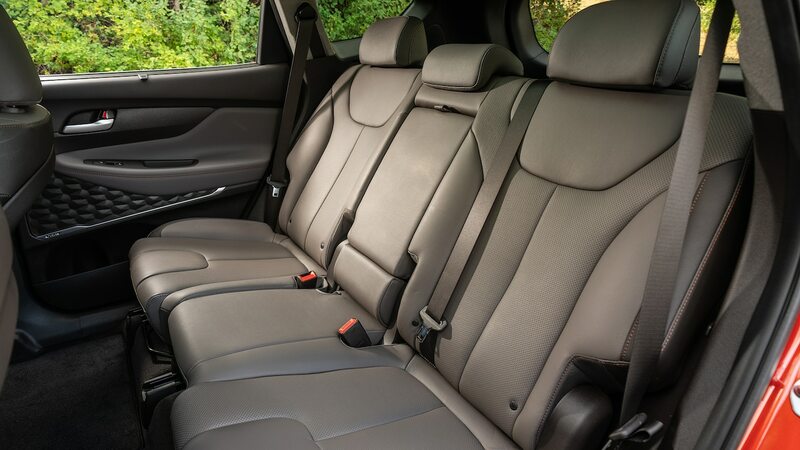 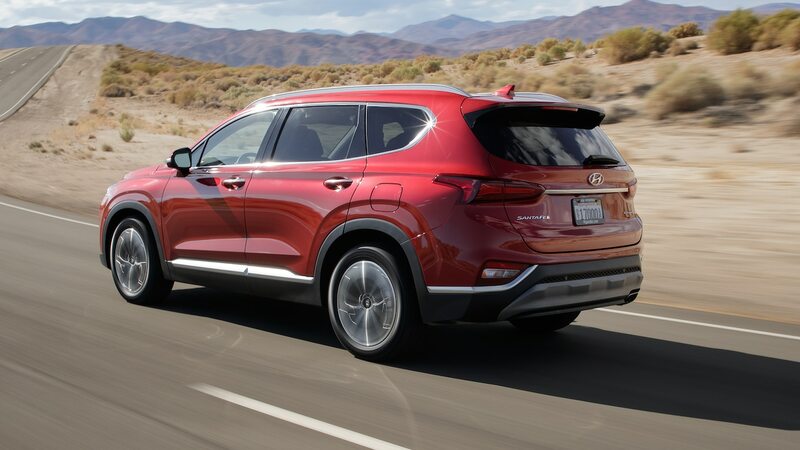 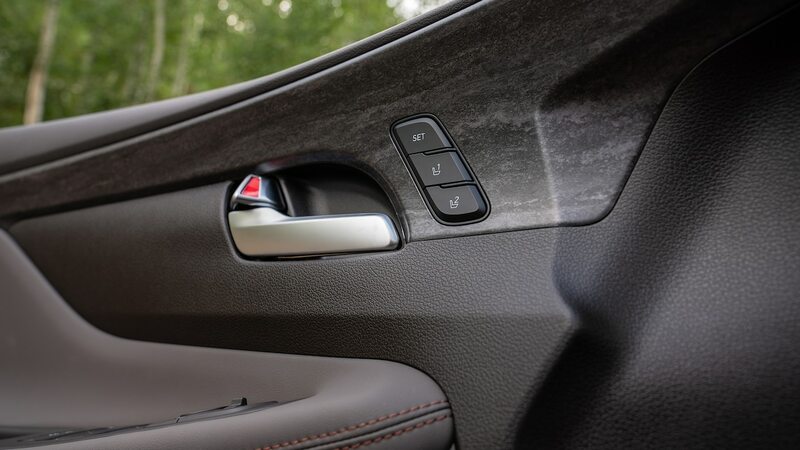 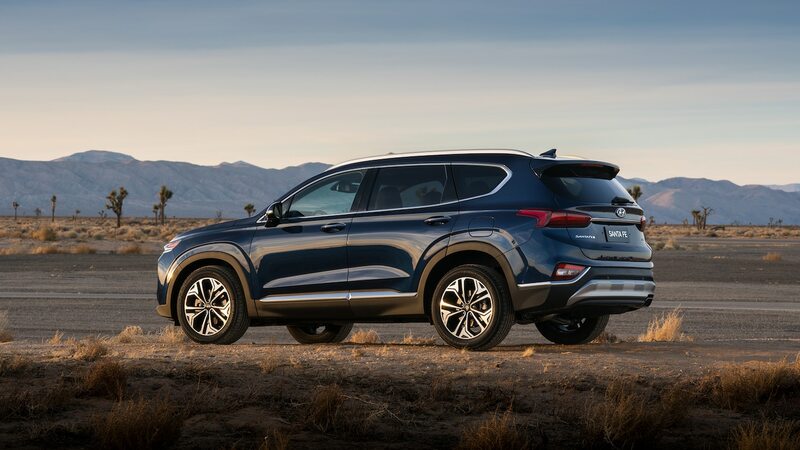 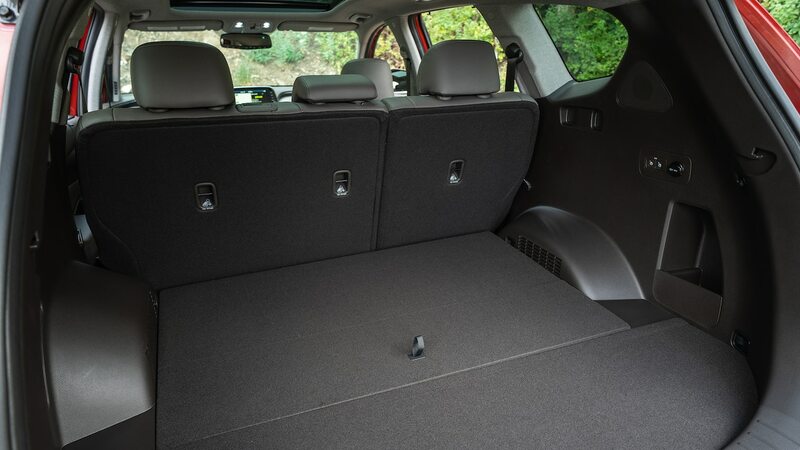 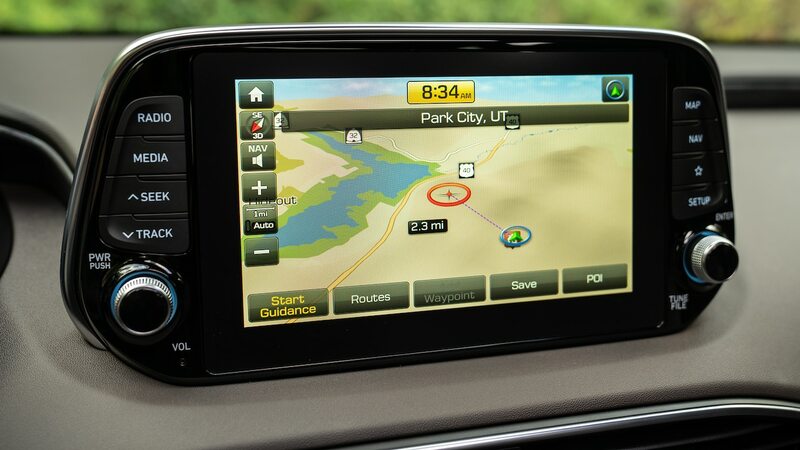 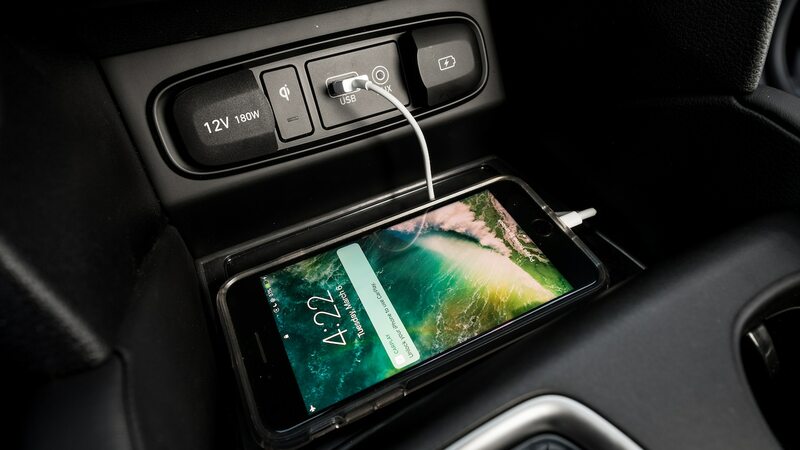 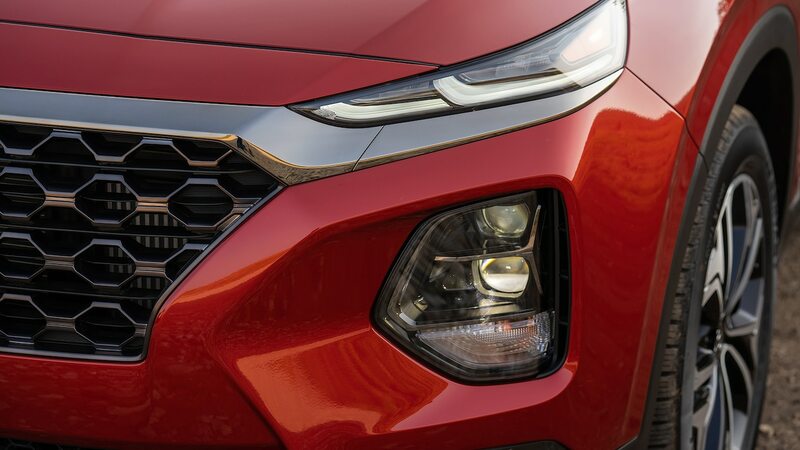 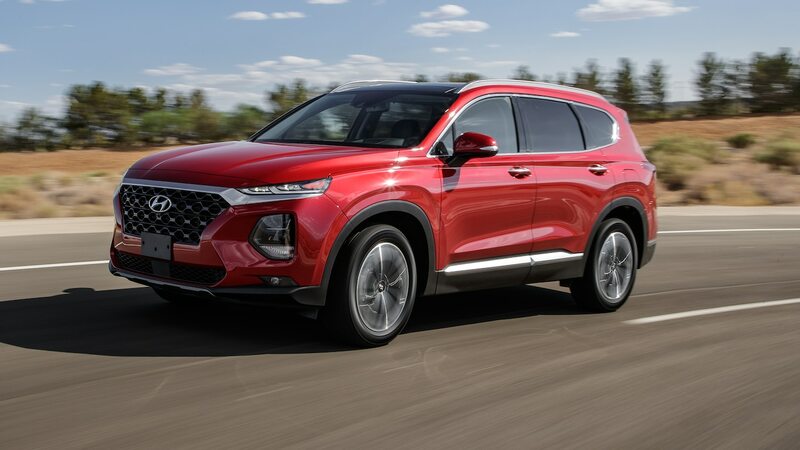 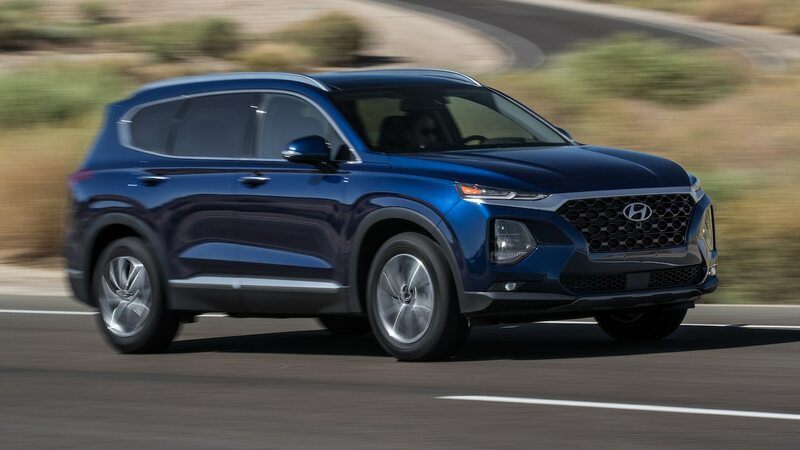 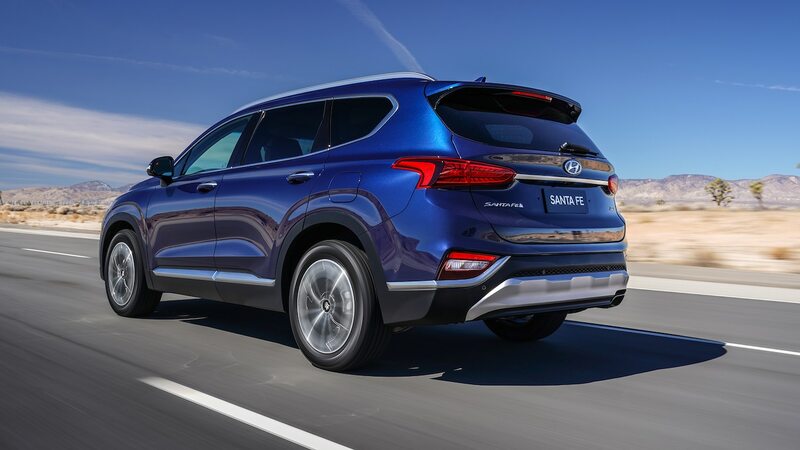 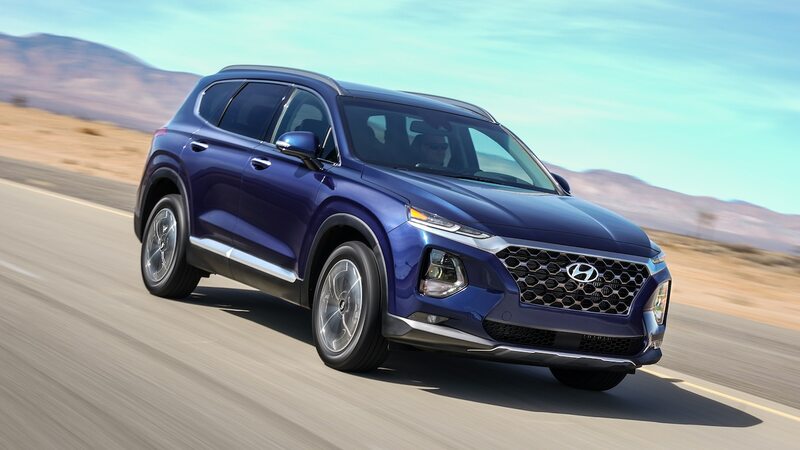 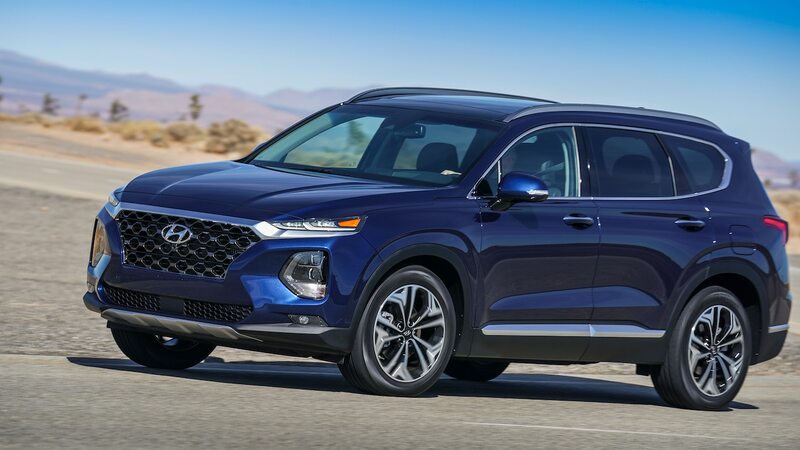 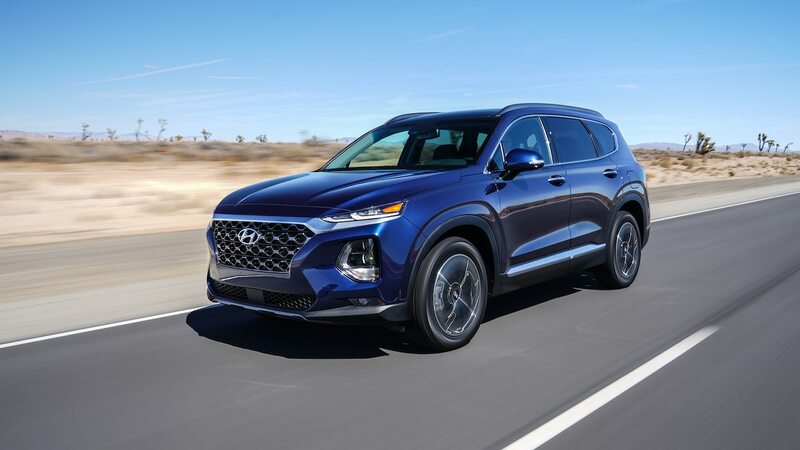 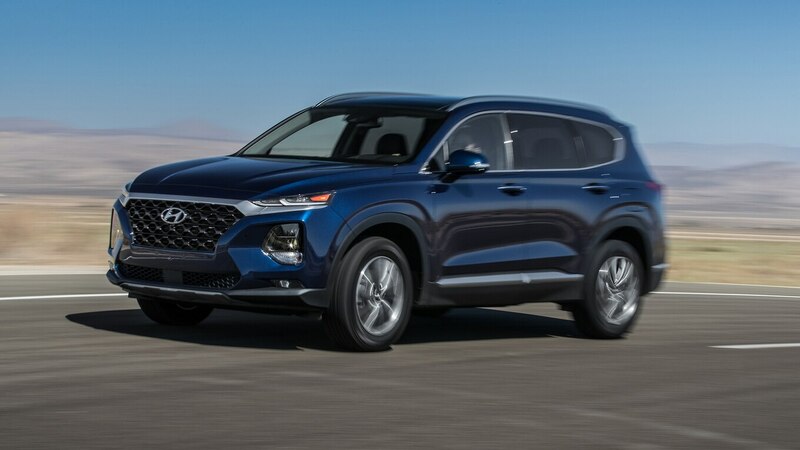 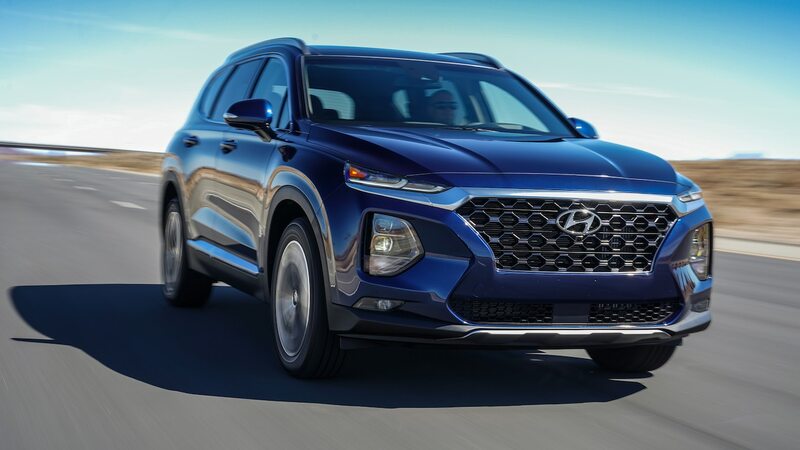 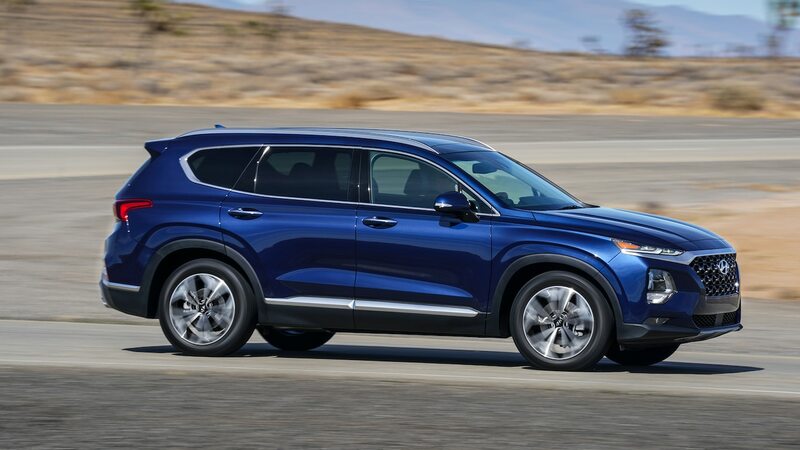 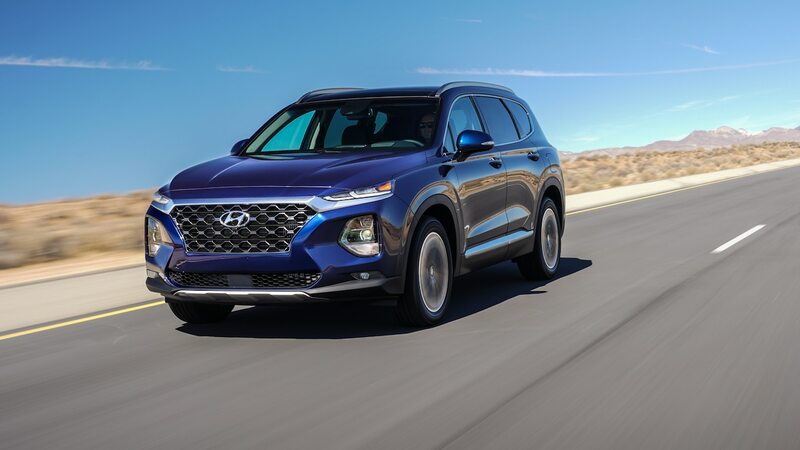 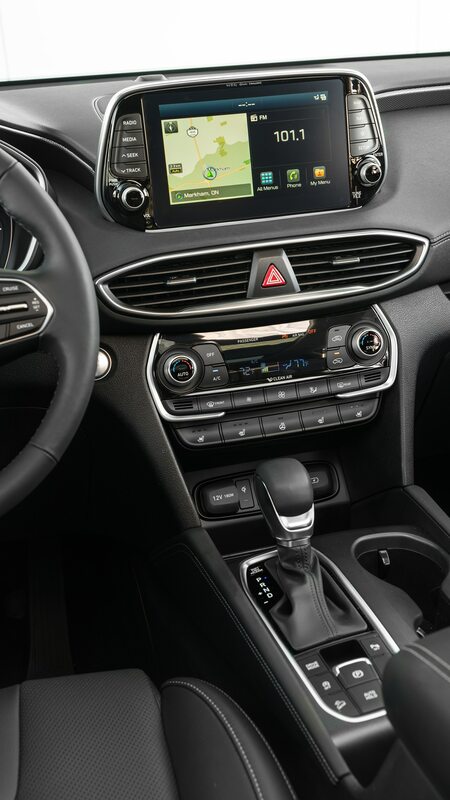 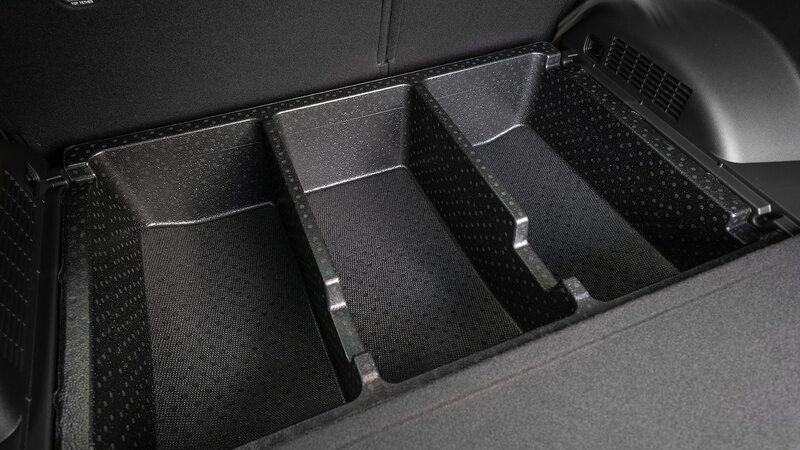 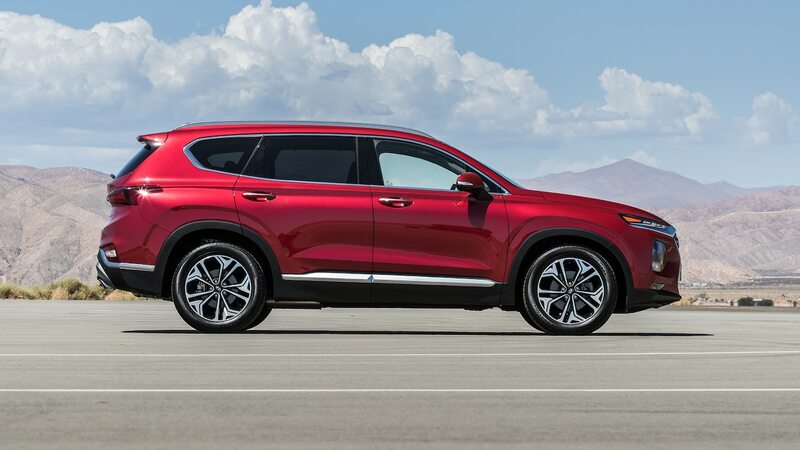 Buyers less concerned about their CUV’s performance in the cut ’n’ thrust of traffic will still delight in the Santa Fe’s interior packaging, which boasts best-in-class front seat spaciousness and the best ratio of interior passenger and cargo space to exterior body size. 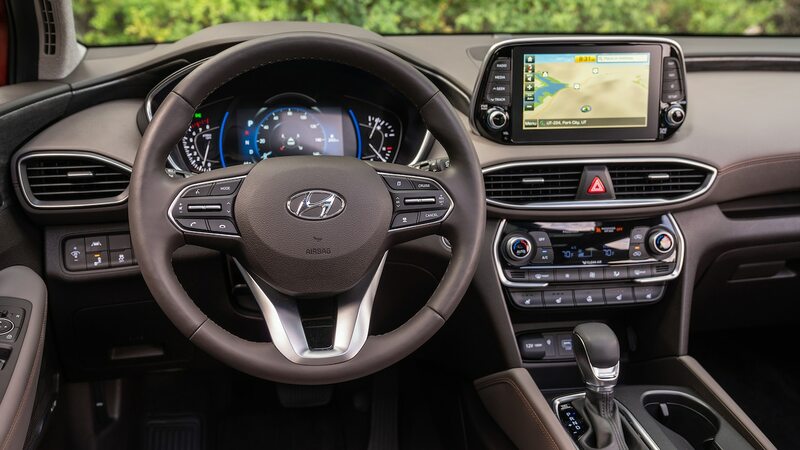 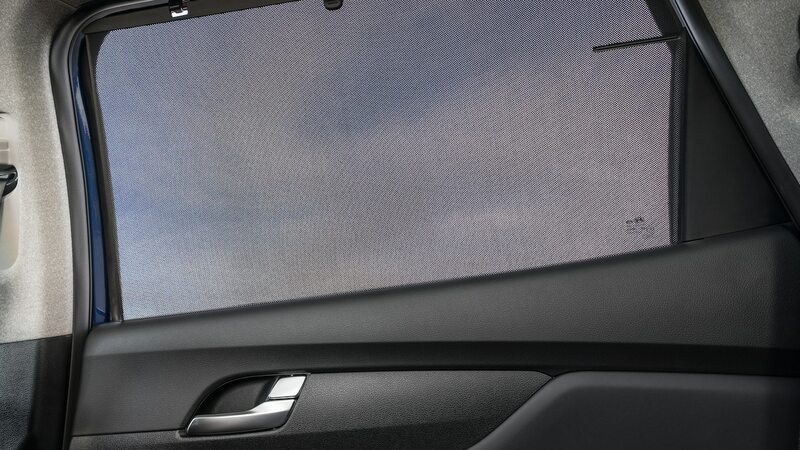 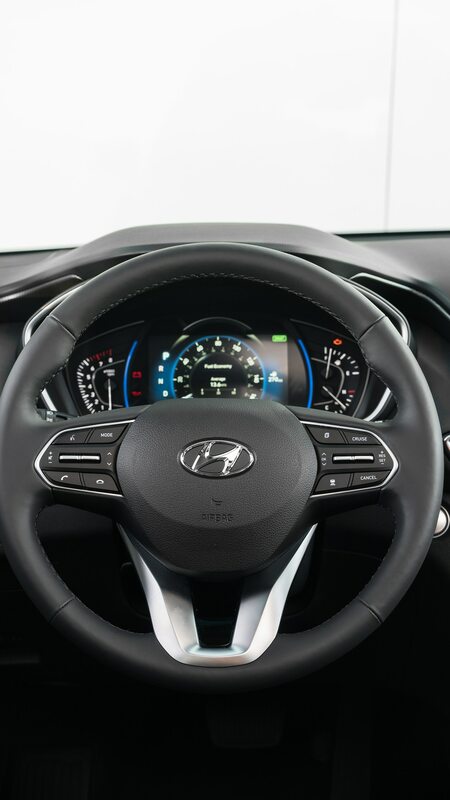 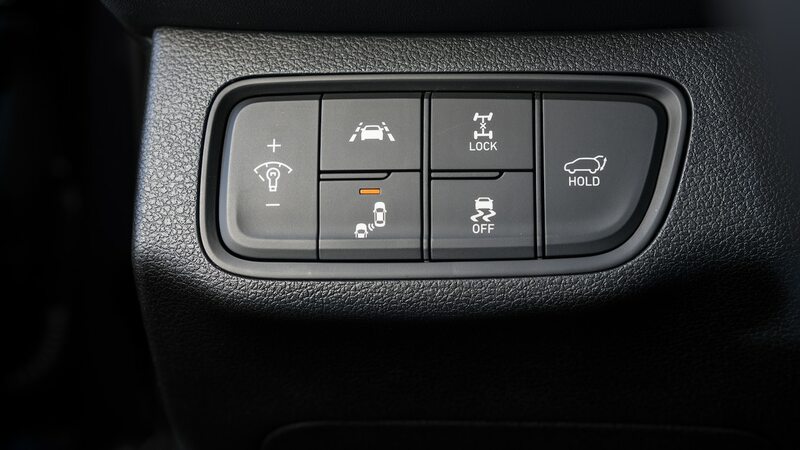 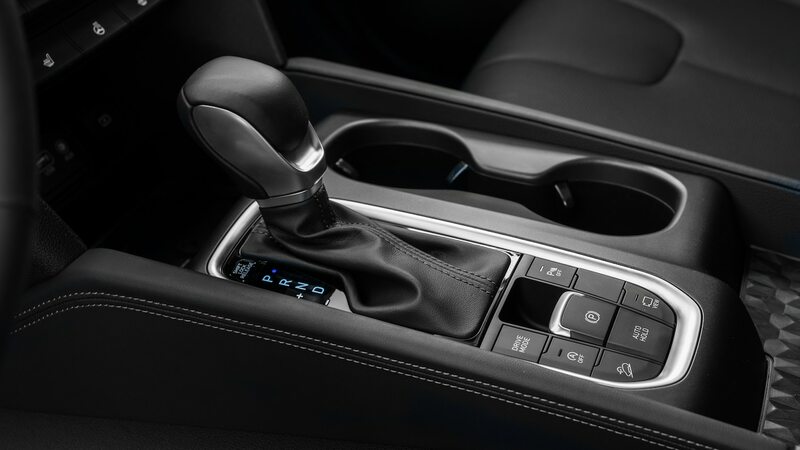 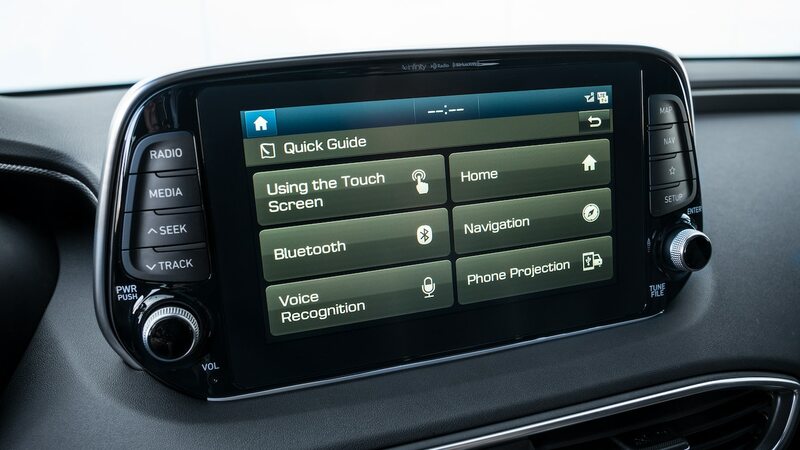 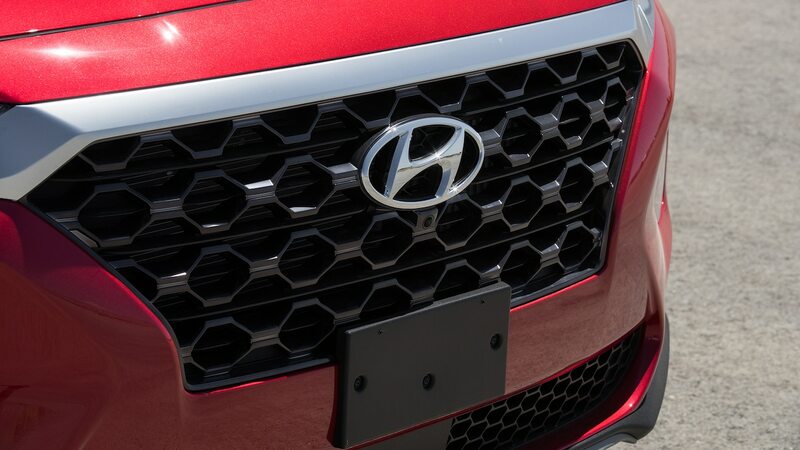 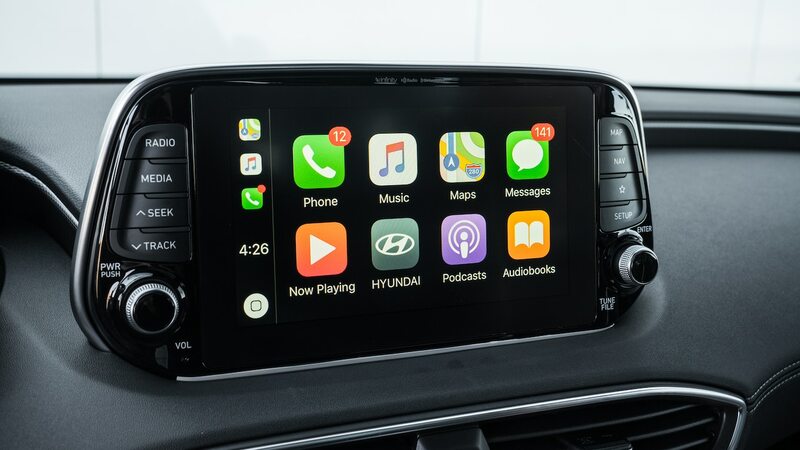 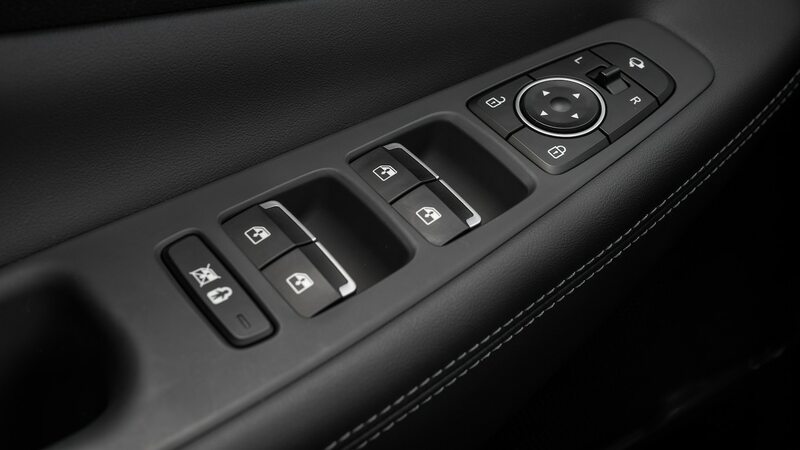 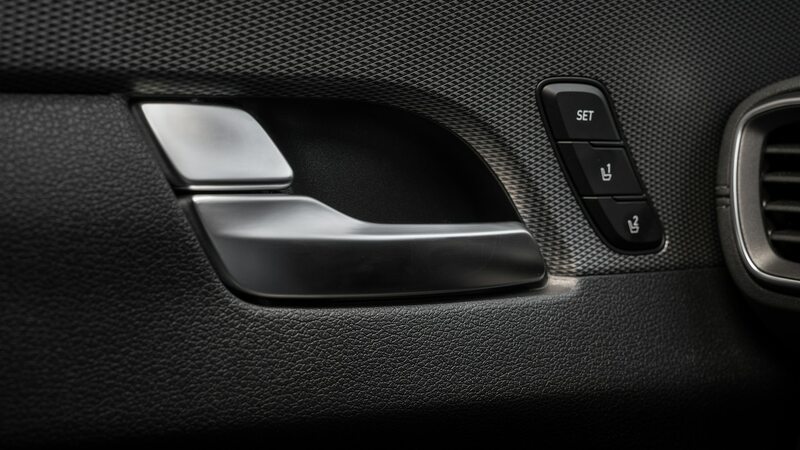 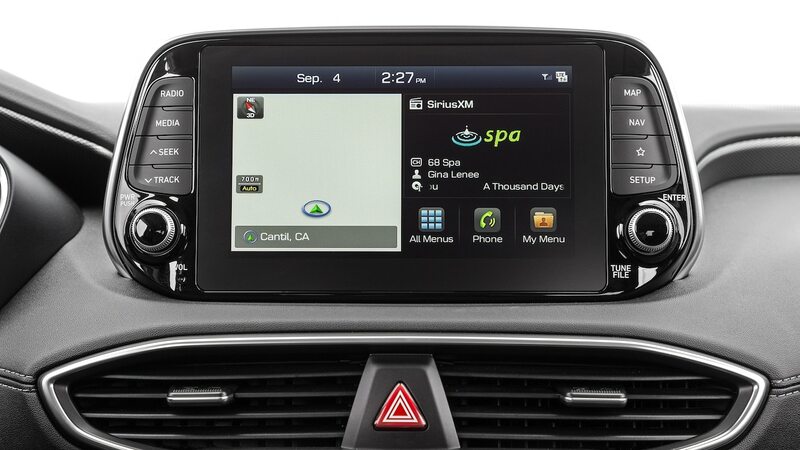 Hyundai also ladles on the safety and driver-assistance technology pretty liberally, as well, though the automatic emergency braking system needs recalibration. 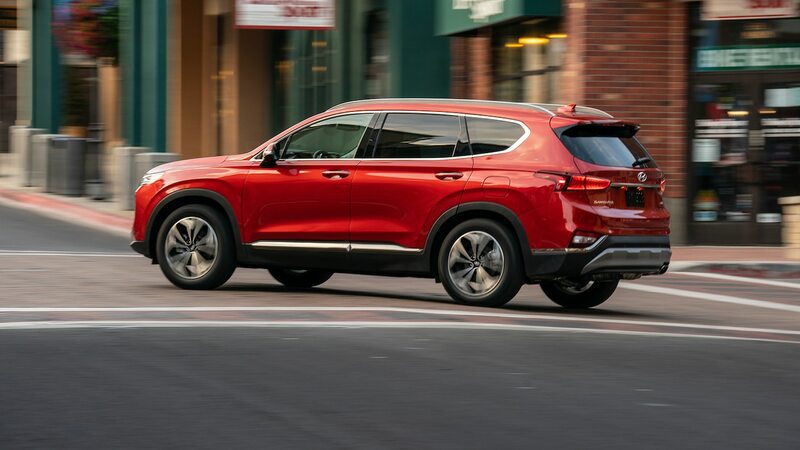 It will not allow the vehicle to follow closely in a line of traffic trying to make a left turn without repeatedly lurching to a stop, spilling coffee and throwing briefcases to the floor. 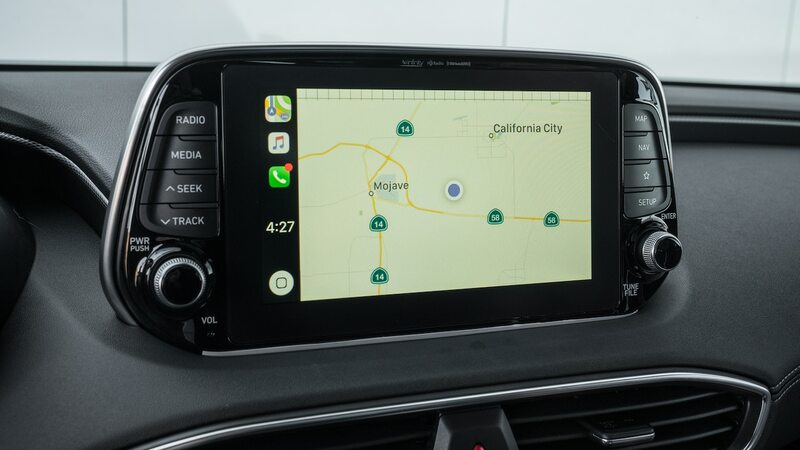 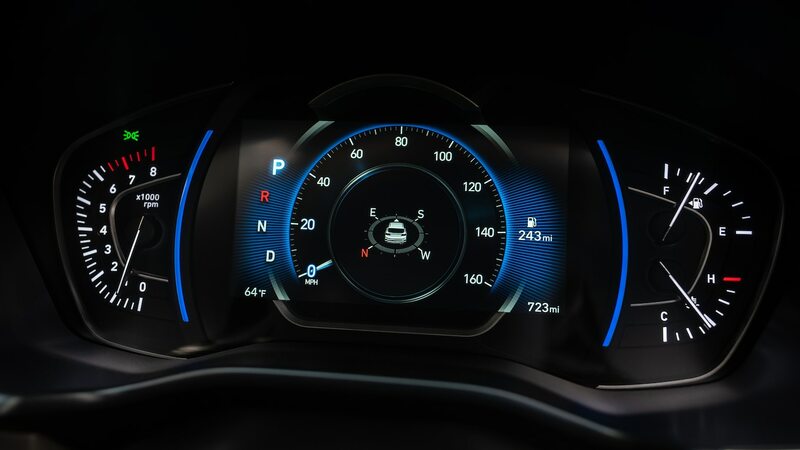 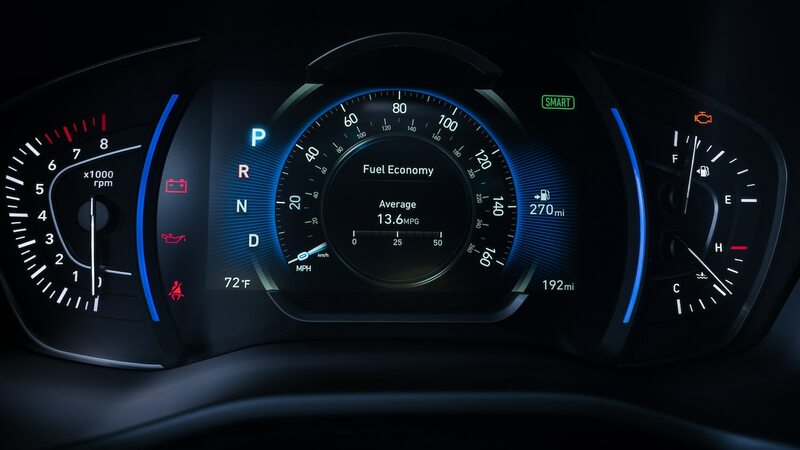 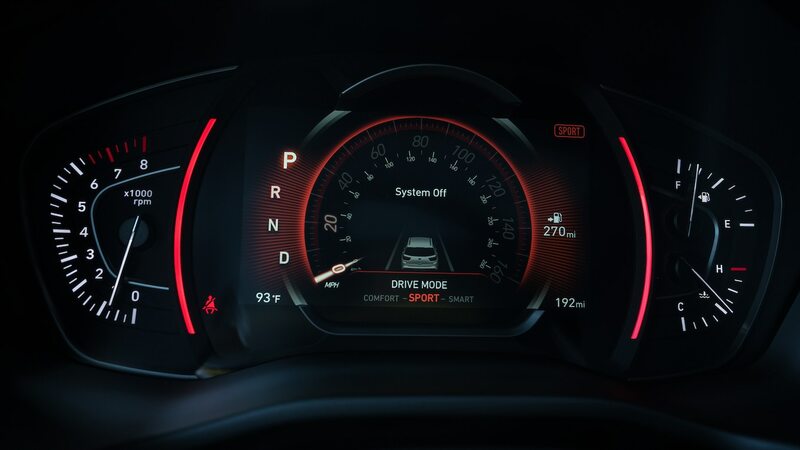 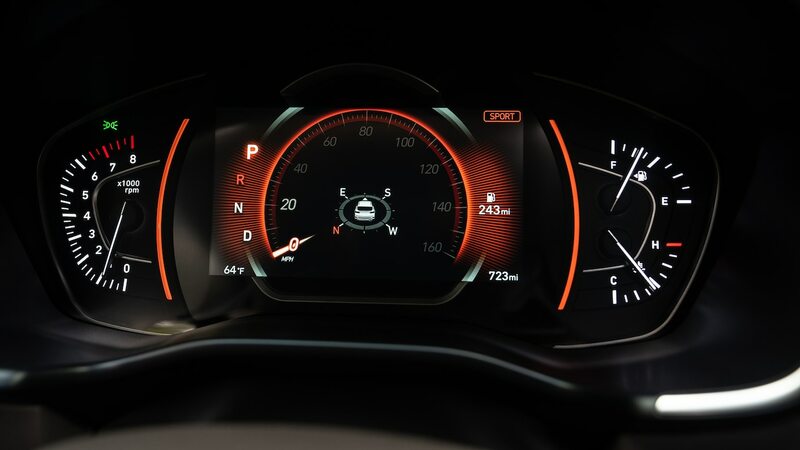 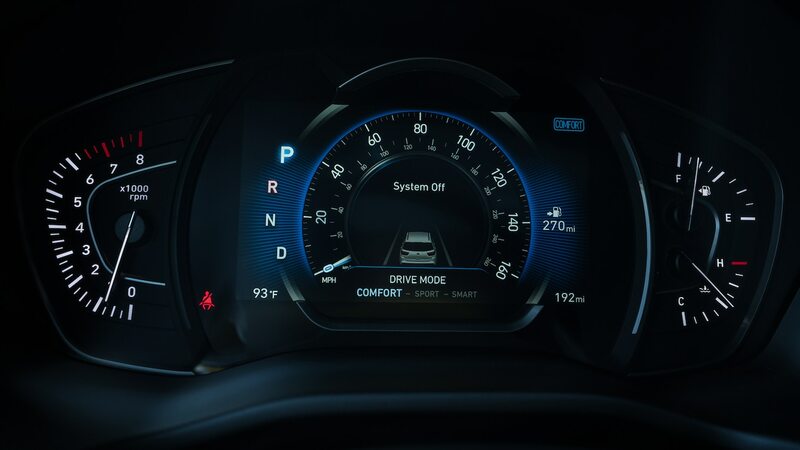 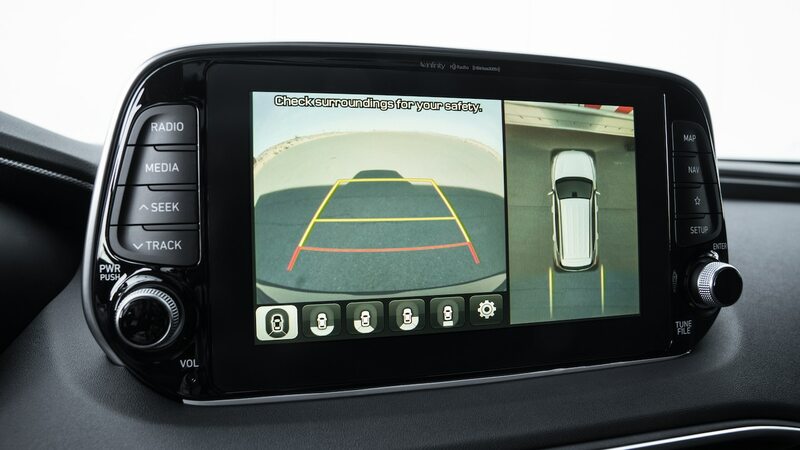 Behavior of the adaptive cruise control system also seemed more timid and hesitant than usual about resuming a set speed after obstacles cleared. 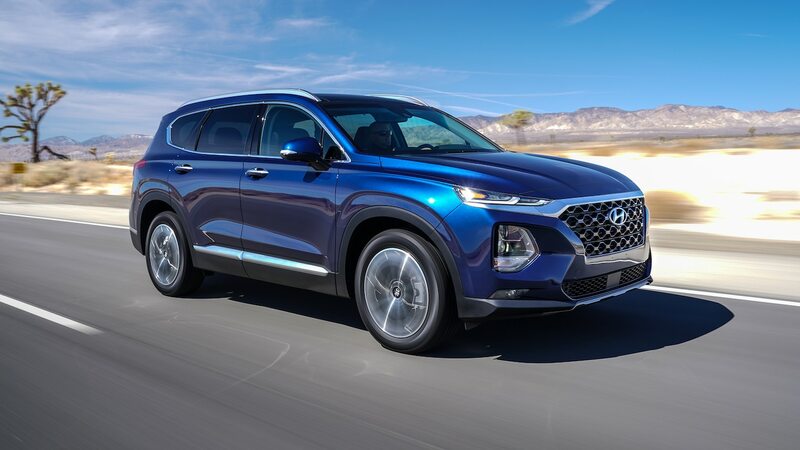 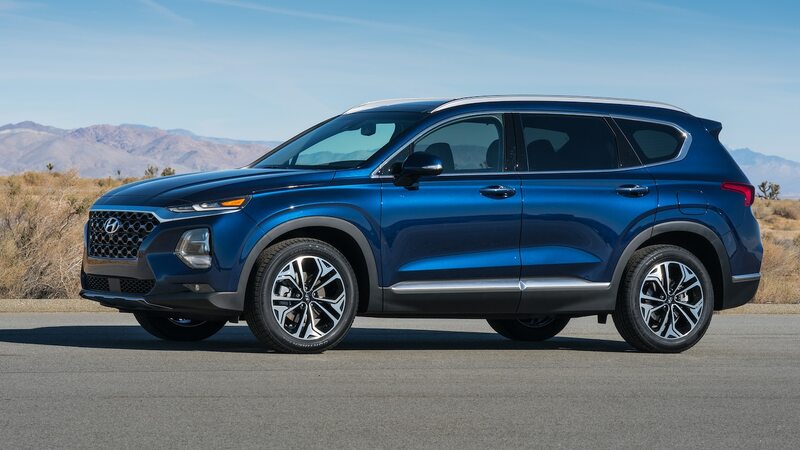 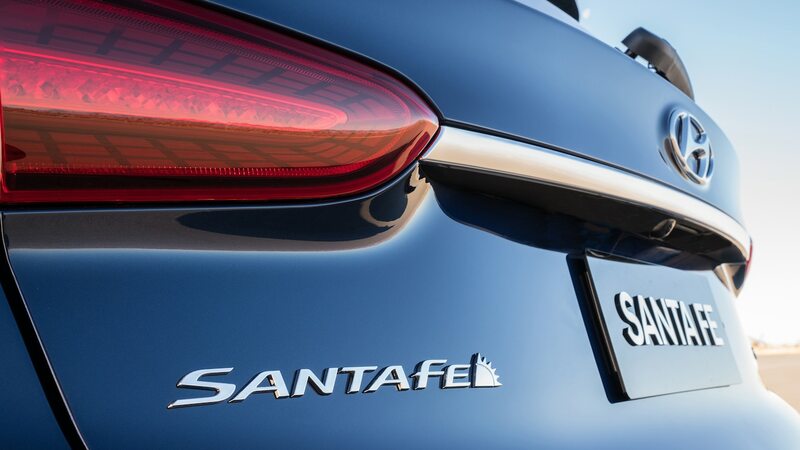 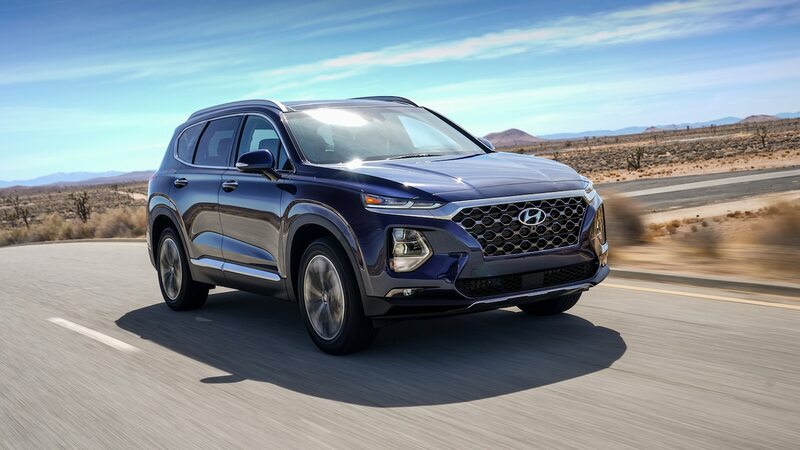 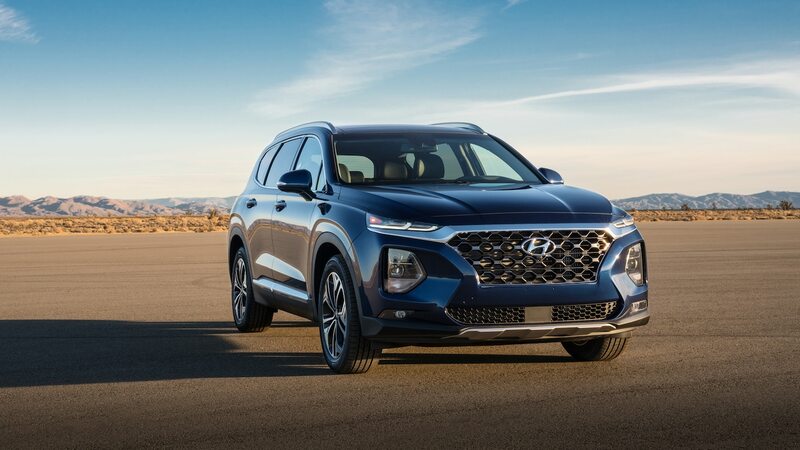 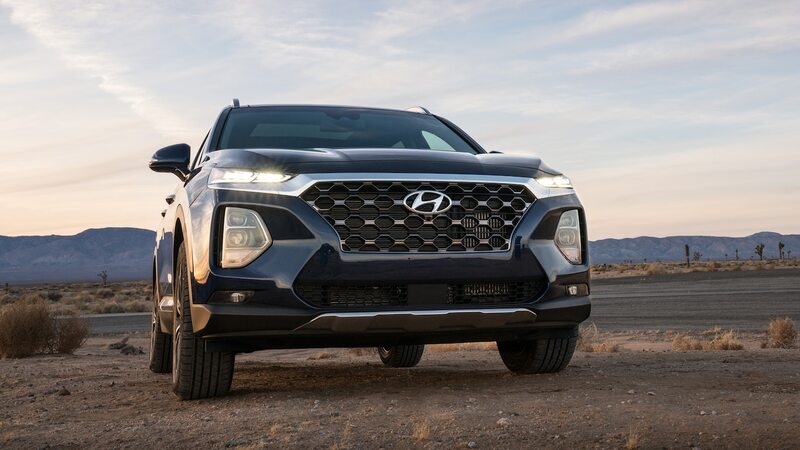 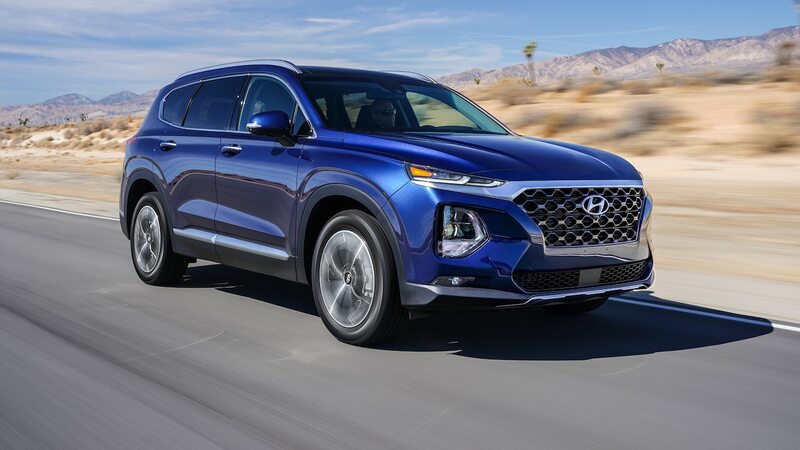 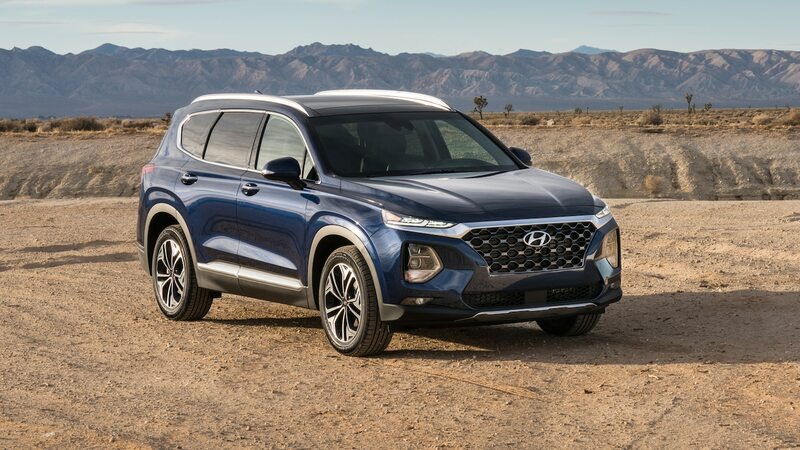 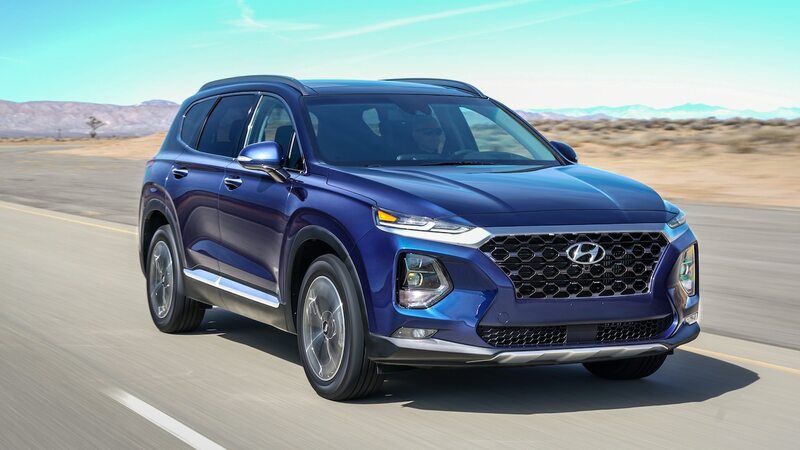 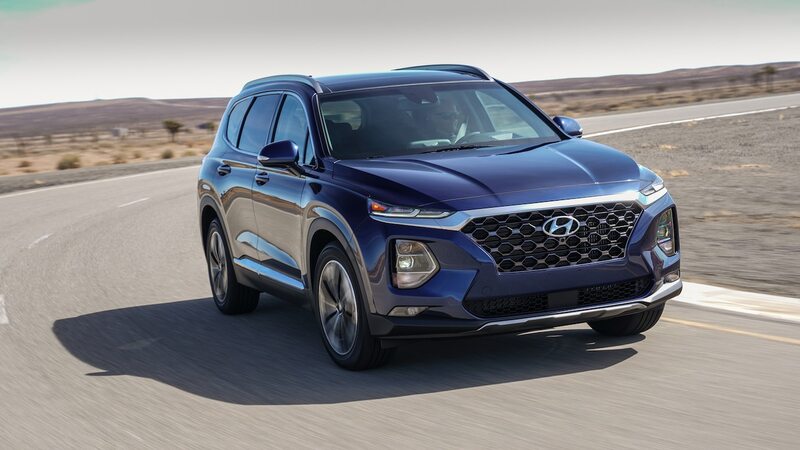 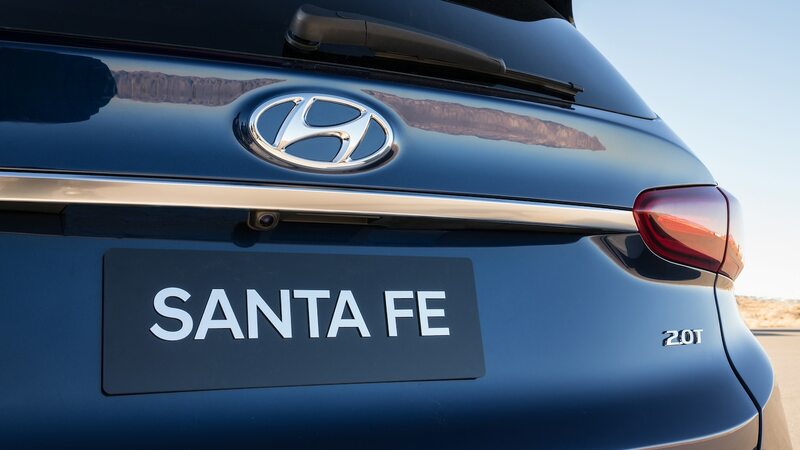 Value remains a Hyundai strong suit, with prices ranging from $30,345 USD to $35,345 USD for the 2.4-liter Santa Fes and from $35,245 USD to $39,845 USD for the 2.0-liter variants—all of which can be had with front- or all-wheel drive. 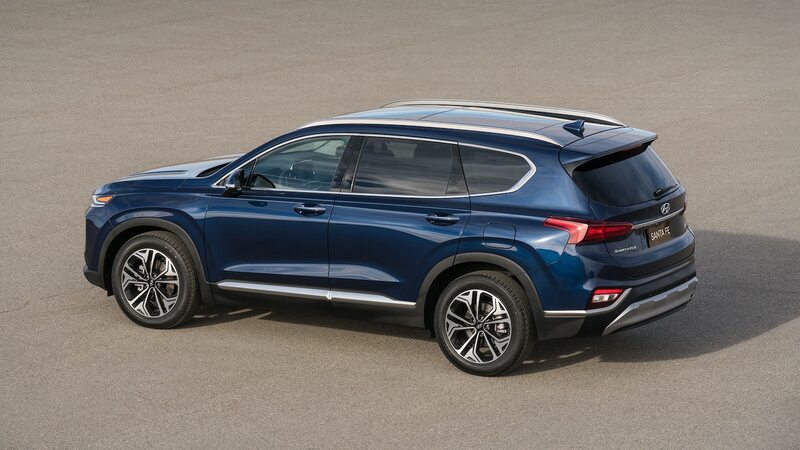 By comparison, Murano base prices run from $32,315 USD to $46,175 USD while Edges’ span from $36,390 USD to $43,450 USD. 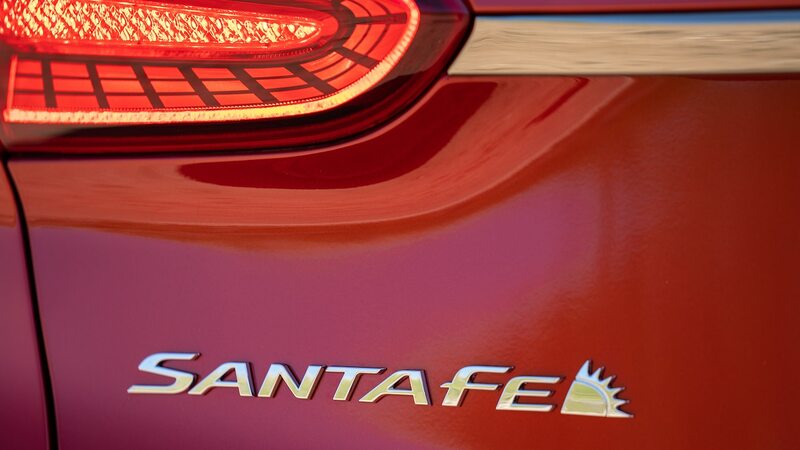 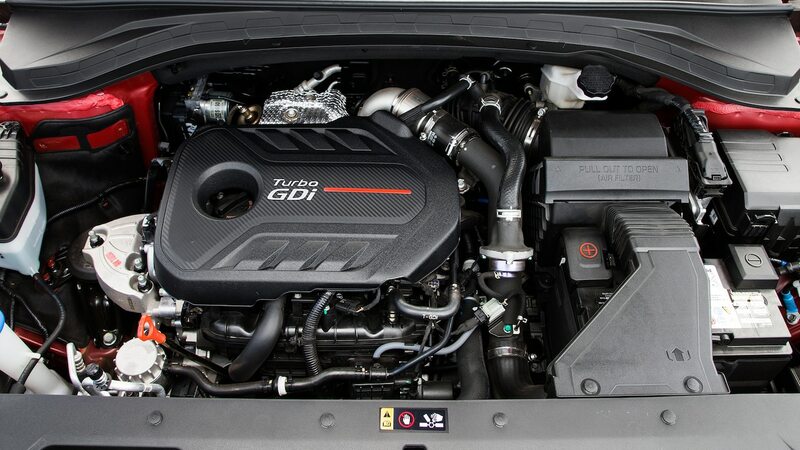 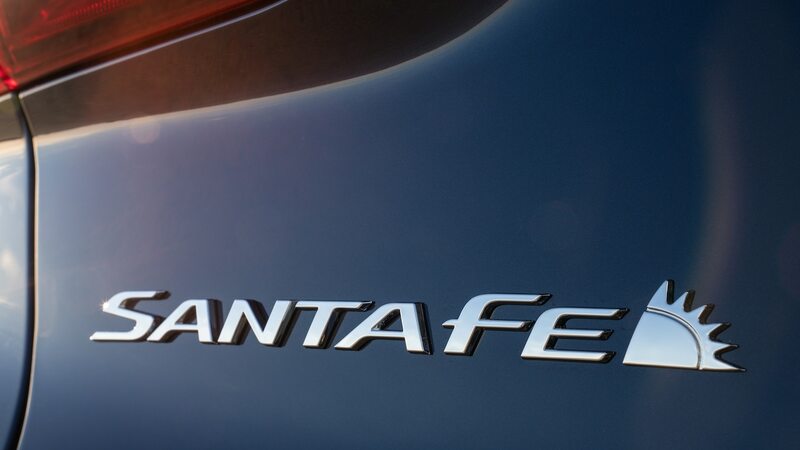 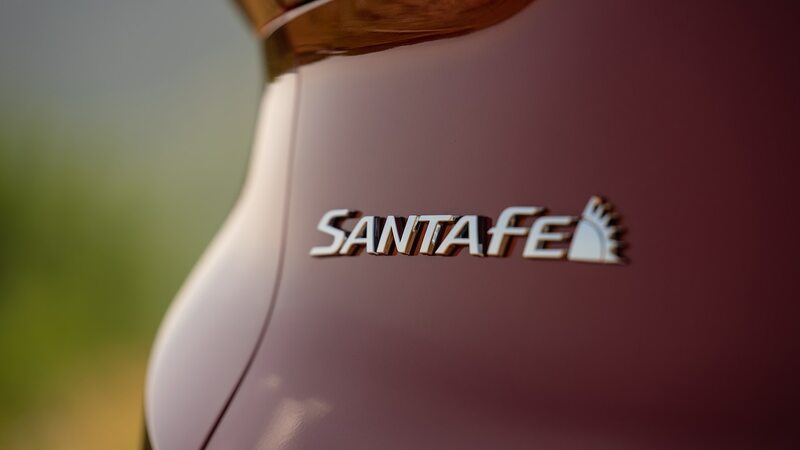 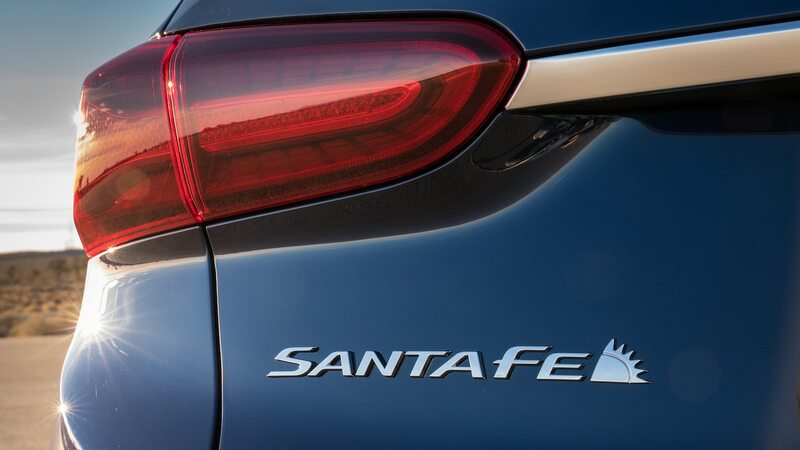 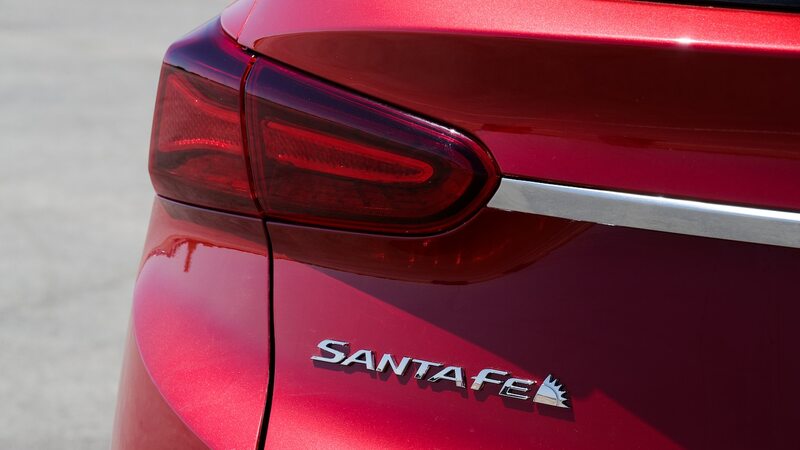 Just be prepared to be a little patient in your Santa Fe turbo when the mercury soars.